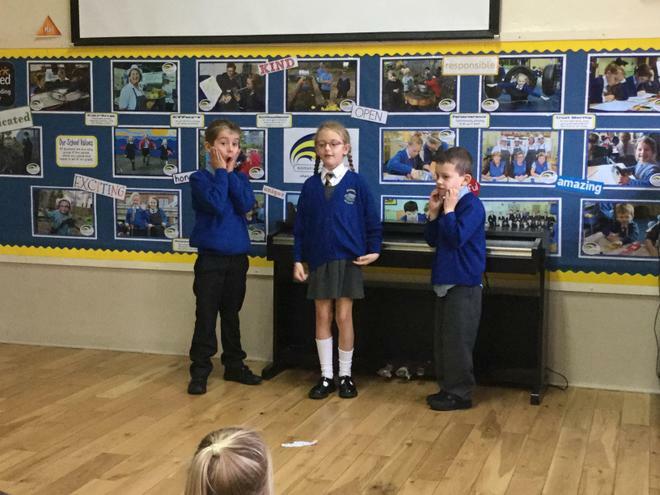 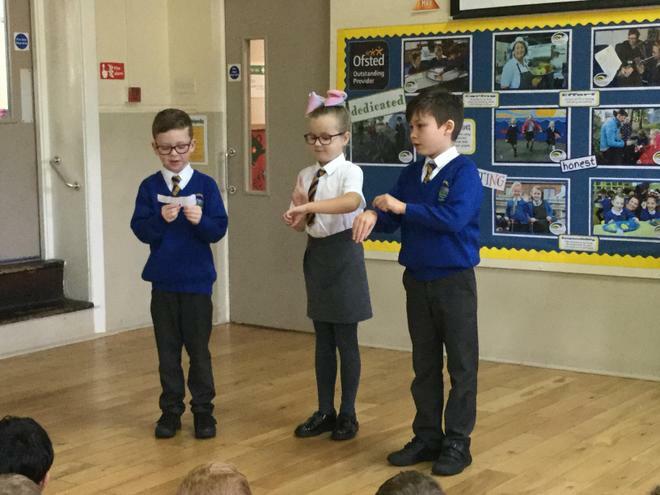 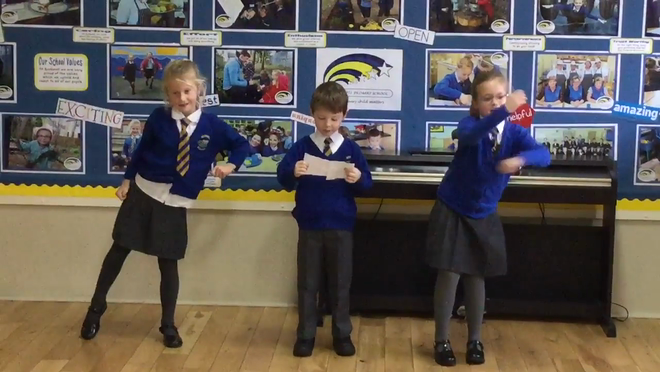 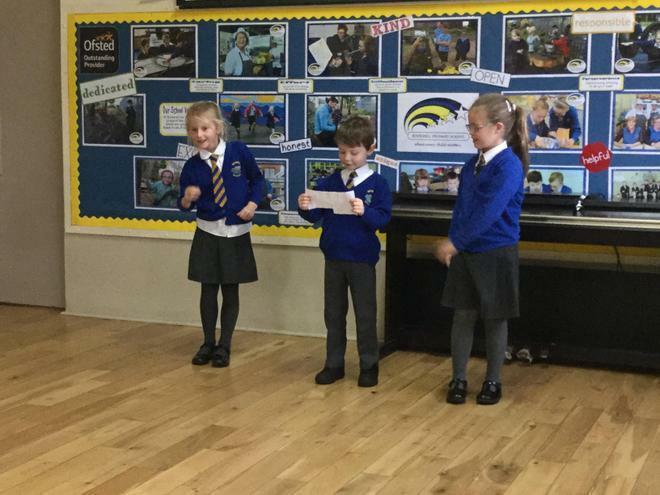 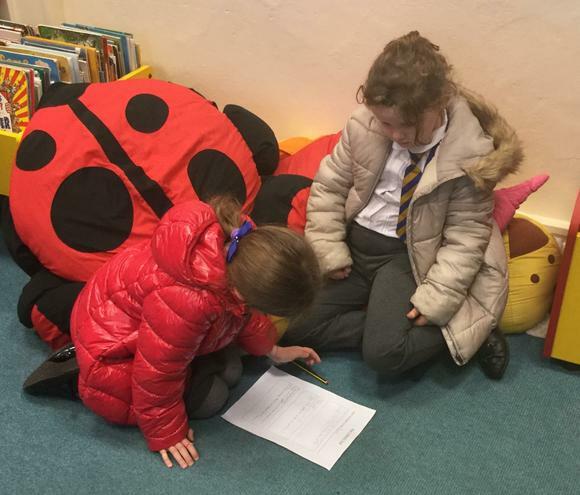 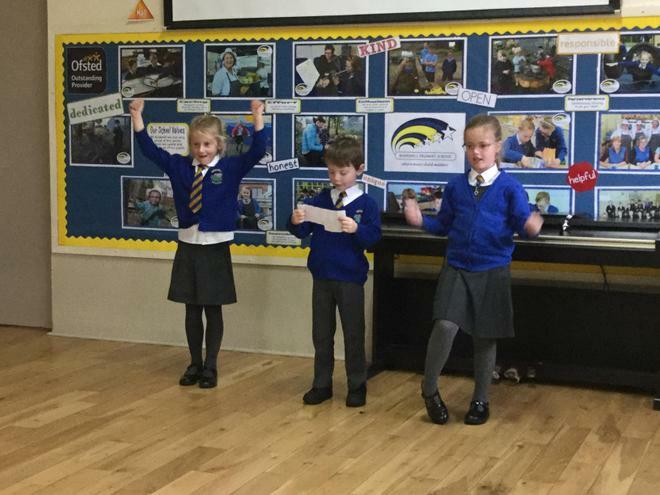 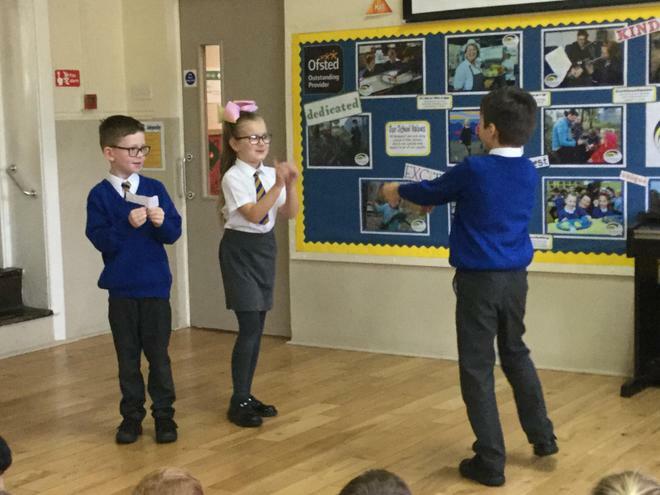 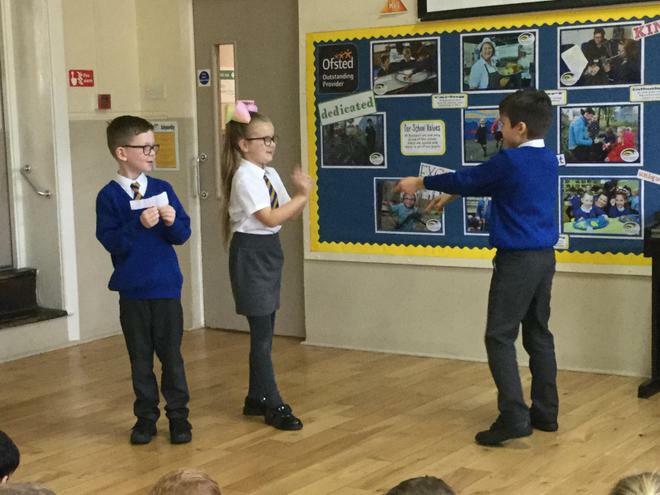 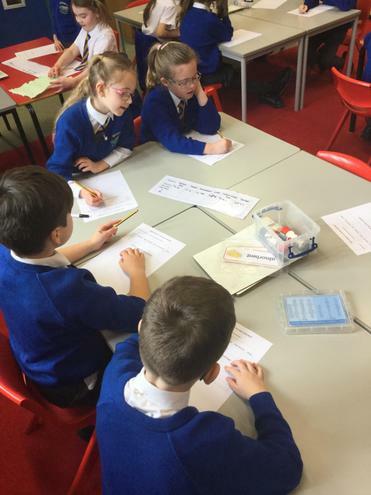 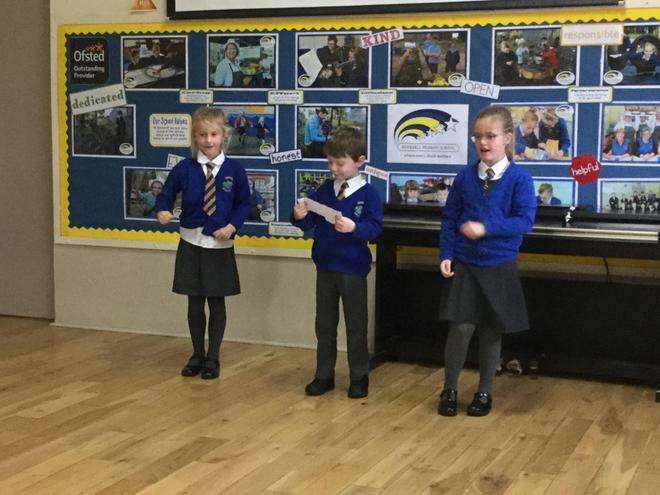 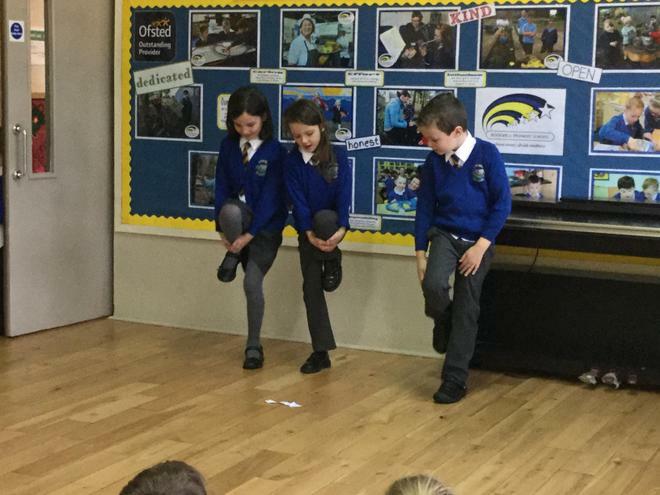 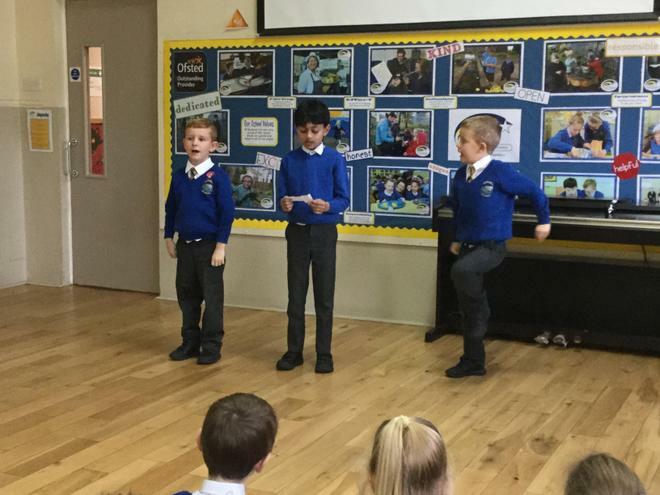 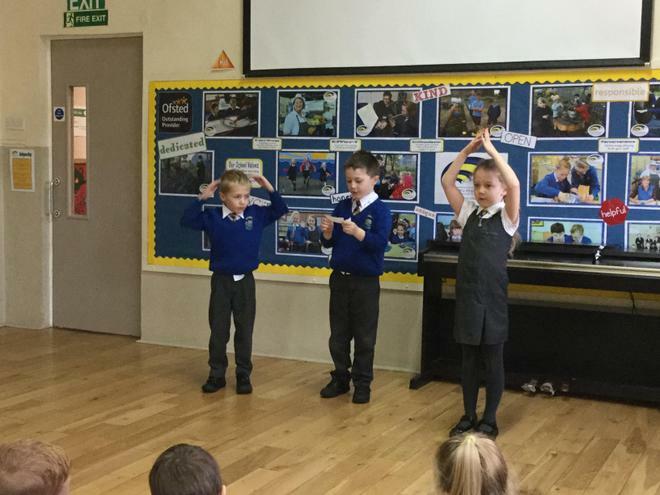 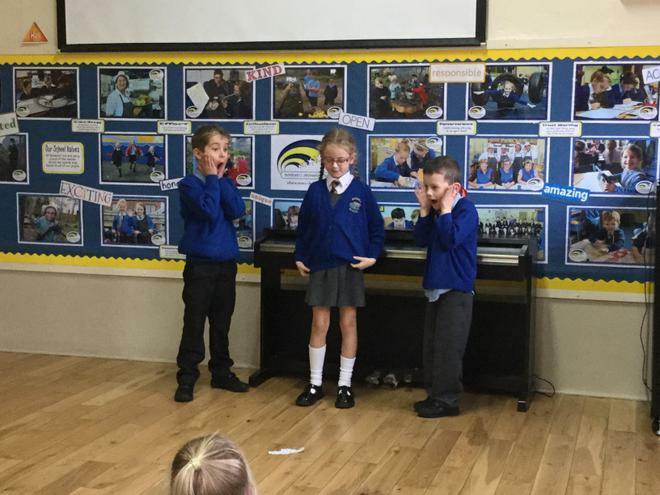 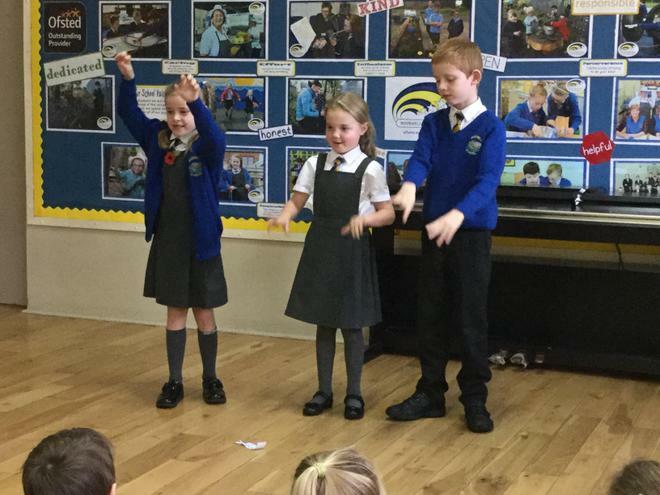 After watching an eye-opening clip about how plastic is damaging our oceans, we read and performed a letter written by a whale who was trying to persuade us humans to stop dumping our rubbish into the oceans. 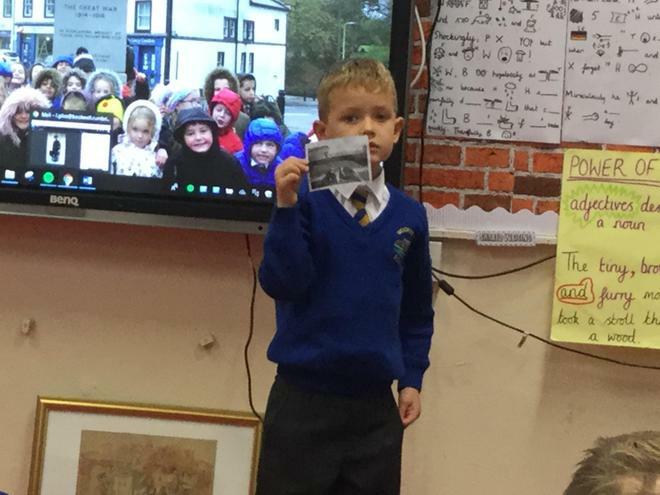 He was very clear in telling us that plastic is indestructible and how much harm it can do to marine creatures like fish and turtles. 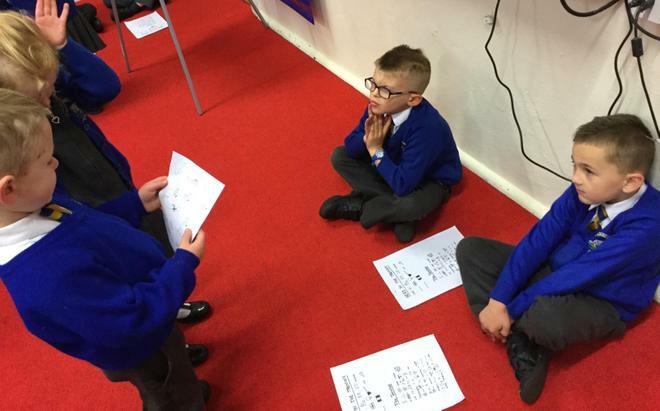 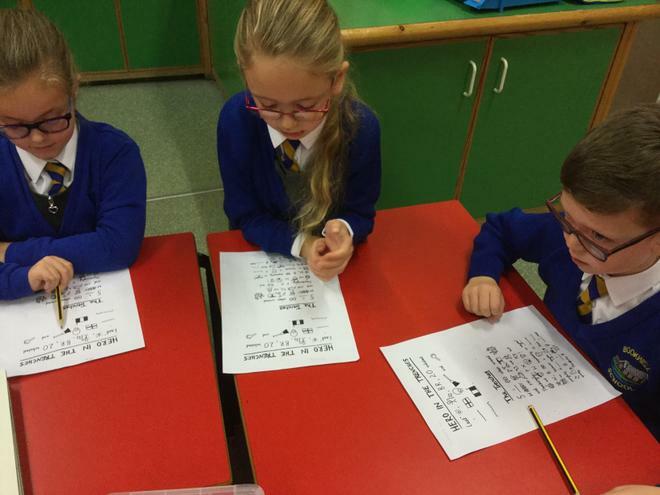 We worked in teams to try and crack a Tarsia Puzzle which involved recognising common and proper nouns and matching them to a clue. 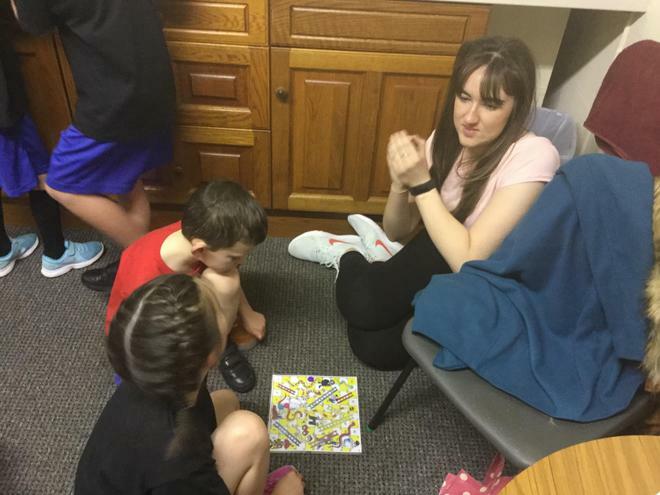 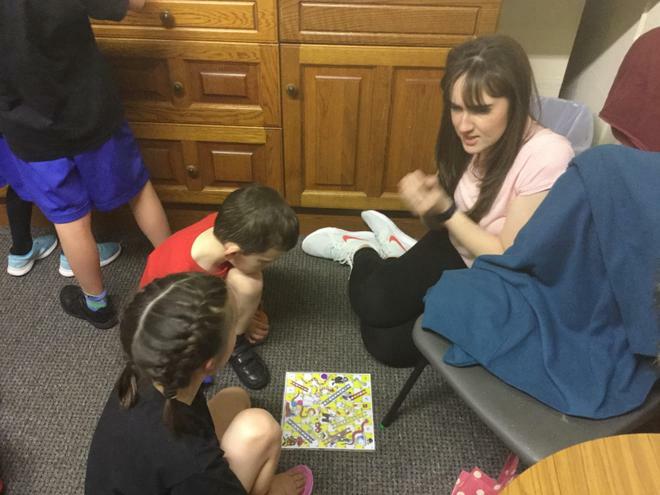 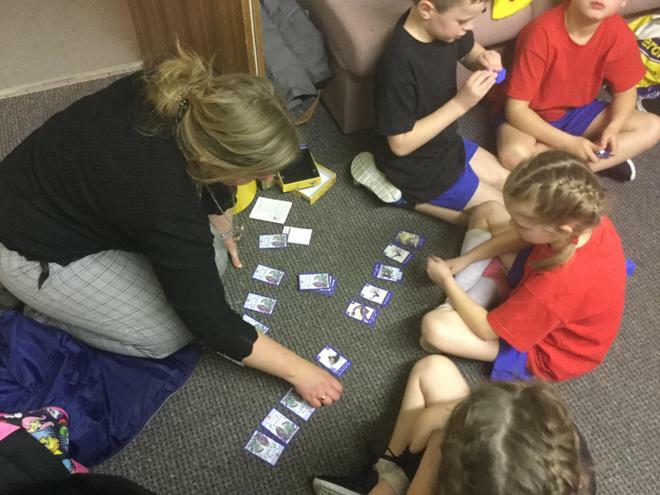 Miss Giles was very impressed with our determination to crack the puzzle and competitiveness to win! 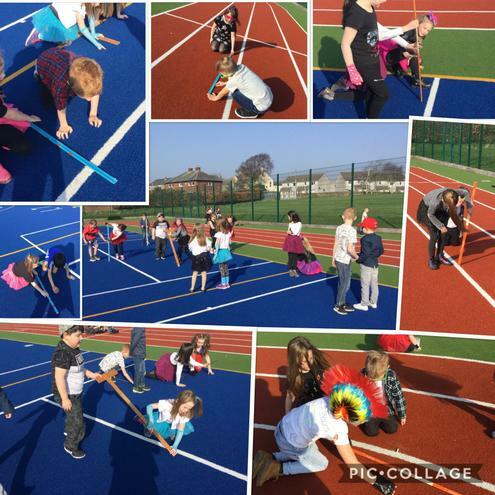 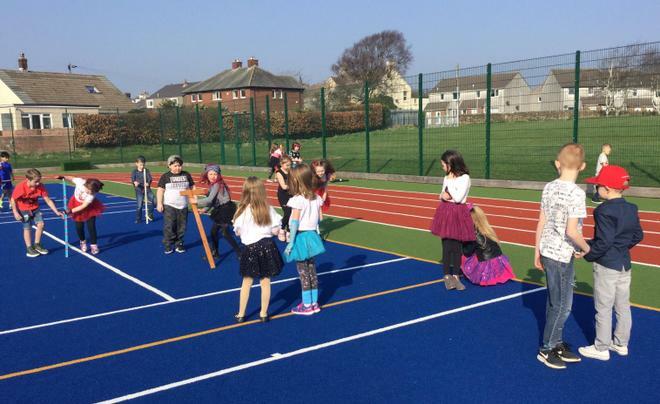 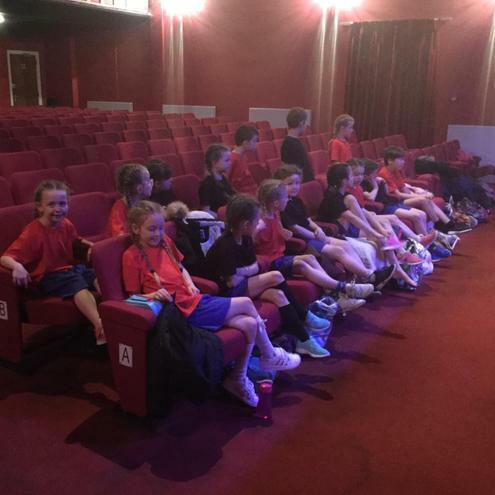 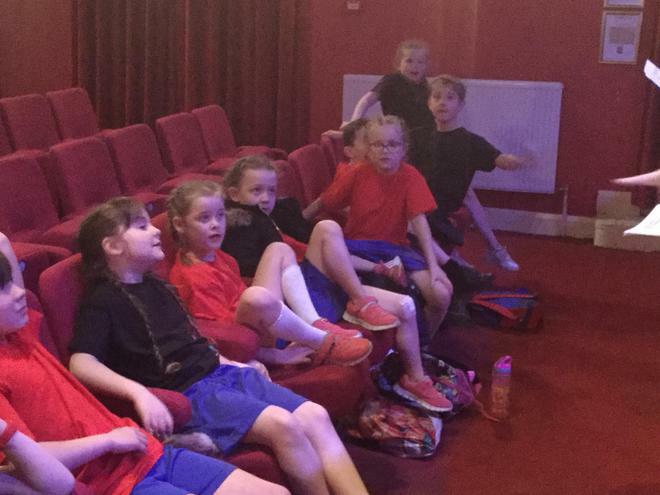 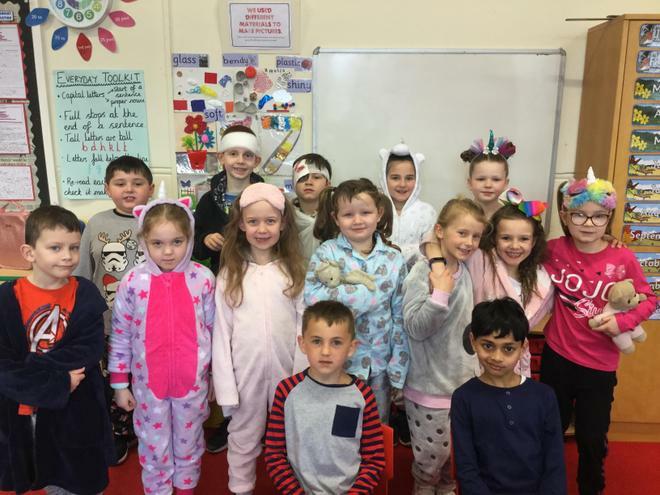 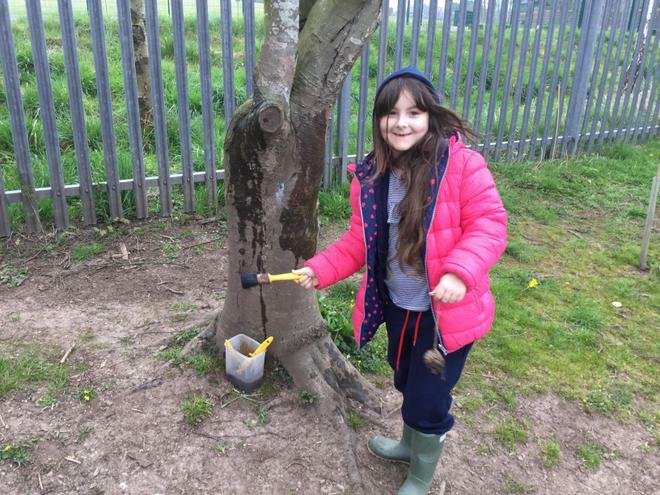 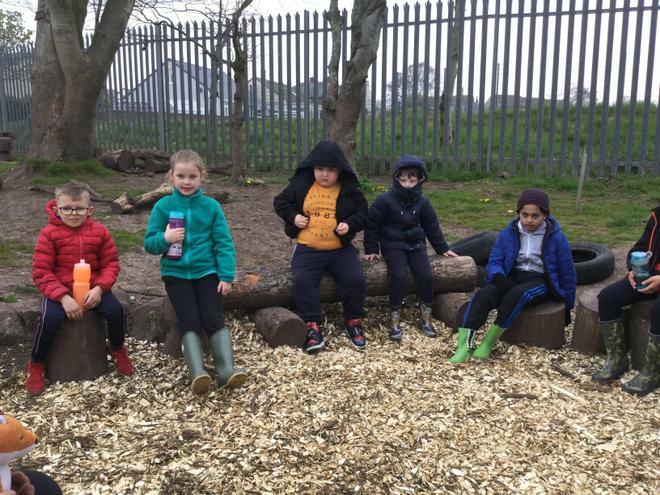 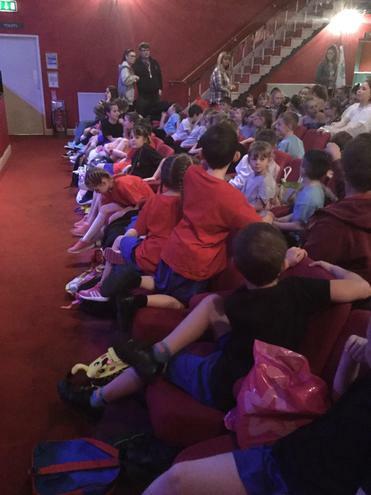 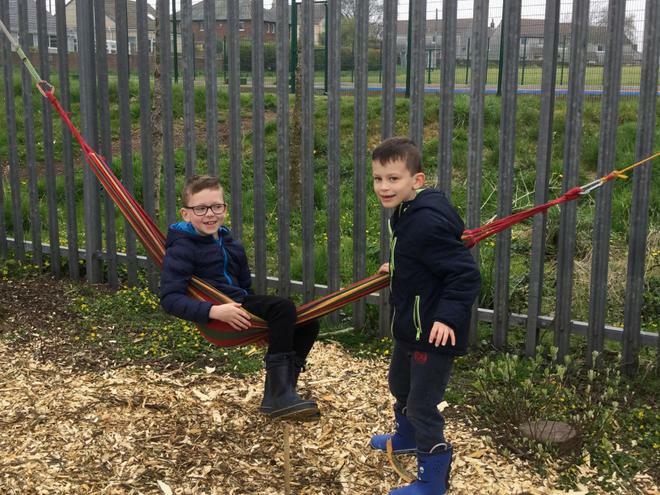 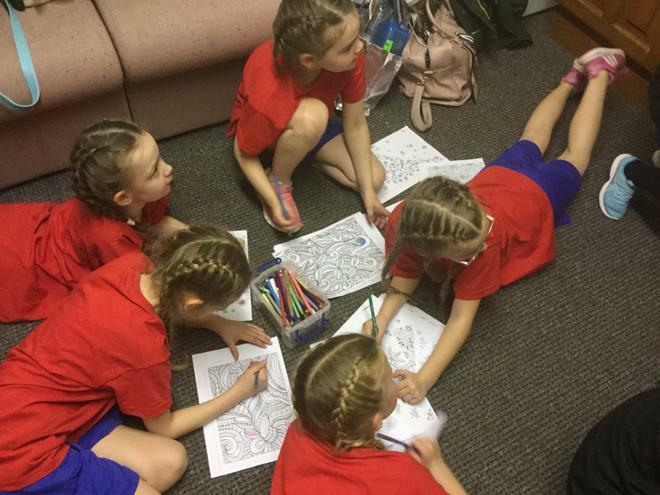 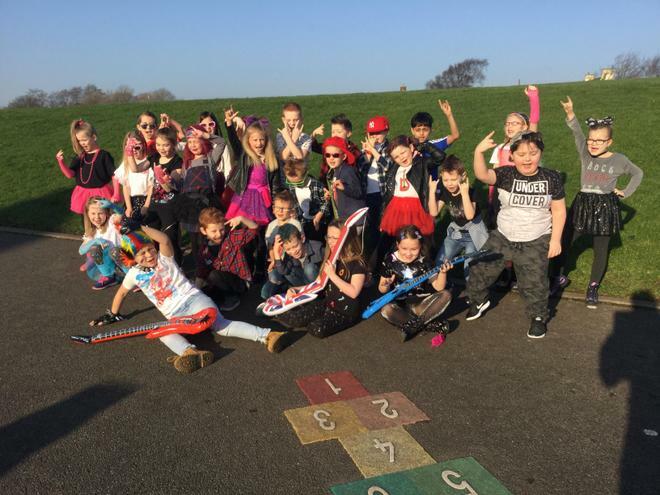 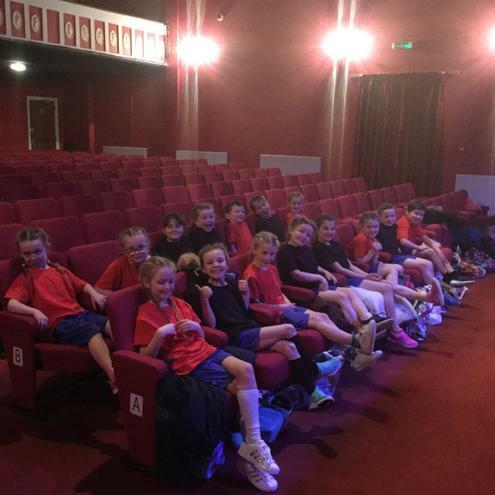 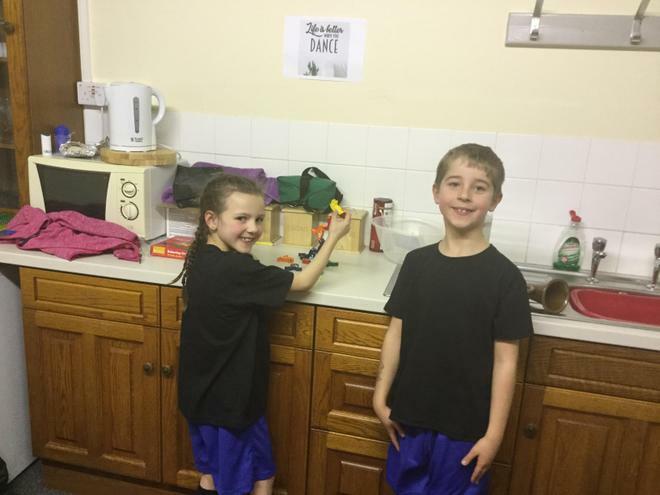 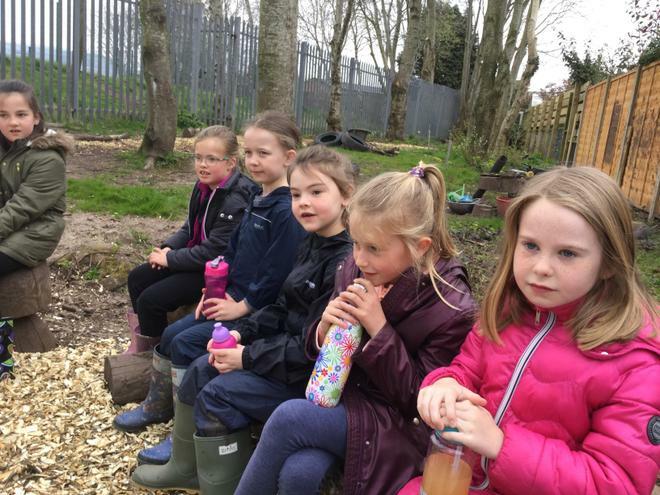 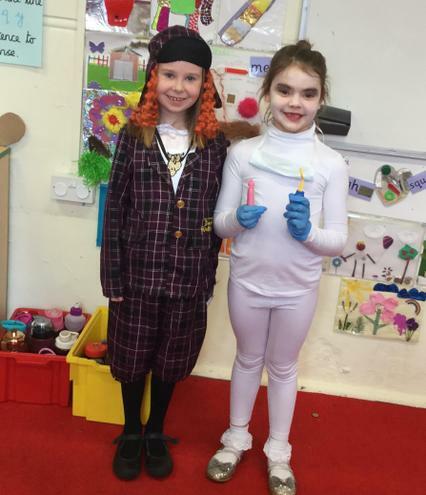 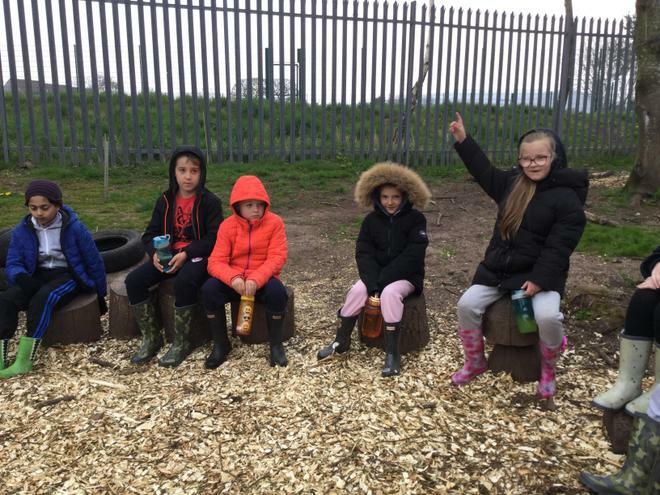 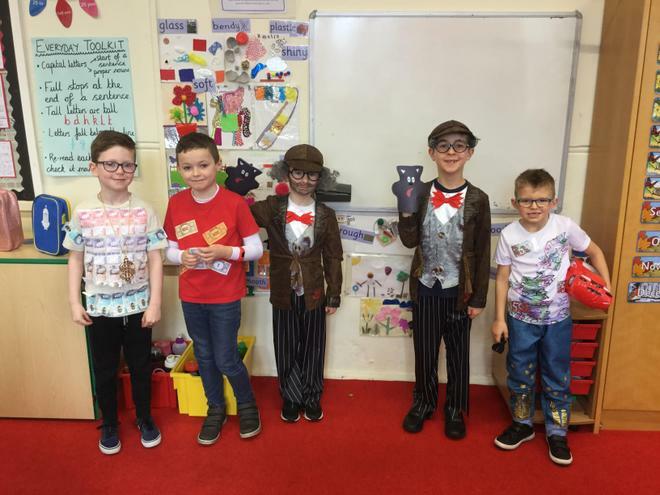 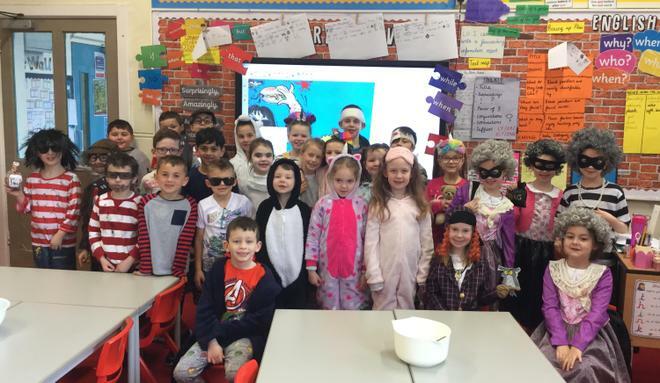 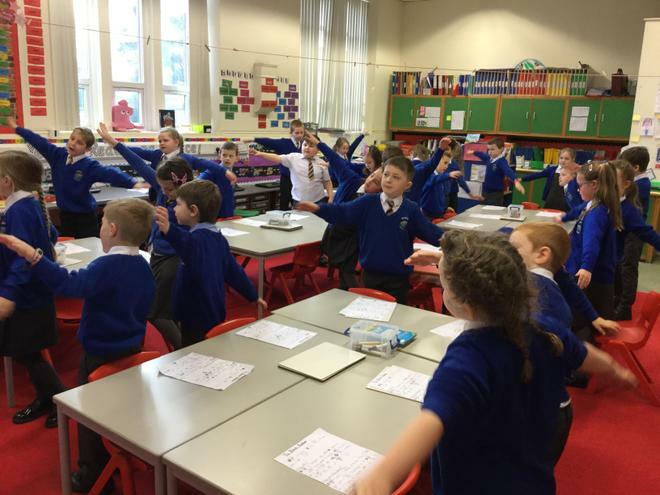 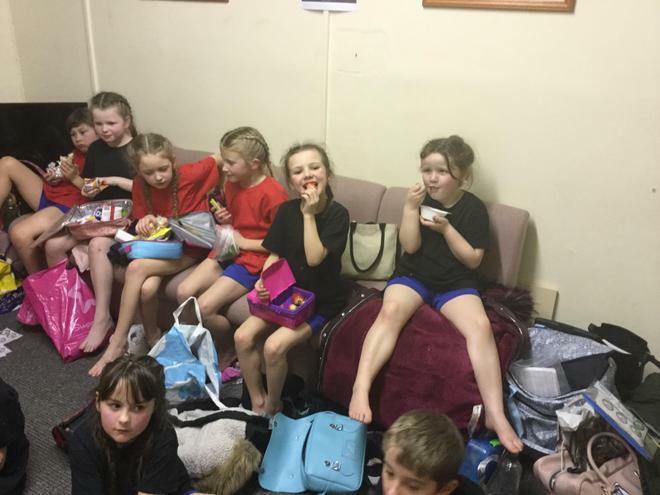 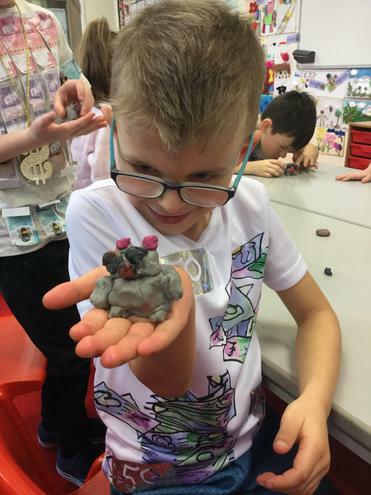 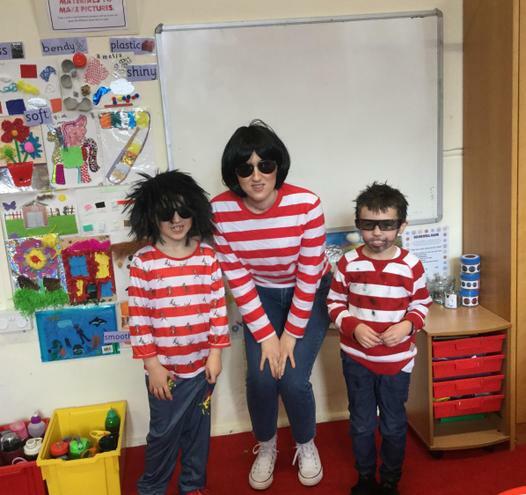 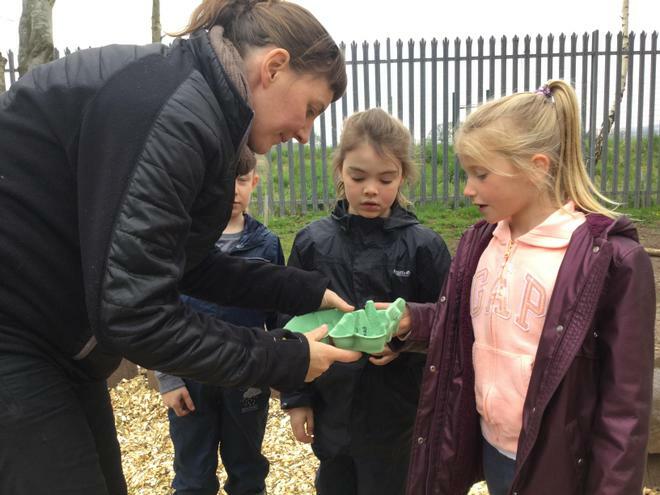 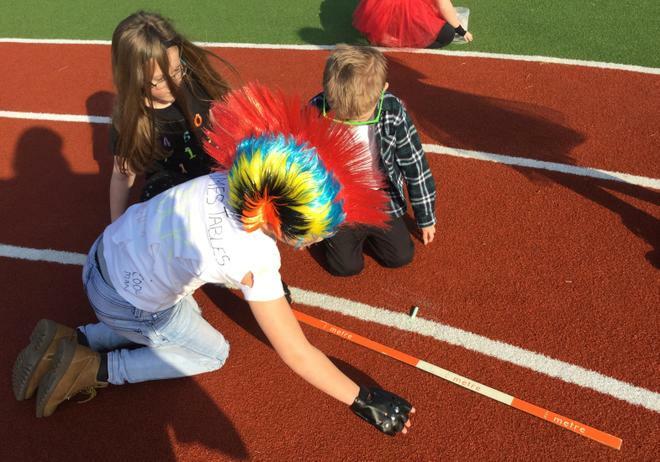 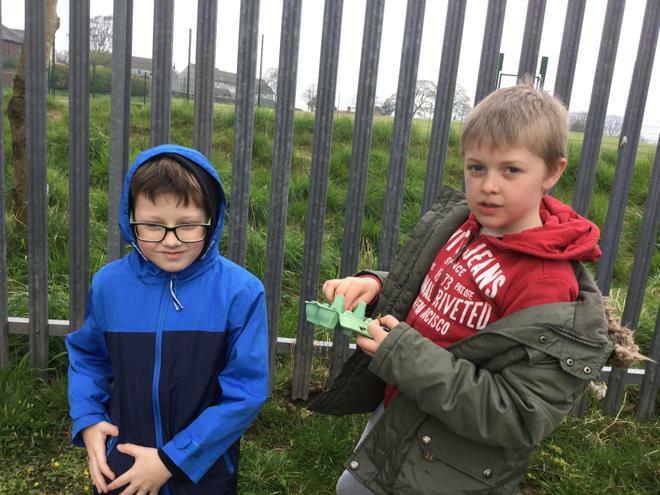 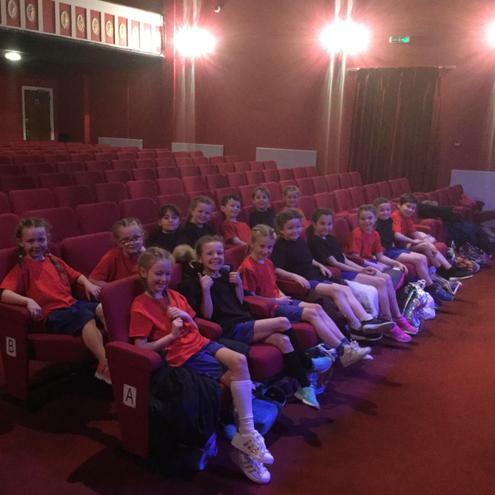 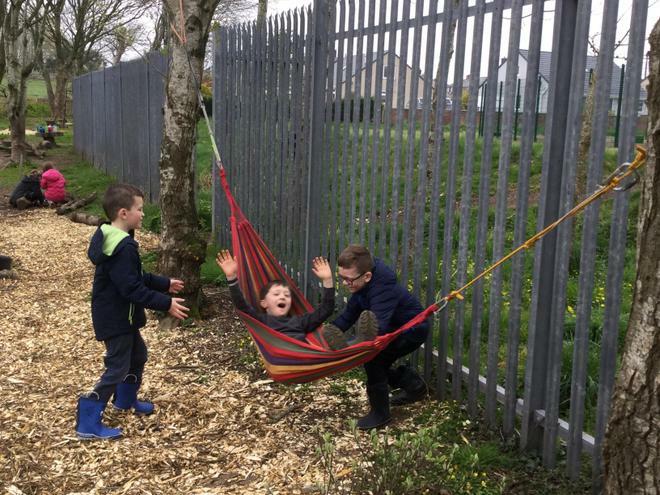 Read what the children thought about this years U-Dance! 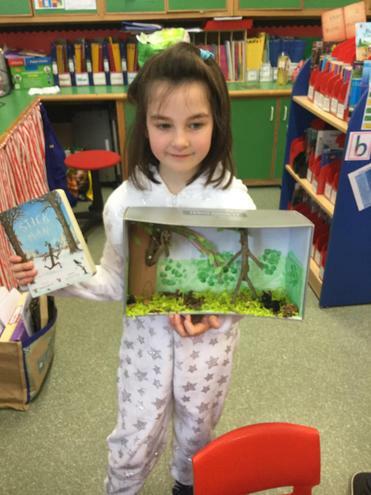 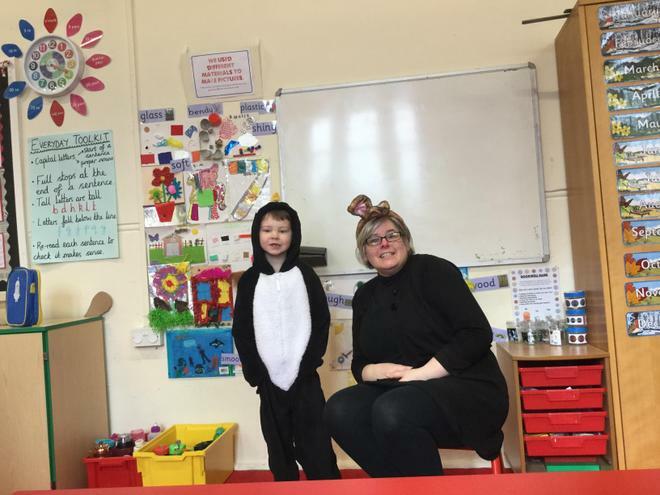 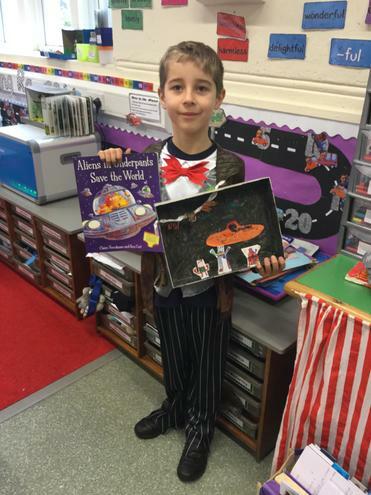 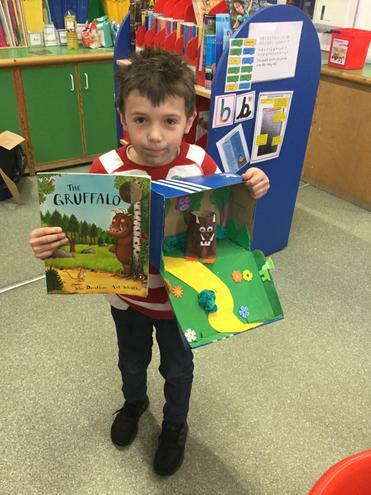 look at our costumes and story boxes some of us made at home! 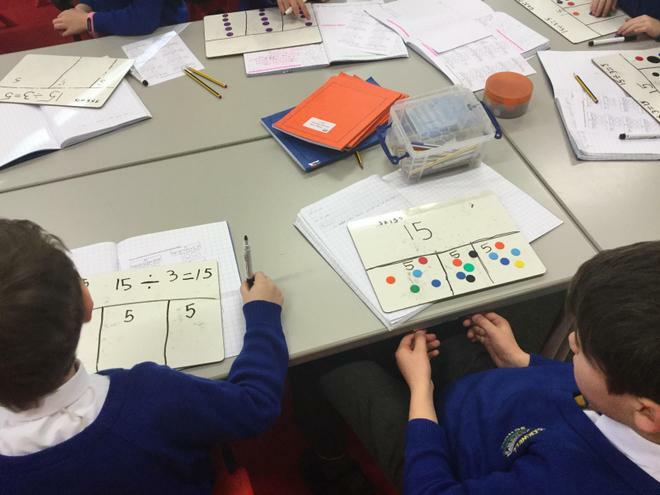 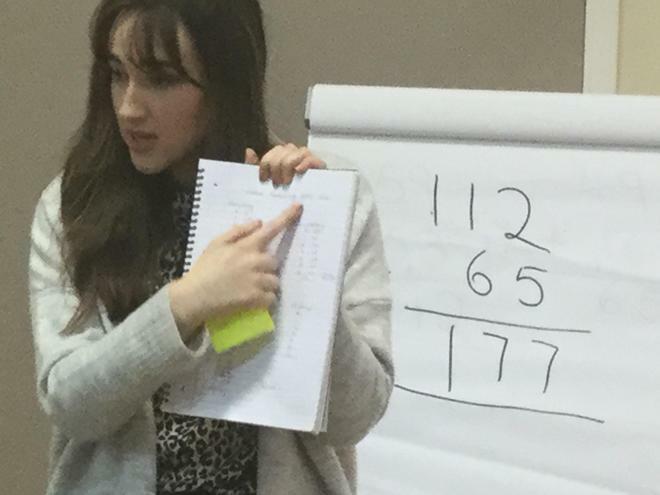 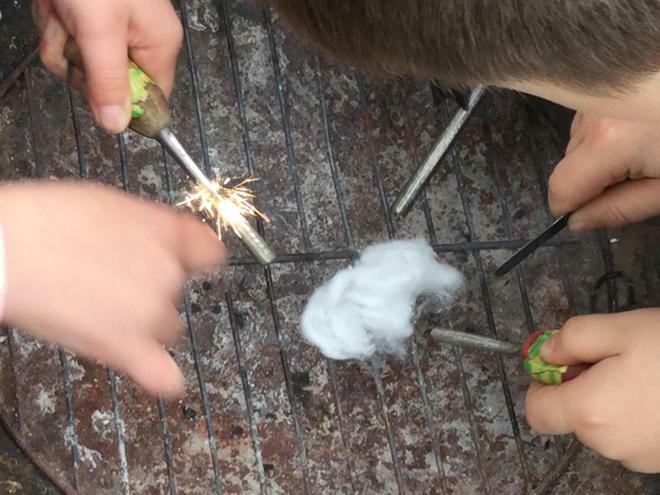 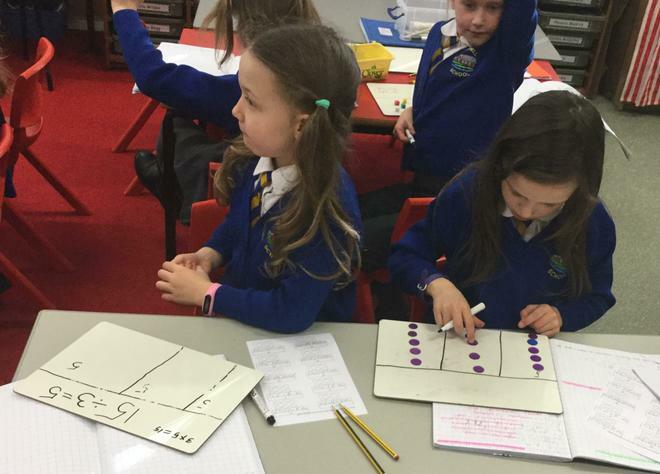 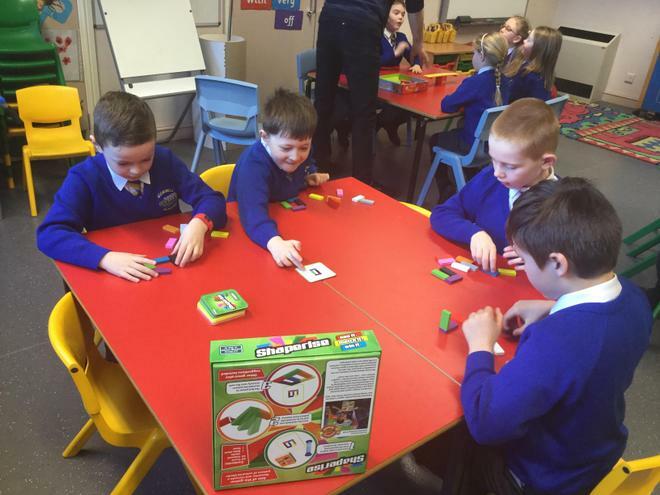 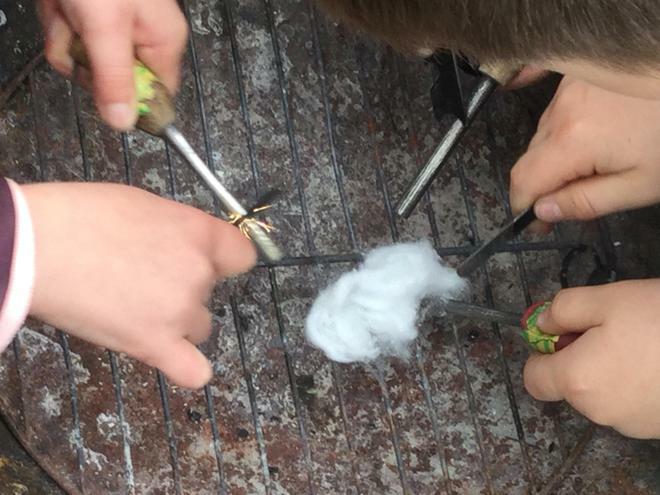 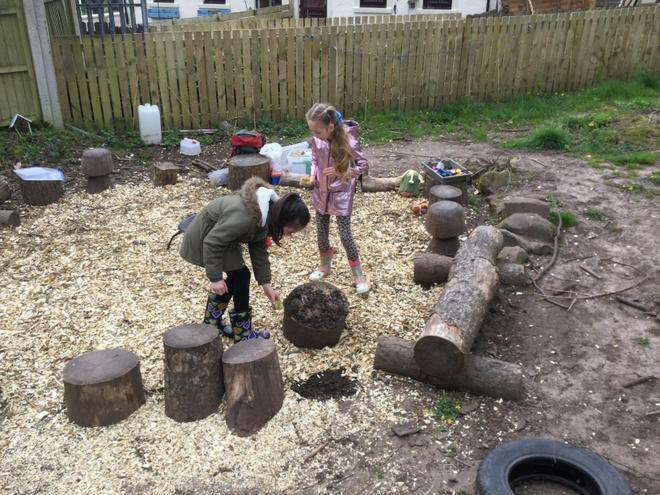 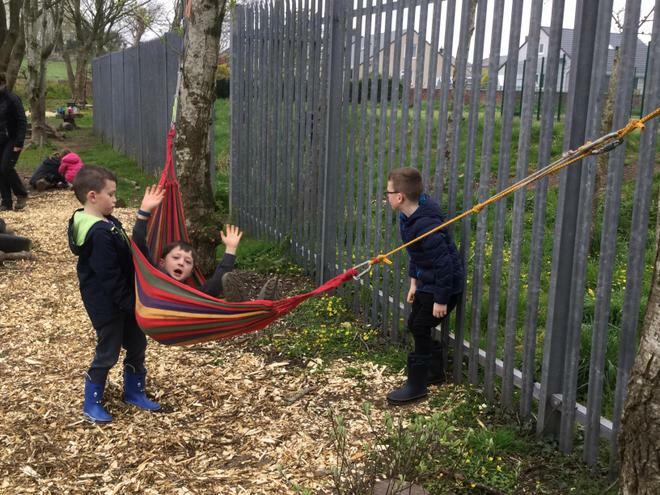 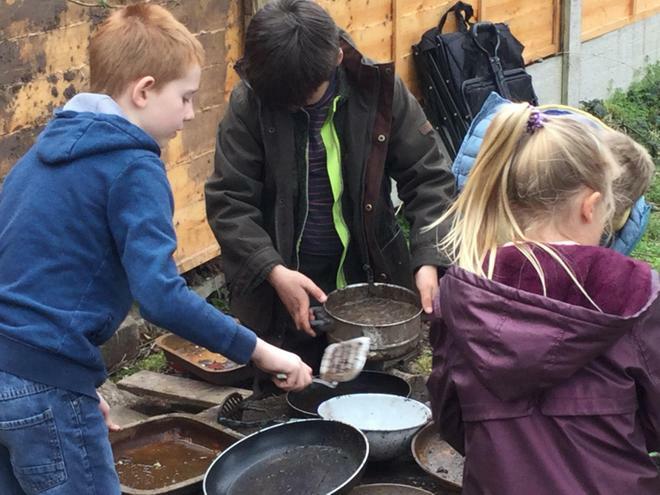 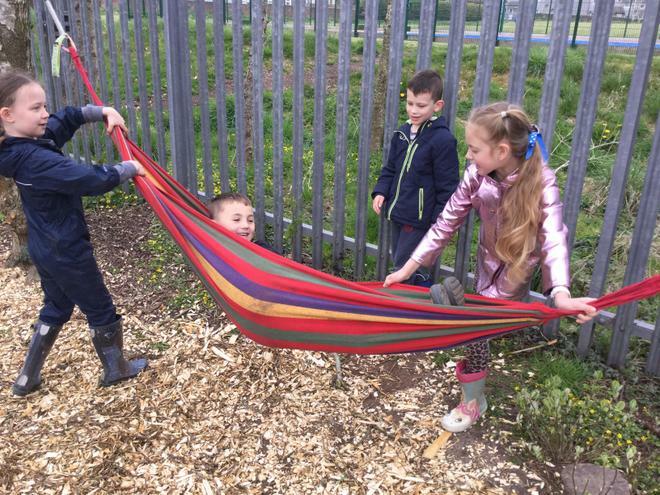 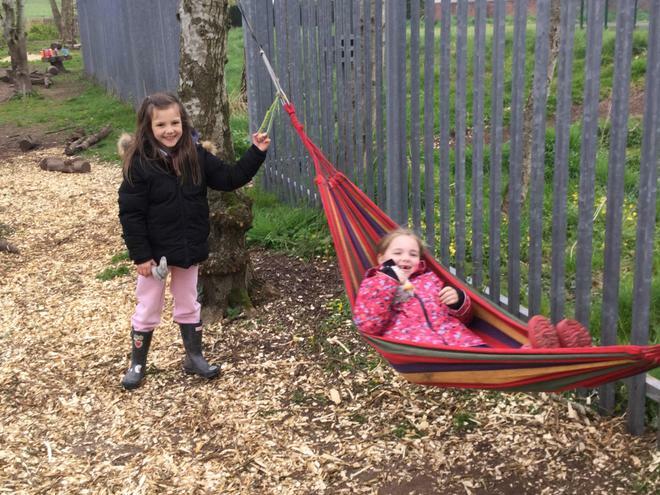 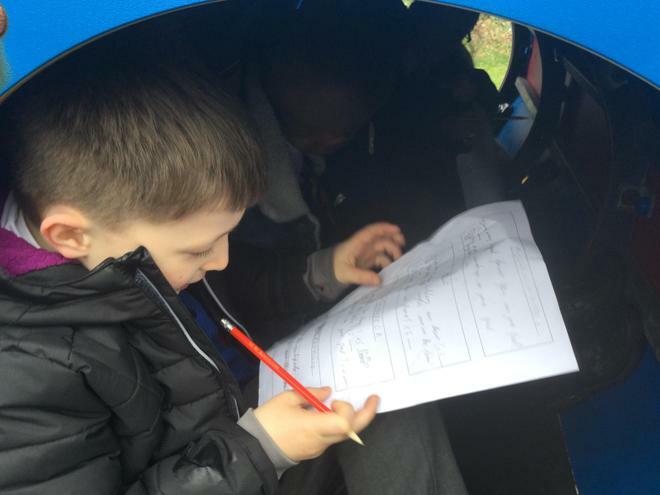 We’ve had a brilliant week learning how maths isn’t always restricted to the classroom, in fact it’s everywhere! 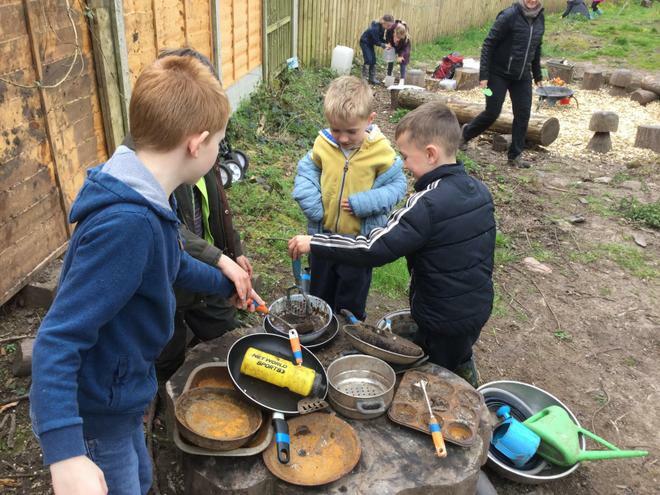 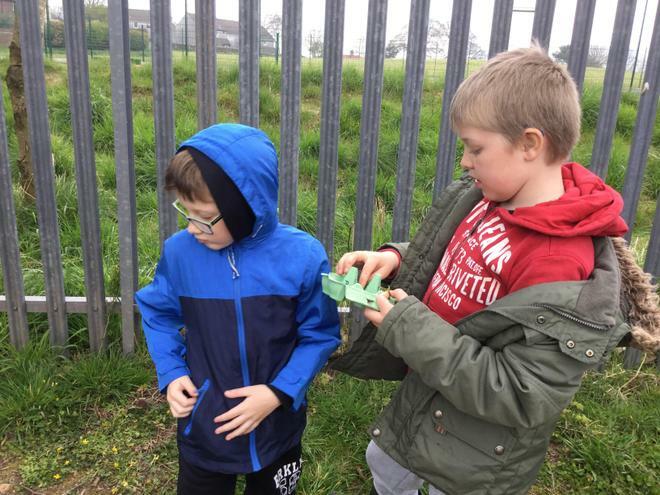 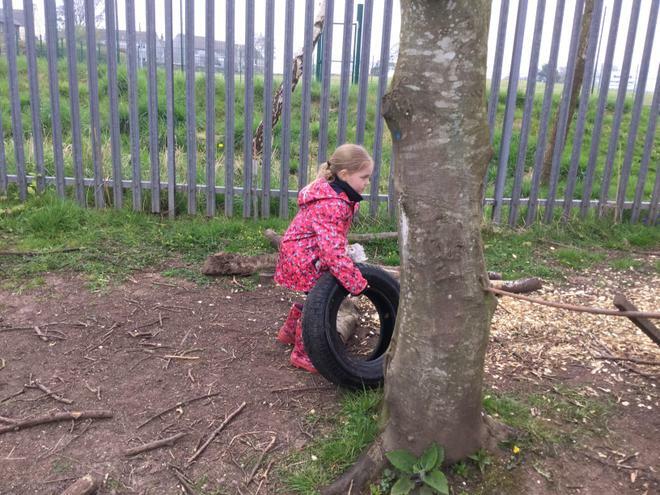 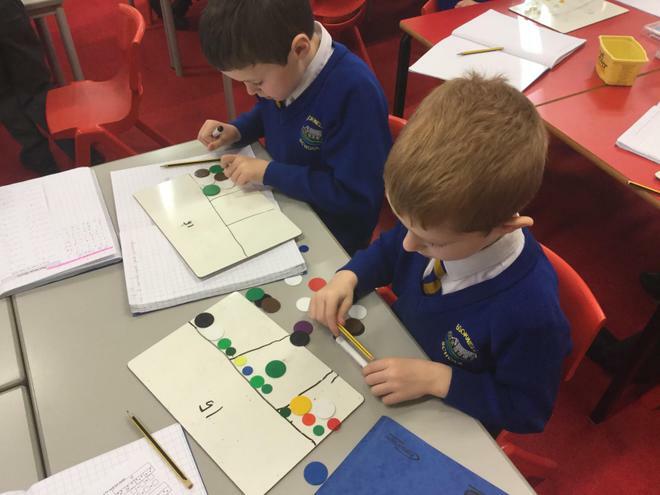 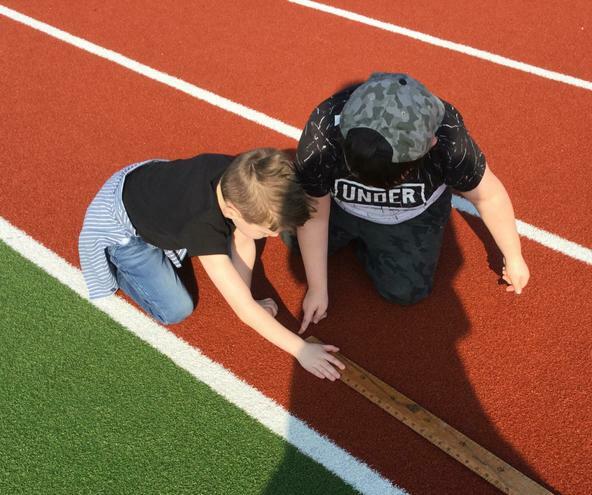 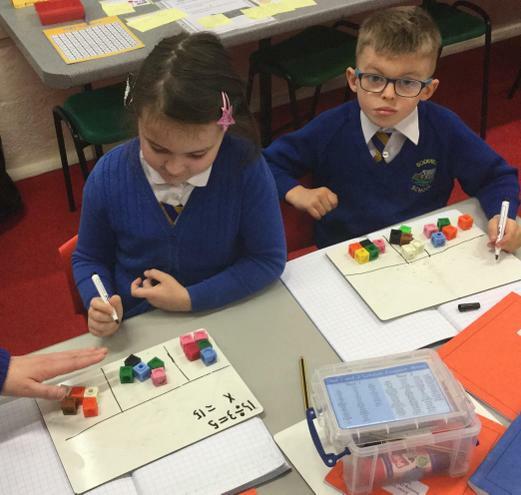 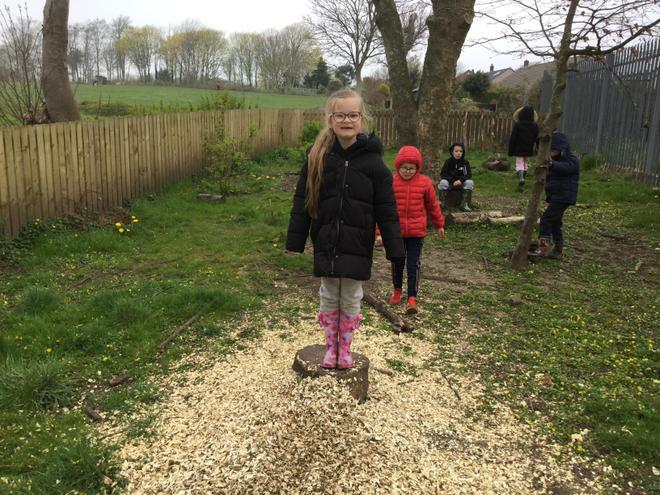 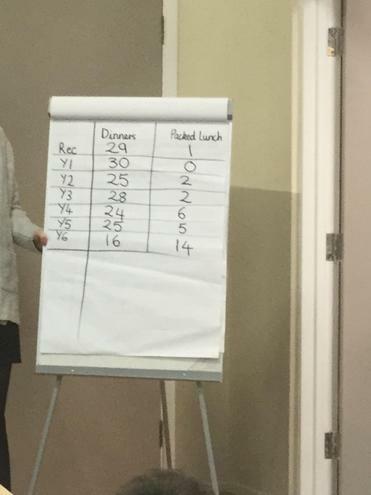 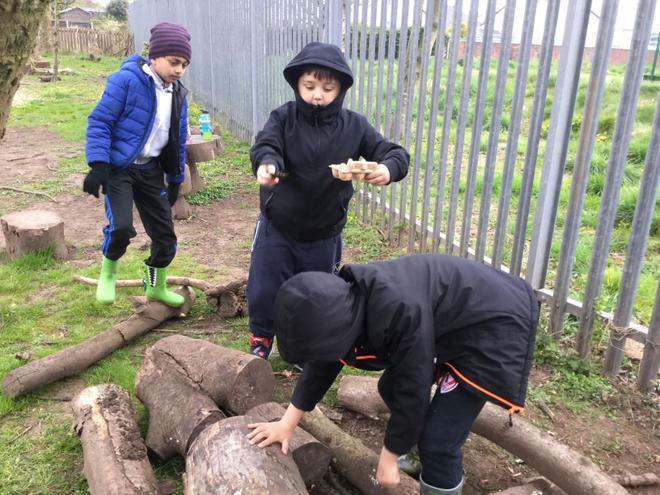 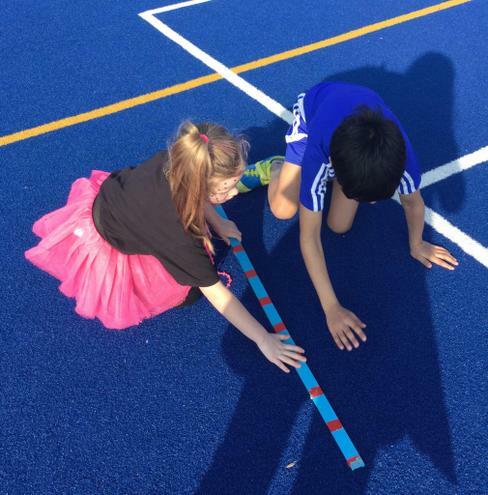 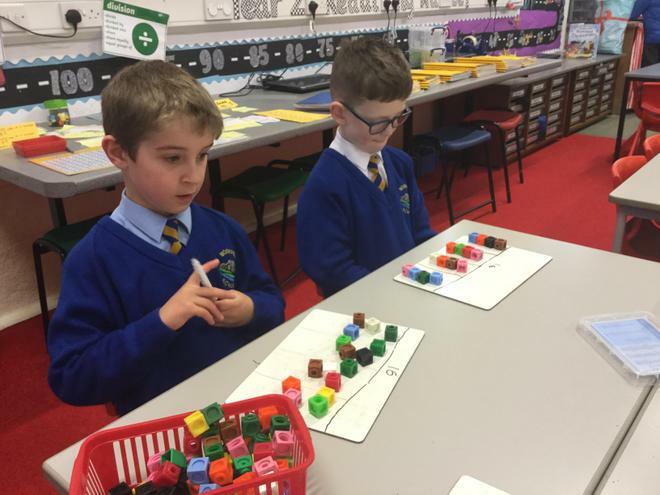 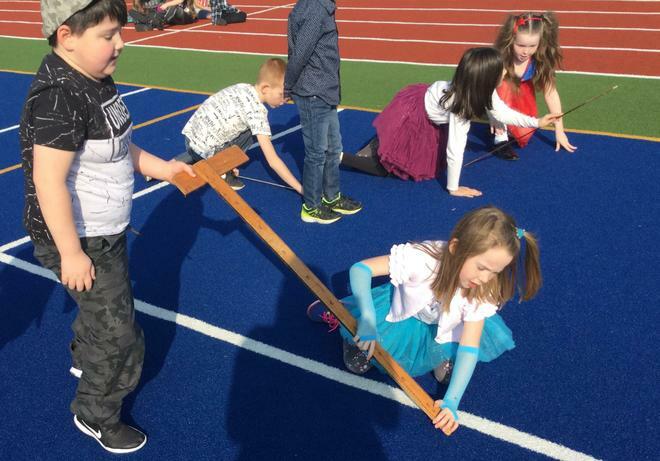 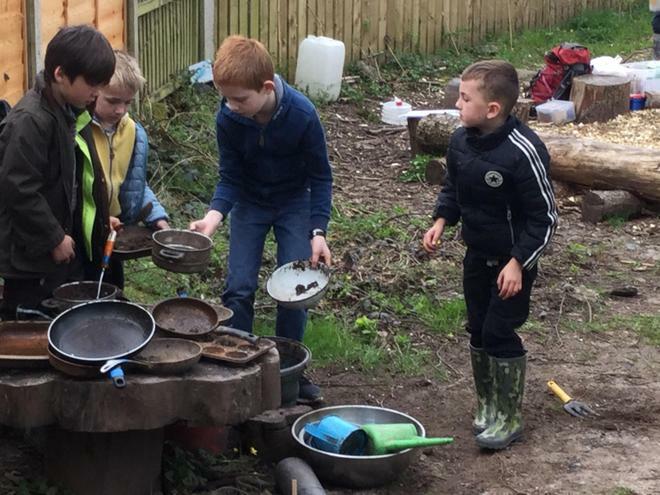 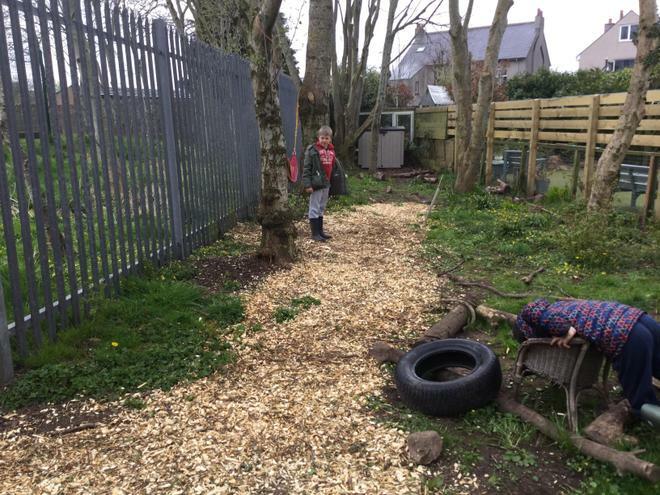 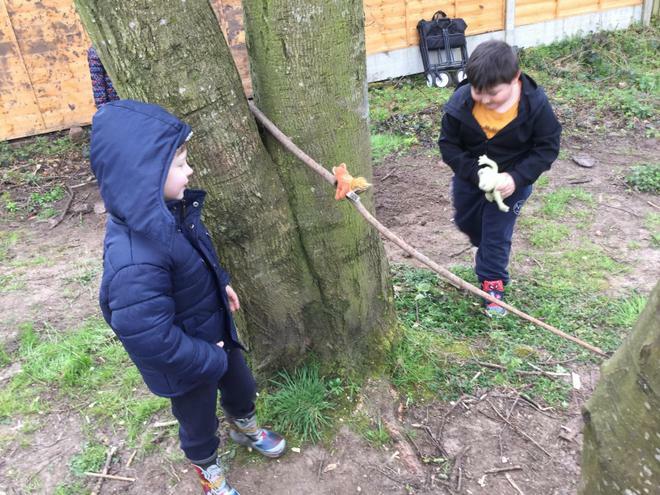 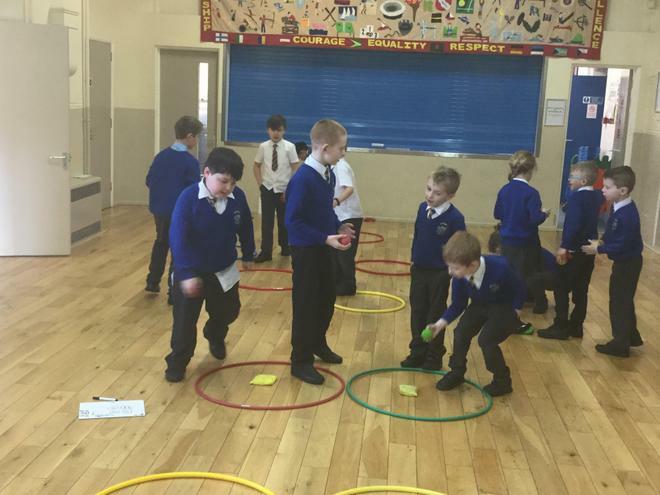 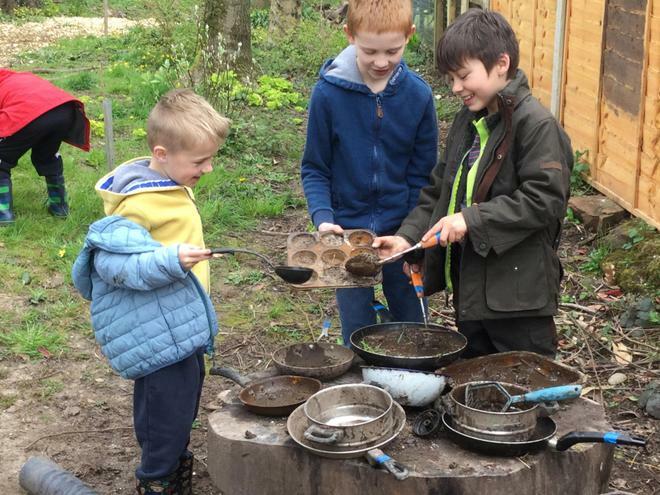 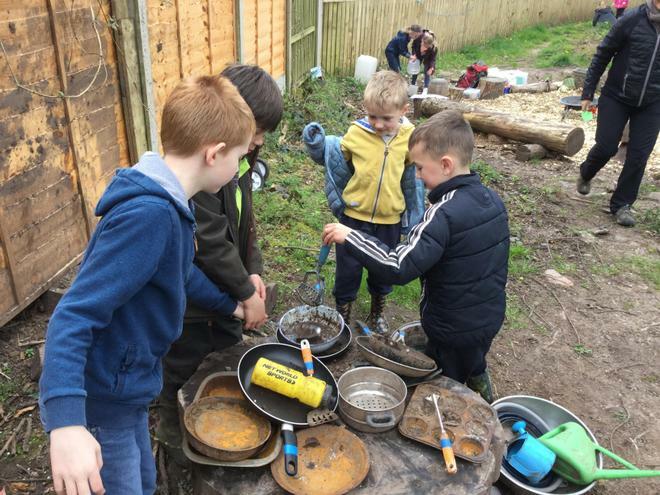 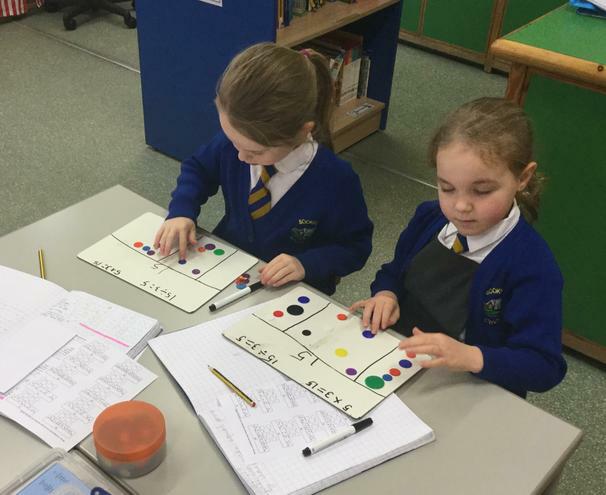 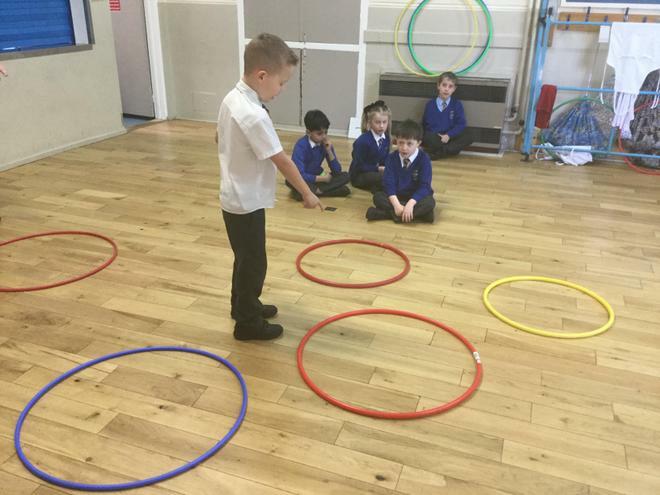 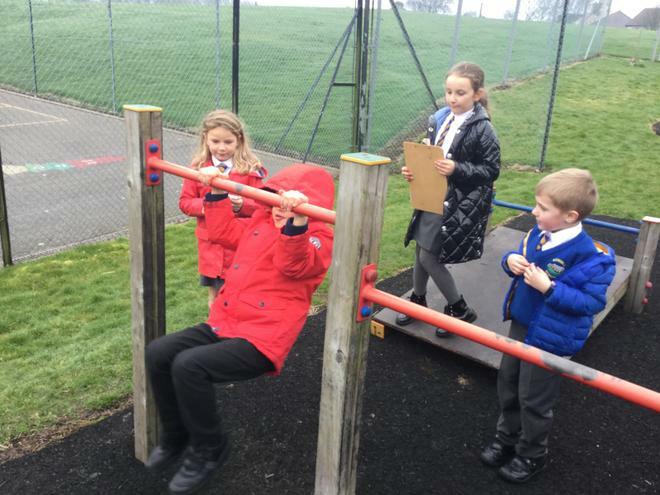 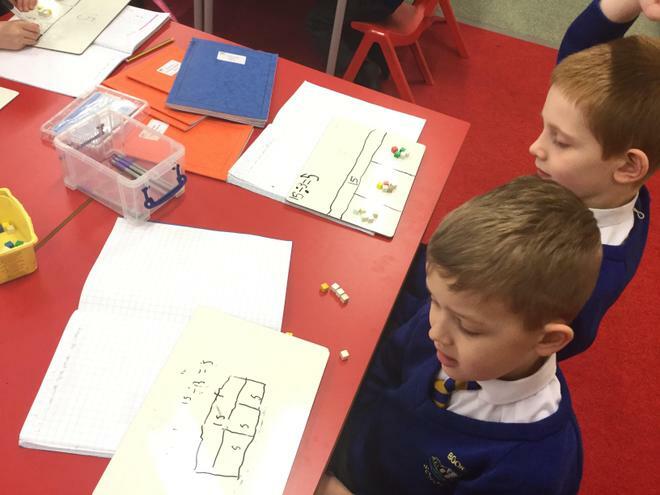 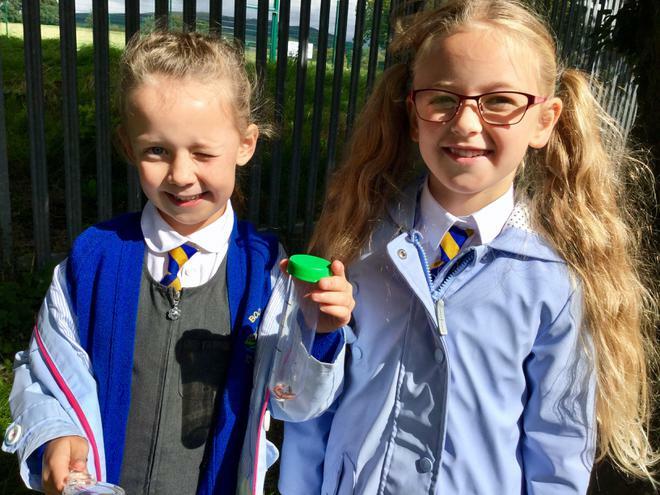 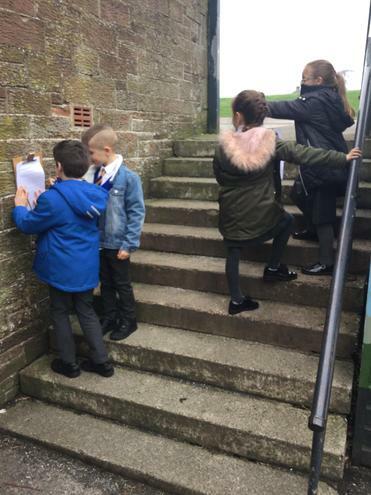 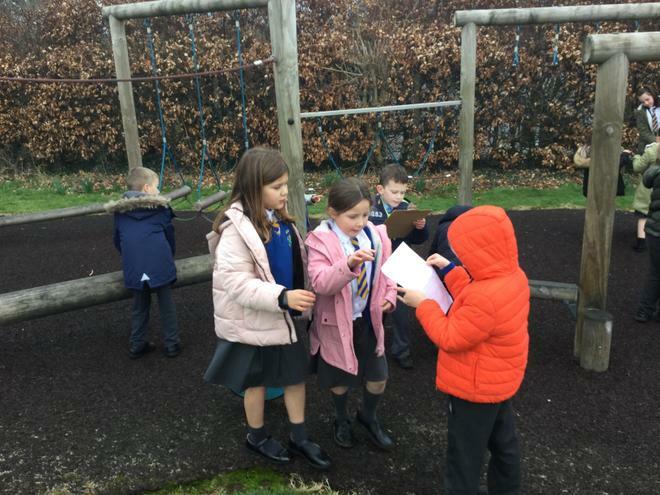 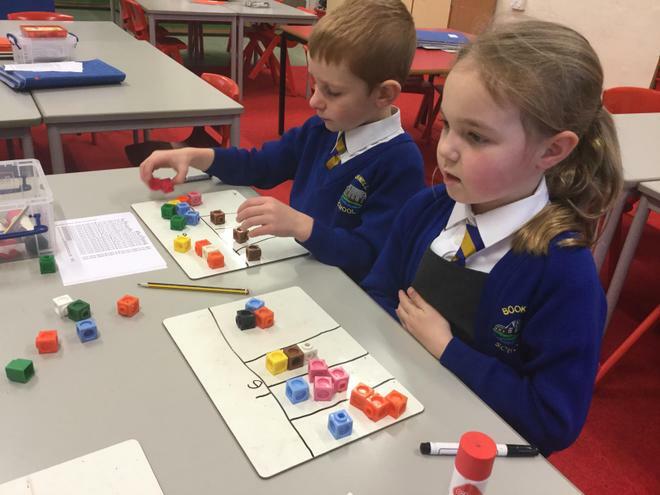 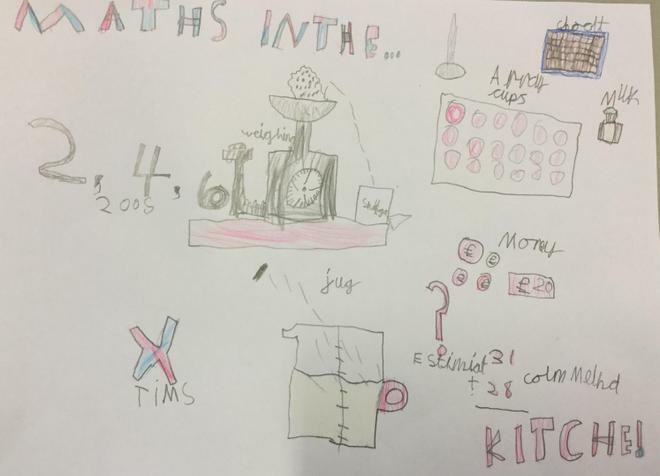 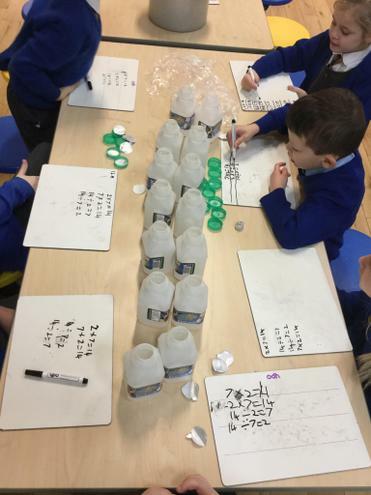 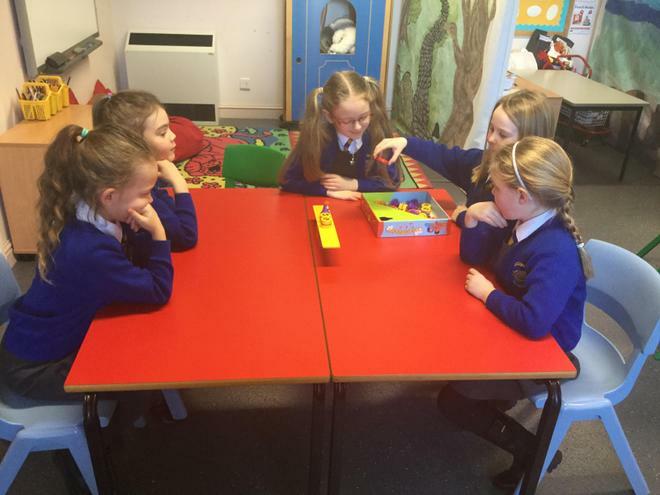 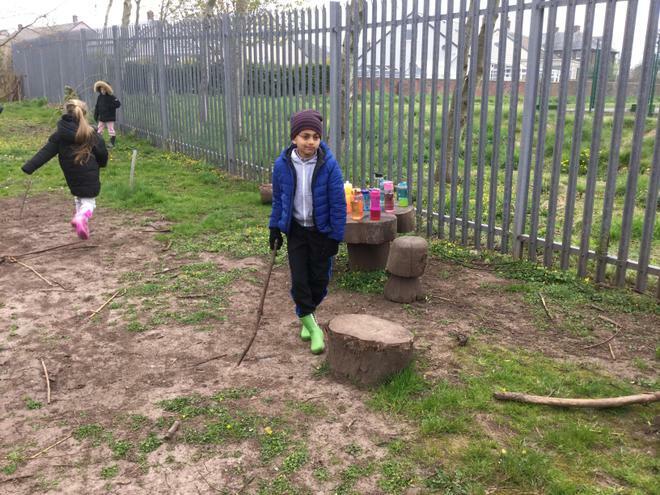 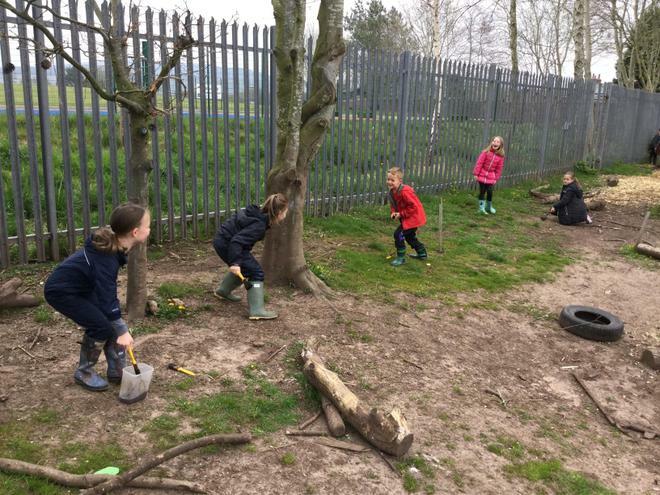 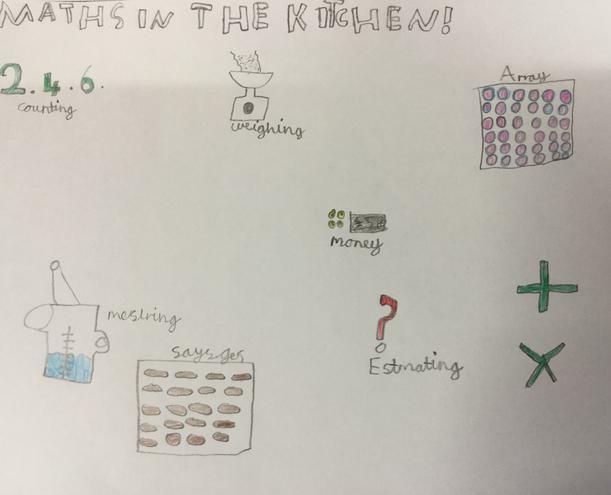 Maths is needed to play games, cook in the kitchen and measure the distances of races and without realising we are surrounded by numbers in and around school! 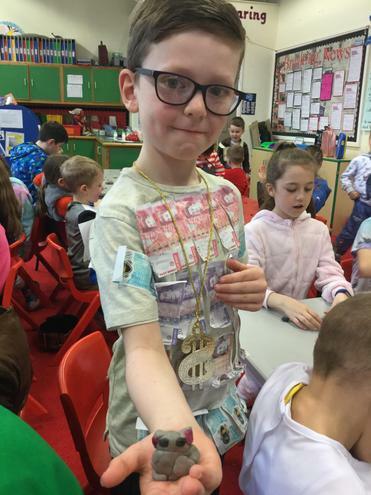 We also loved dressing up as our very own Timestable Rockstar!! 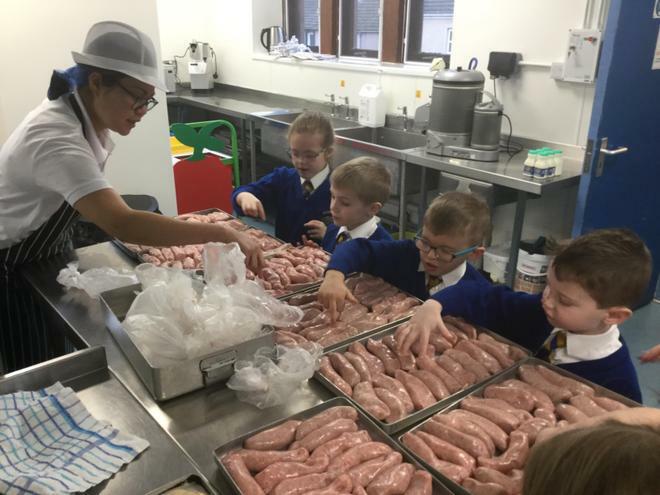 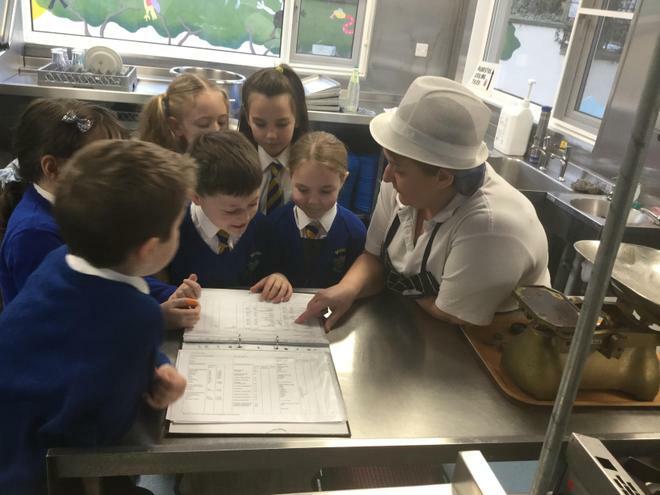 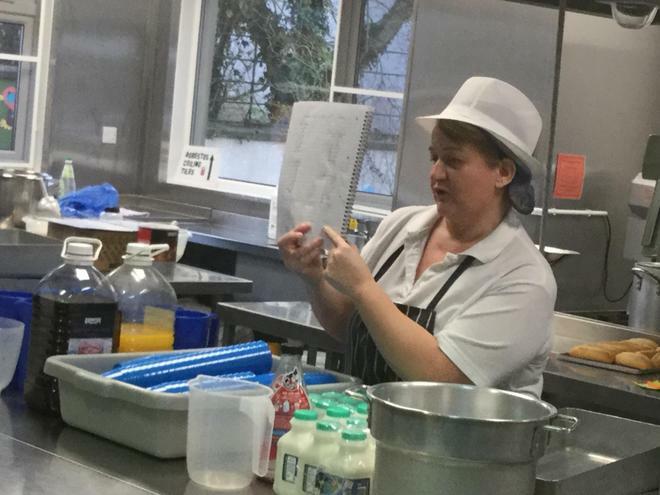 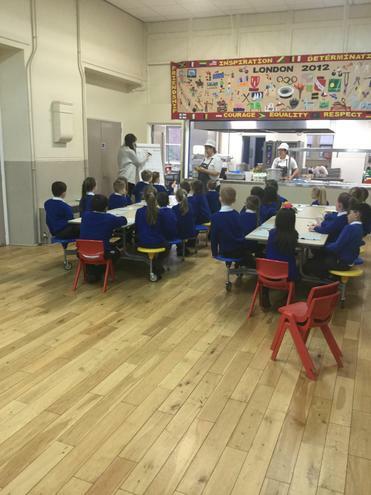 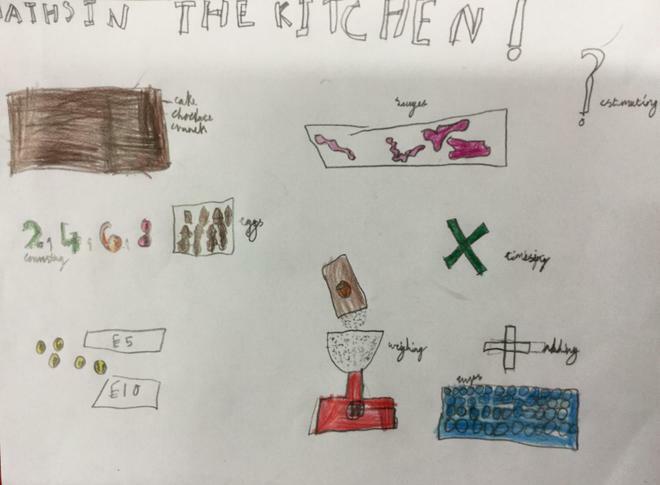 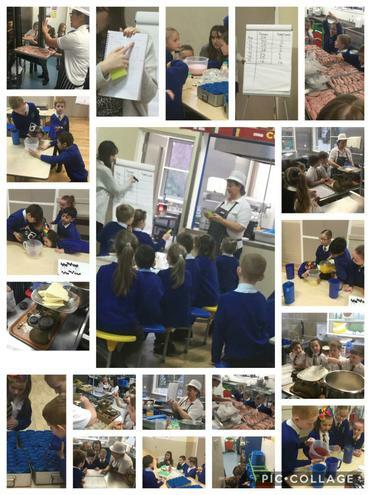 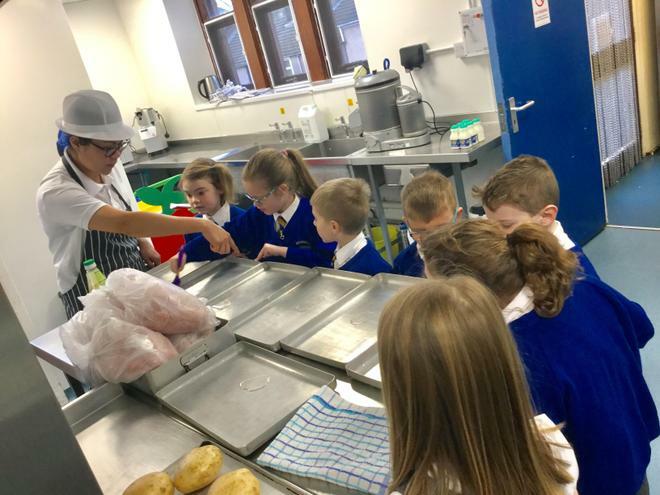 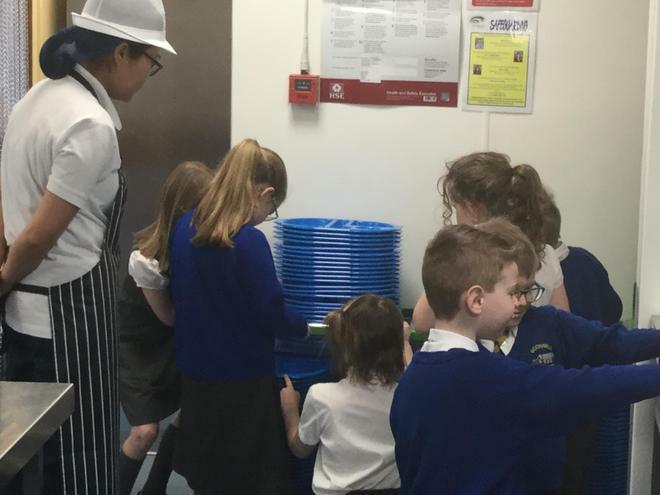 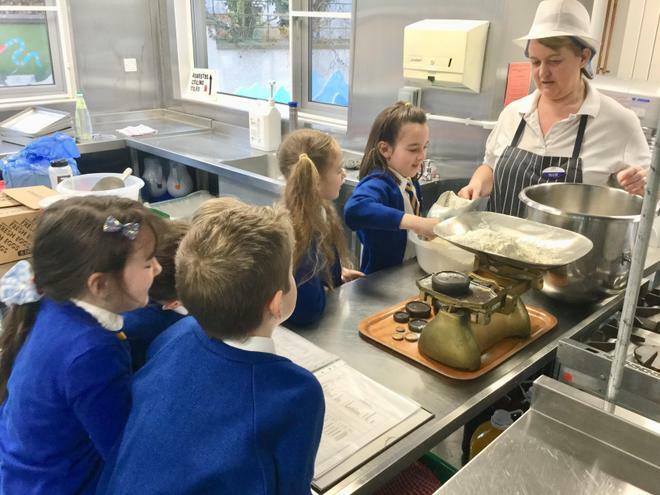 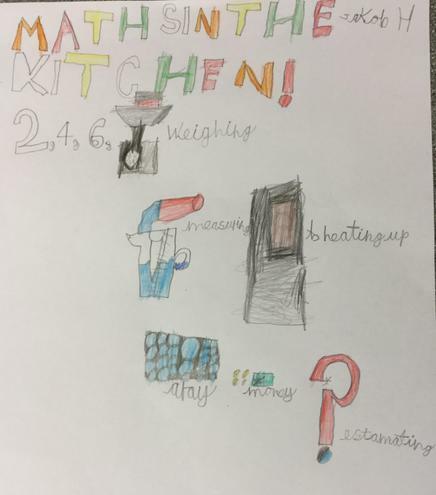 Today we started the day in the kitchen to see how maths is used.We weighed, counted in different styles and looked at measuring,estimating and temperature.What a busy morning it was, we can't wait for lunch today. 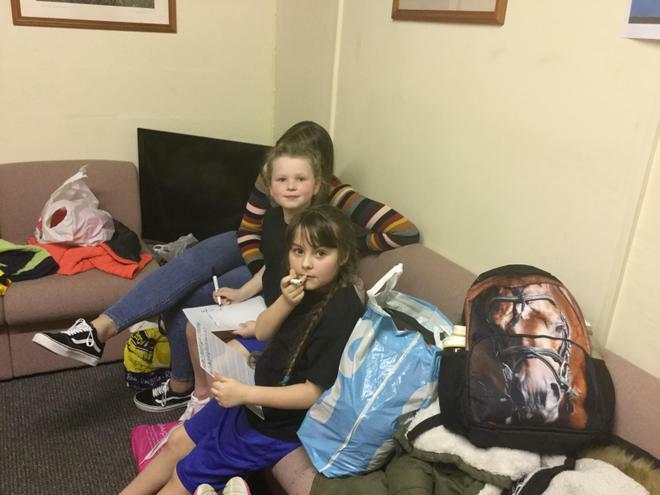 A big thank you to Auntie Angela and Auntie Mylyn. 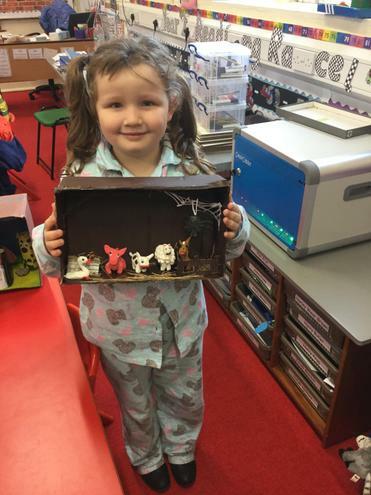 We’re preparing for our new traditional tales display in the porch... Here’s some behind the scenes snapshots before the finished display is revealed! 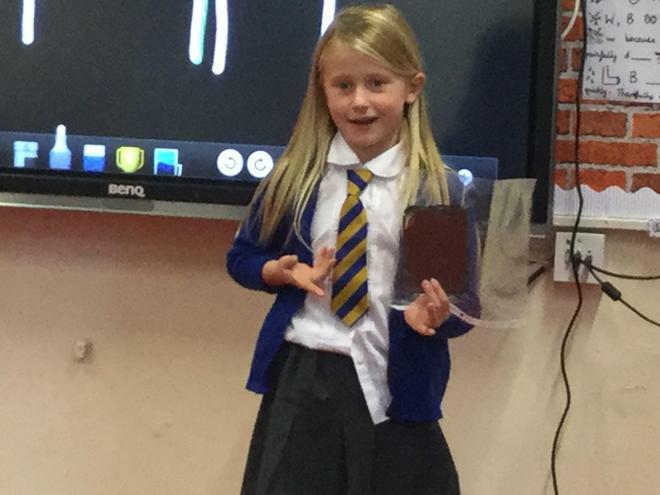 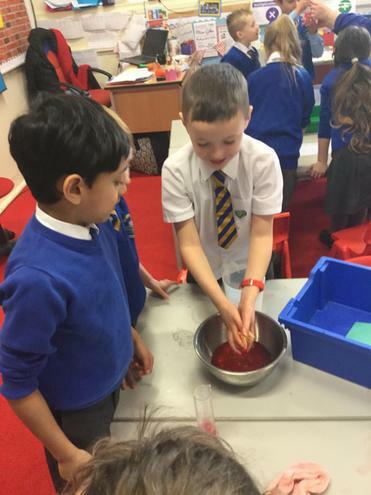 Florence Nightingale needed our help this morning, she urgently needed us to find the best absorbent material that would soak up the most blood from the soldiers wounds. 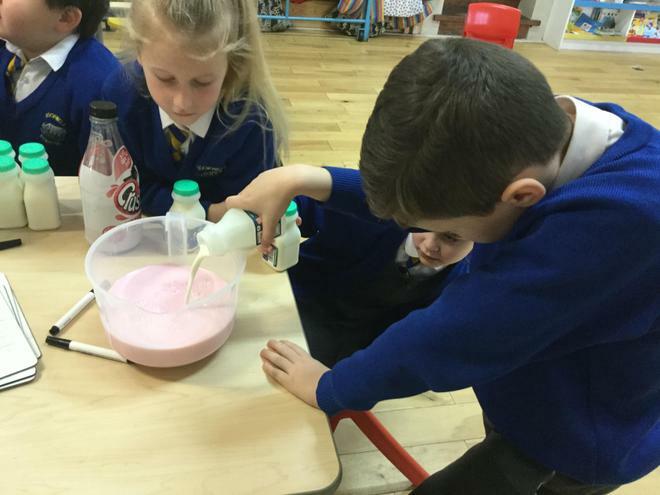 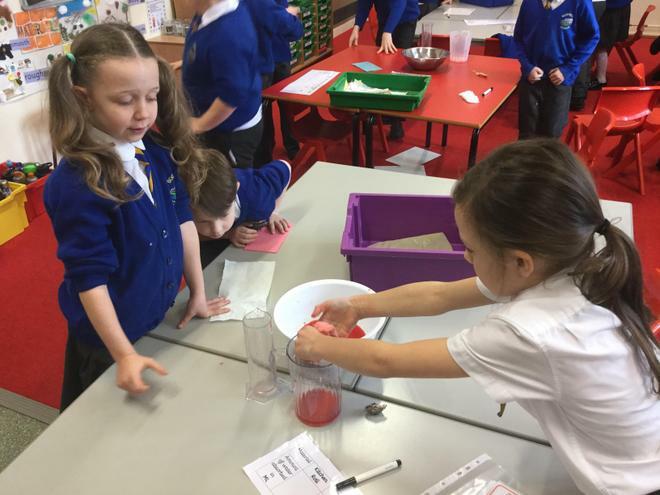 We were quick to offer our services and set up an investigation to see which material was the most absorbent. 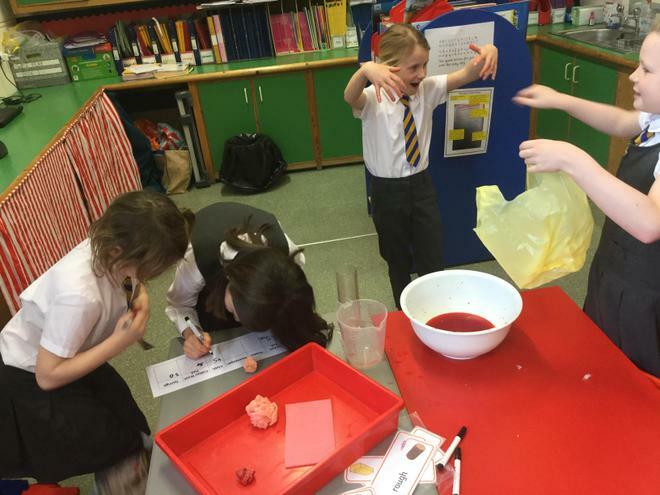 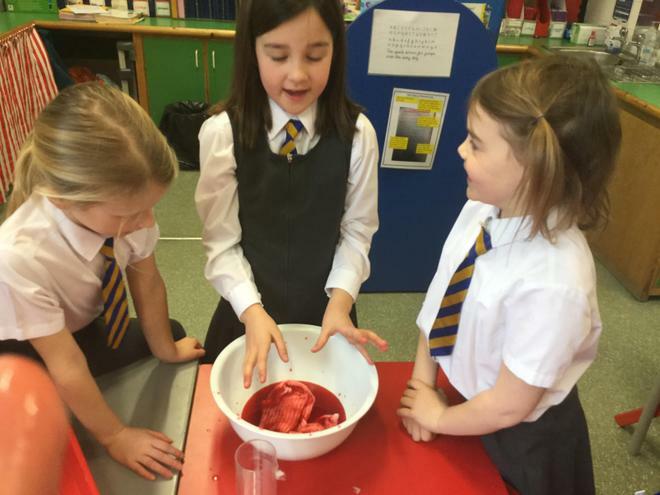 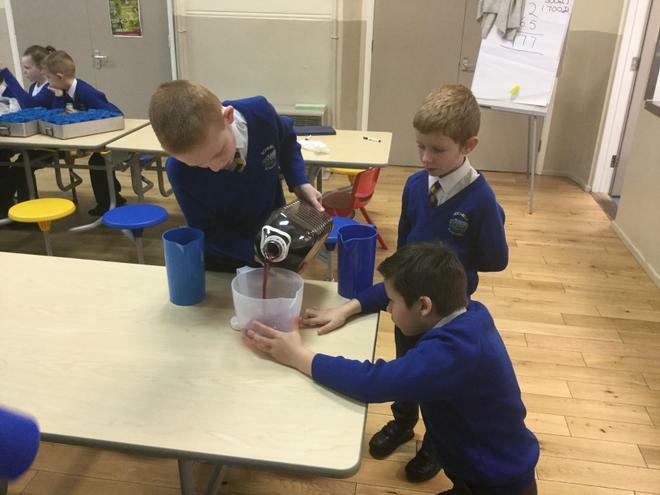 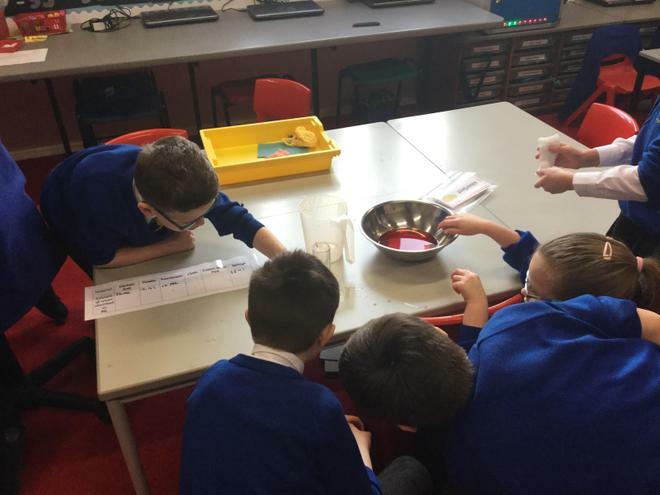 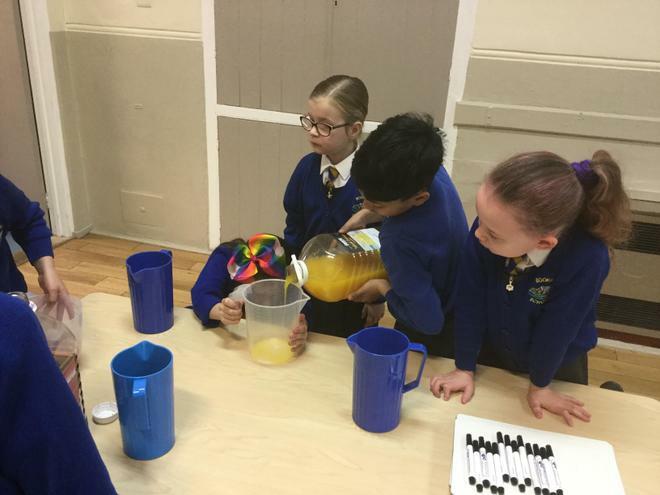 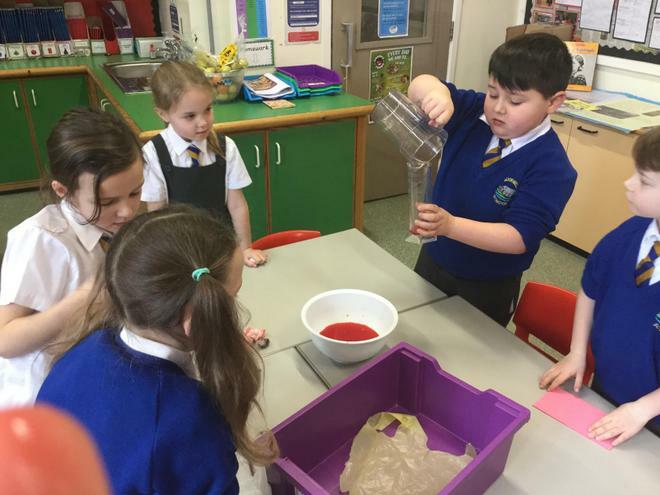 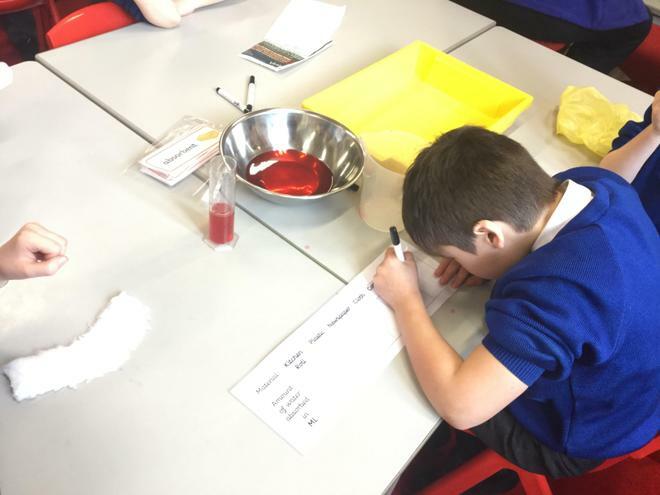 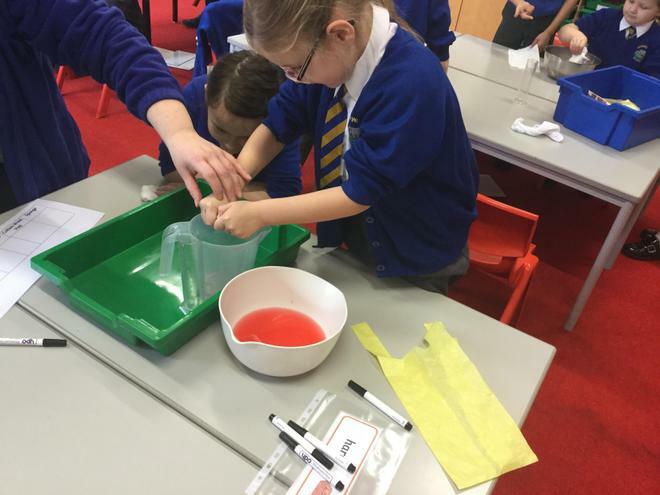 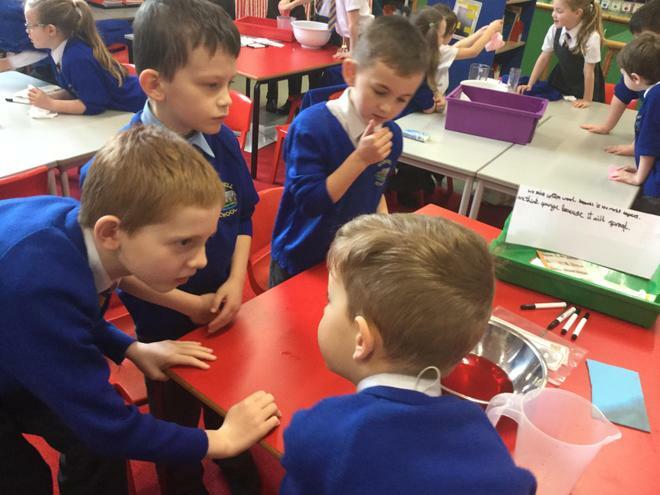 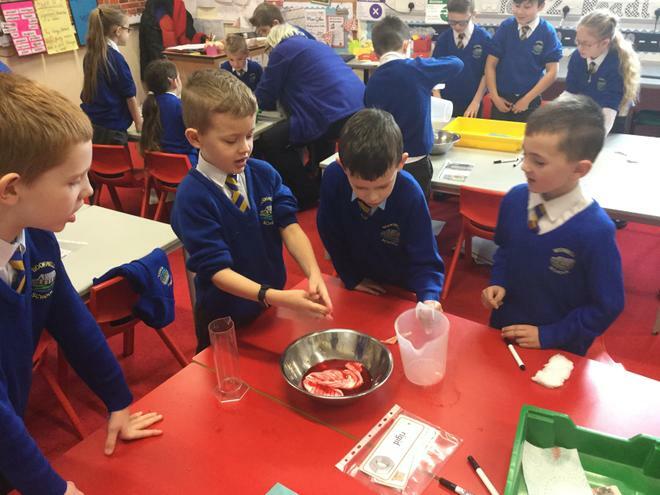 We tested lots of different materials by soaking them in ‘blood’ for 10 seconds before squeezing the liquid into a jug and measuring how much was absorbed. 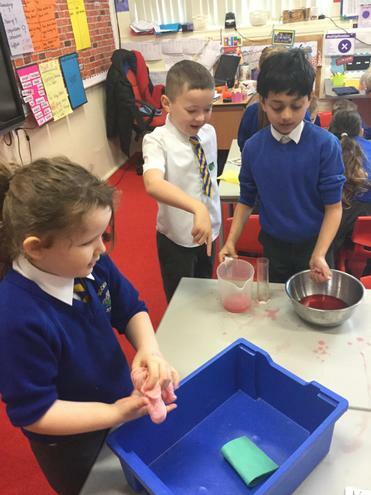 Our investigation showed that the sponge was the most absorbent but cloth came a close second!! 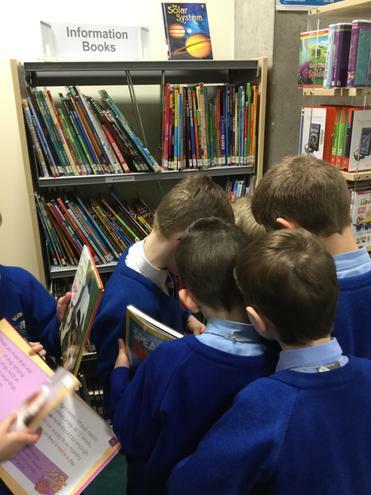 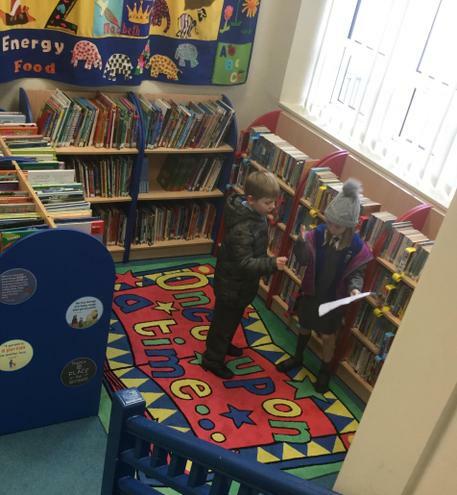 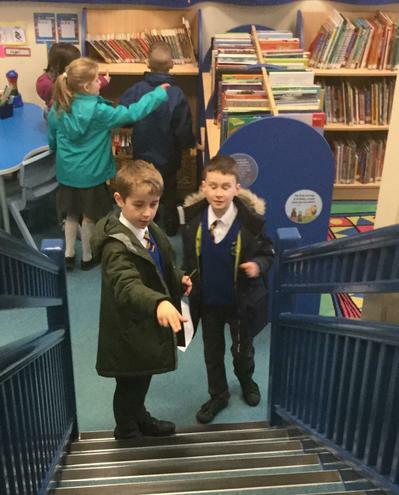 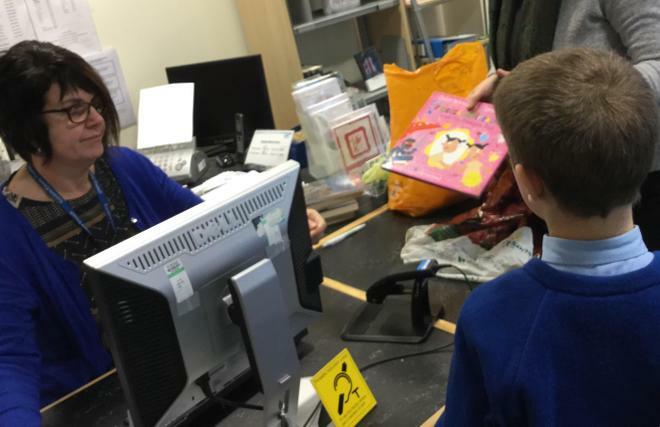 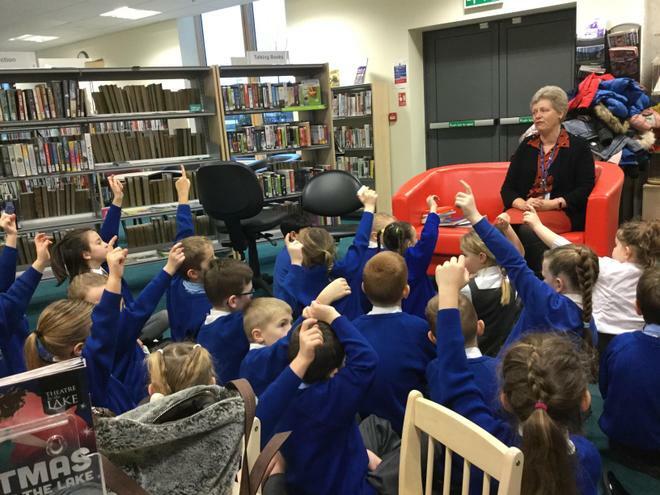 We were very fortunate to visit our local library and learn how to borrow a book. 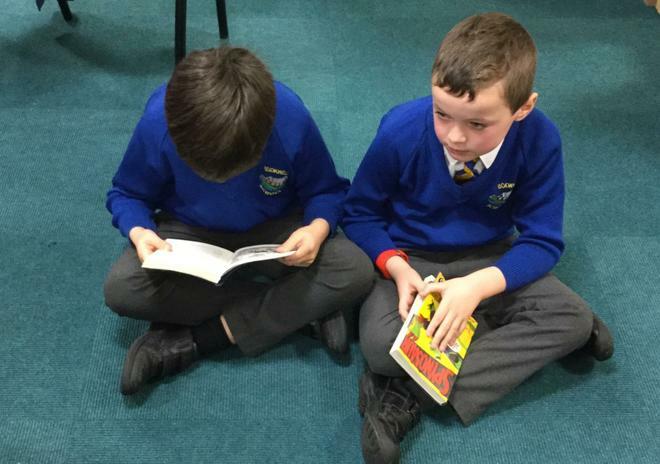 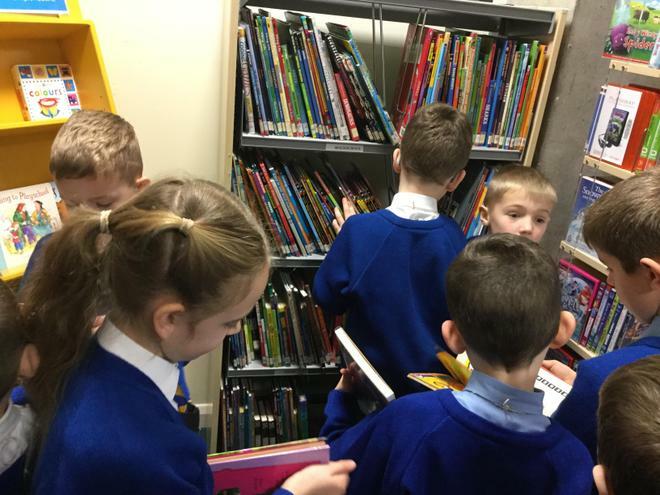 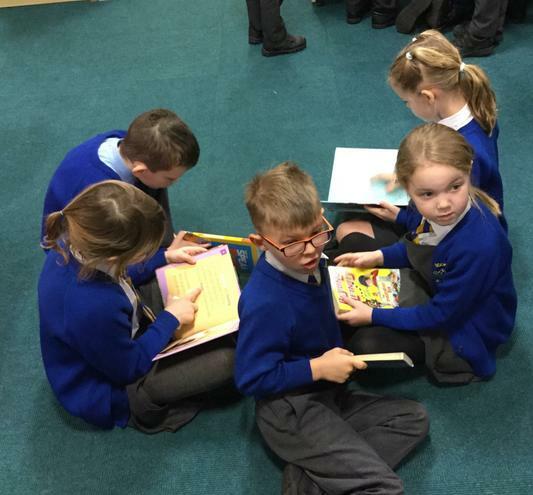 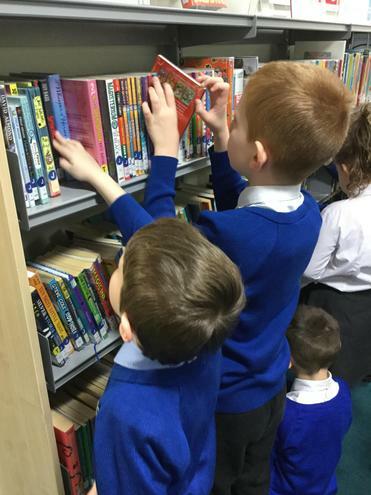 We didn’t realise we could take up to 10 books at a time! 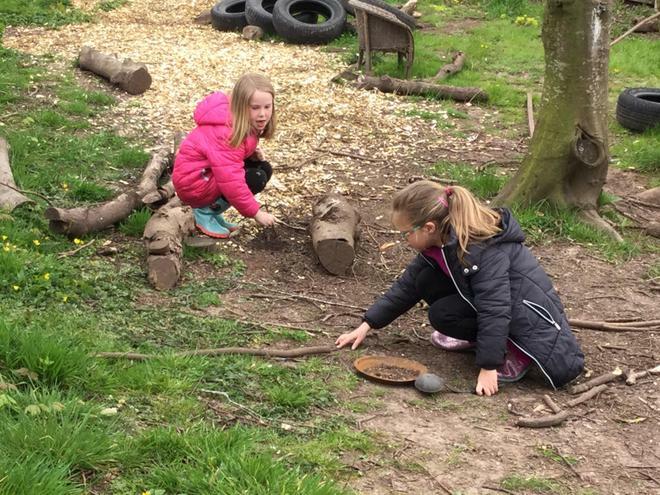 What a fantastic place to visit and it’s right on our doorstep. 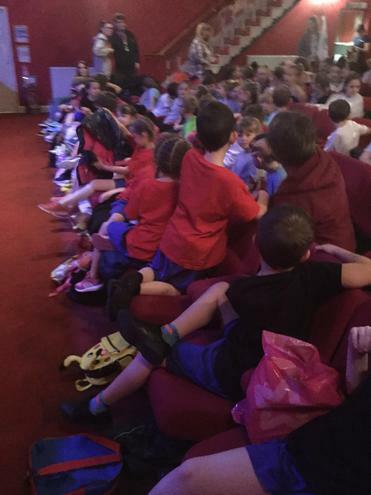 We will definitely be returning soon! 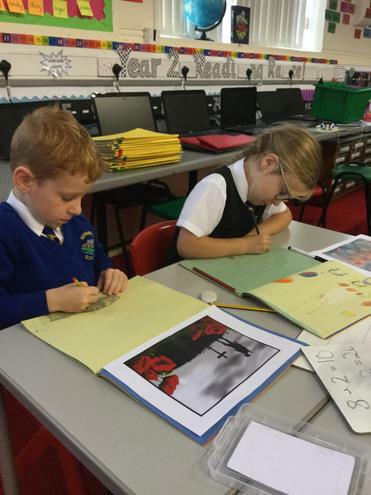 We’ve been learning a new information text as part of our English topic all about Black Panthers. 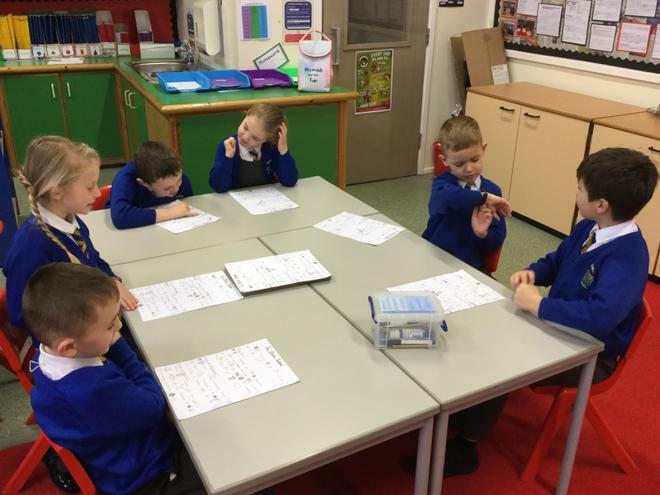 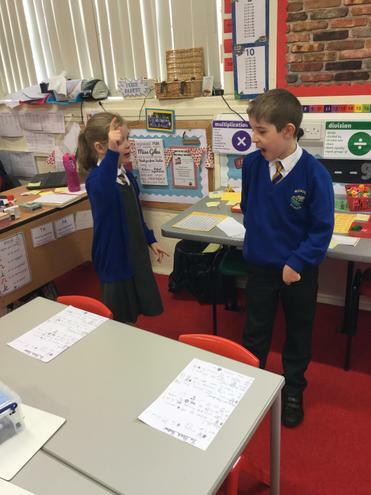 We are learning the text by performing it using actions and have learned lots of interesting facts. 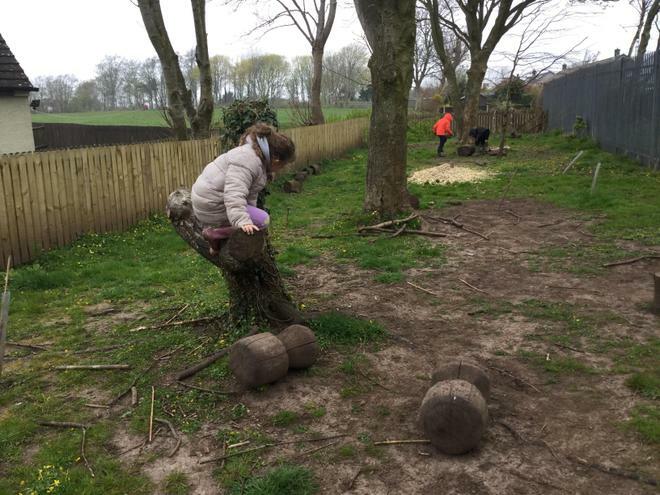 Did you know black panthers have incredibly powerful jaws that are strong enough to crack a human skull in half! 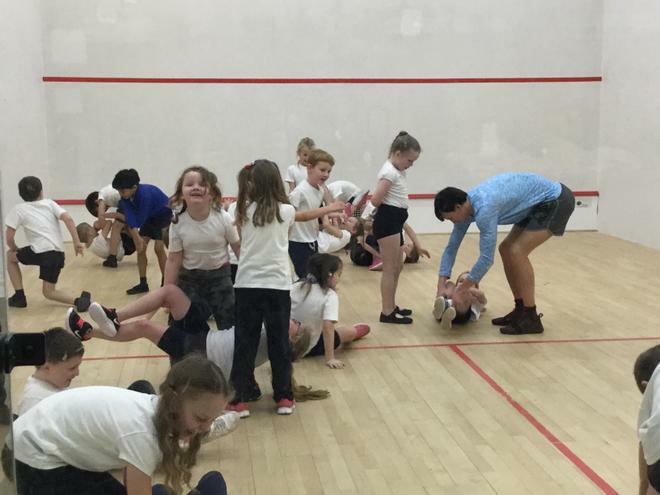 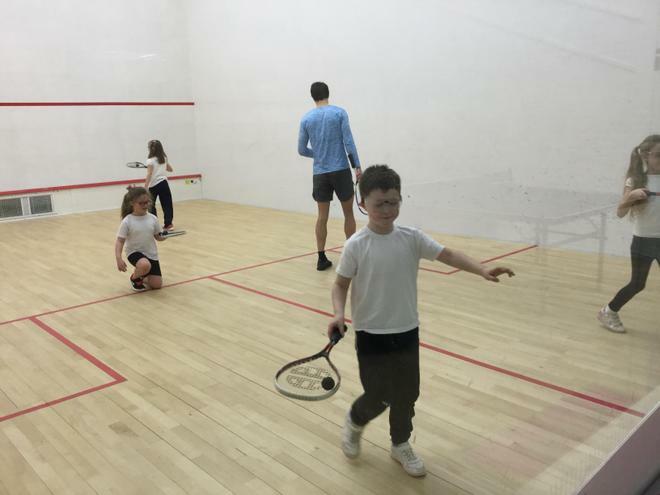 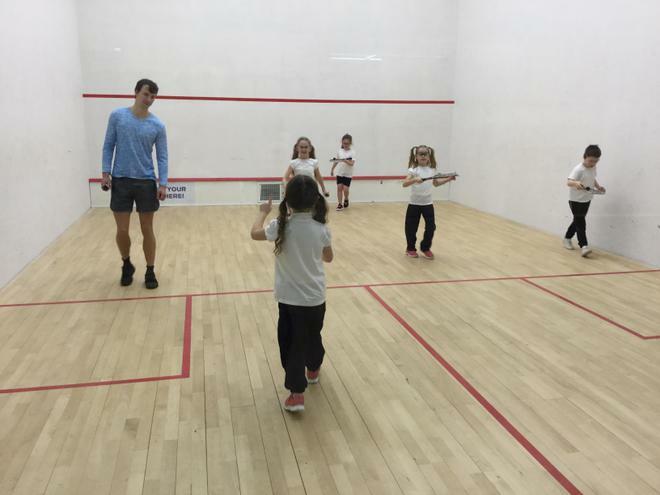 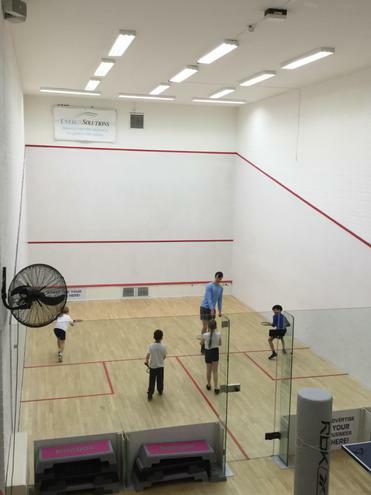 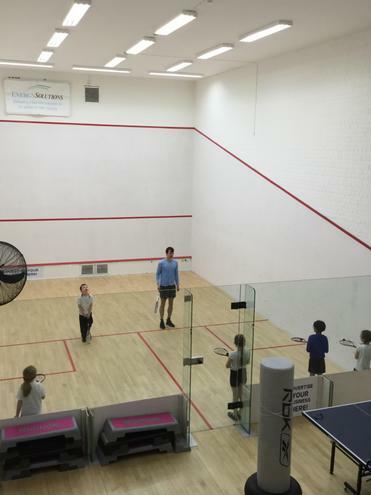 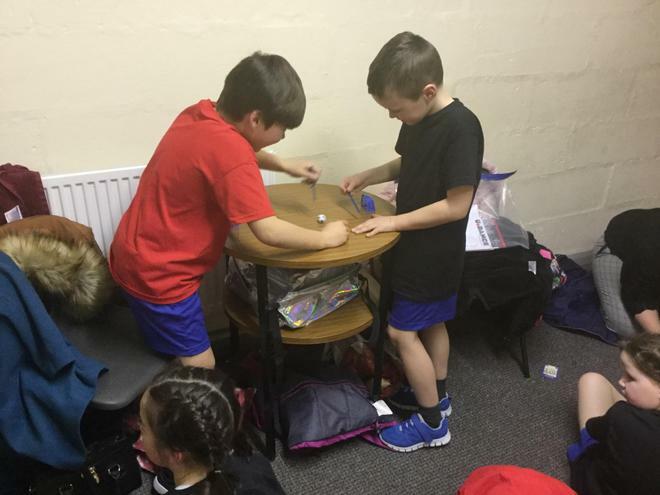 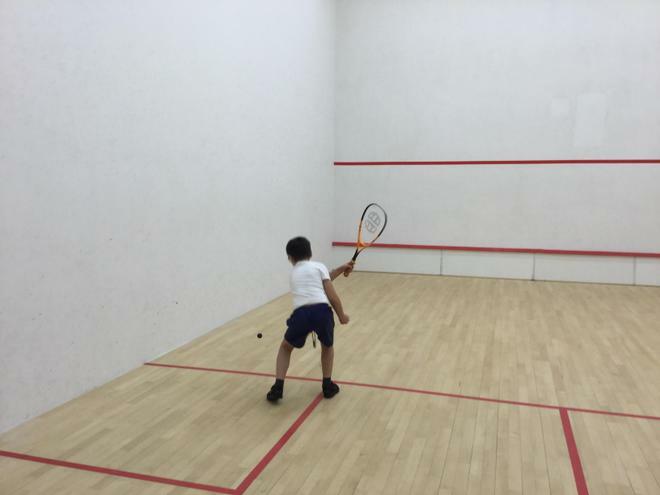 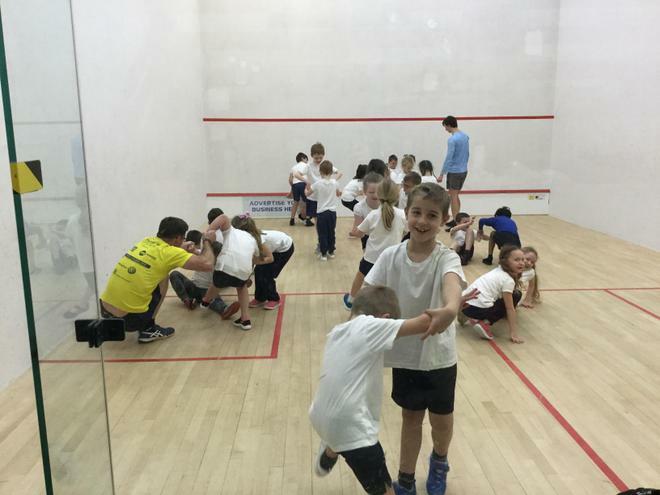 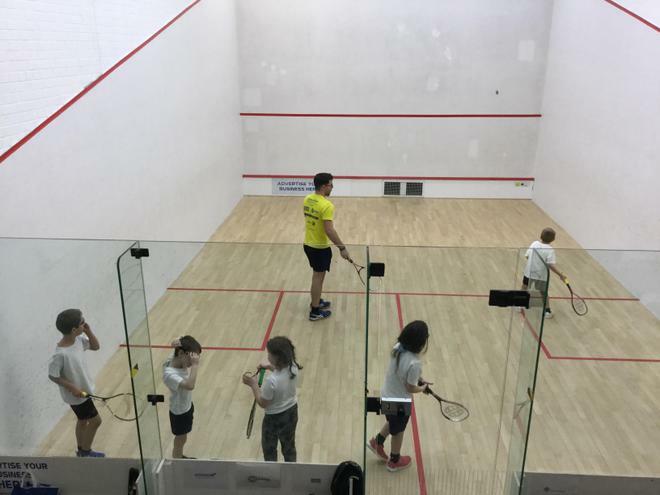 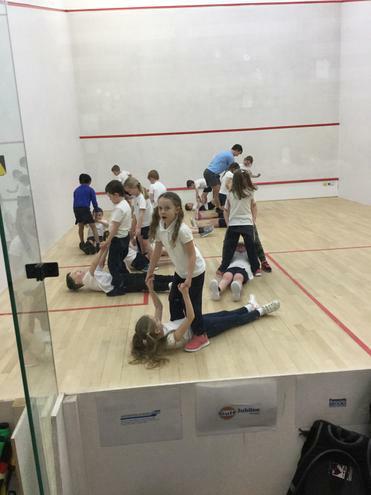 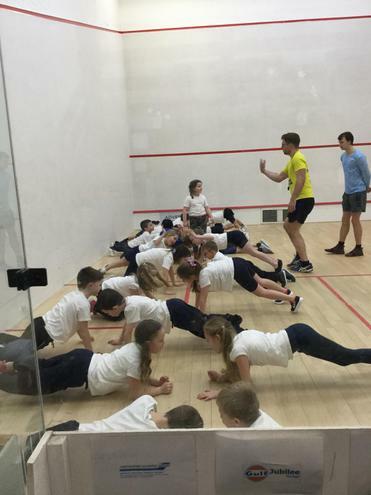 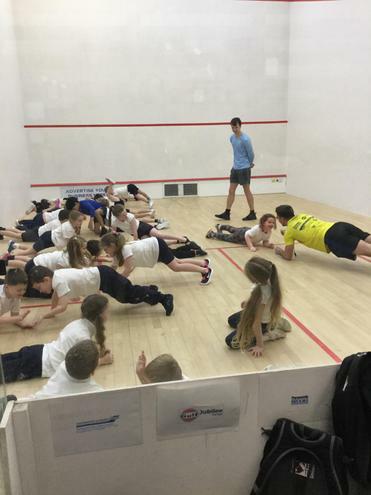 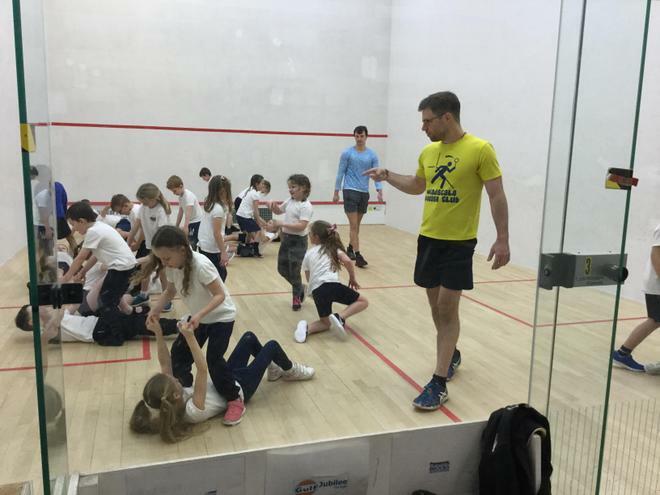 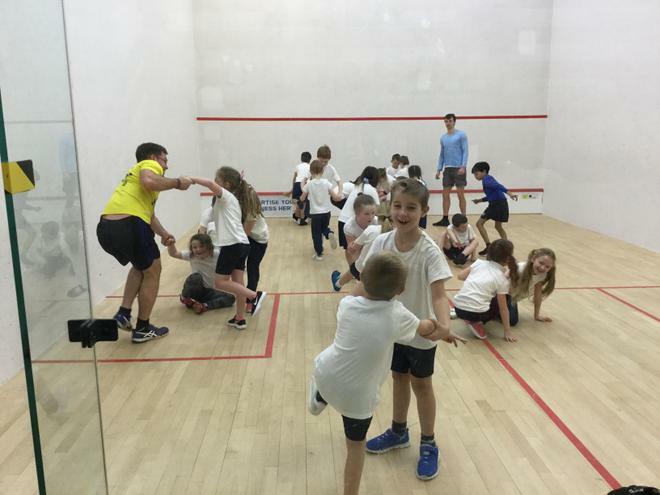 Year 2 have been incredibly lucky to visit the Falcon Club every Monday to learn how to play squash with the coach Gavin. 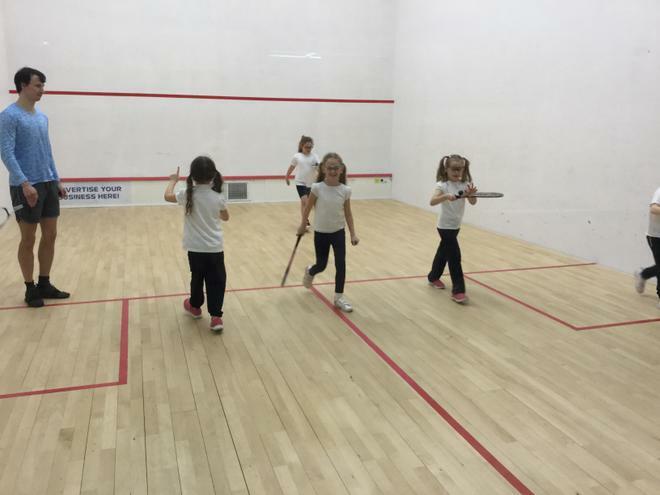 We have loved learning how to serve and control the ball using our rackets. 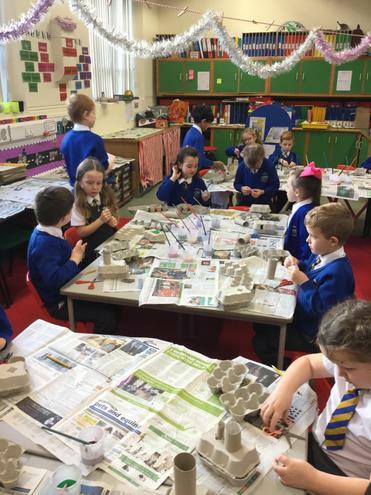 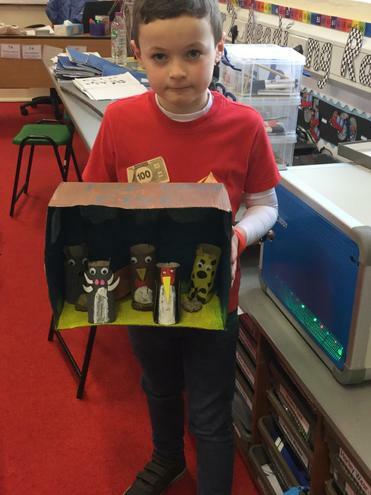 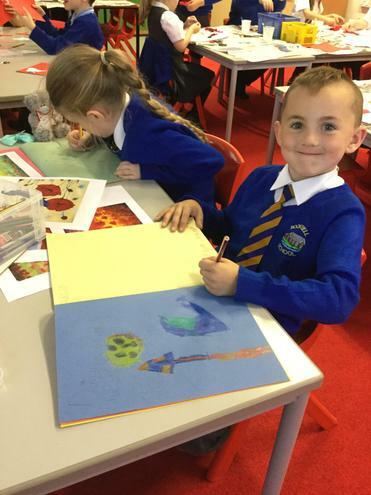 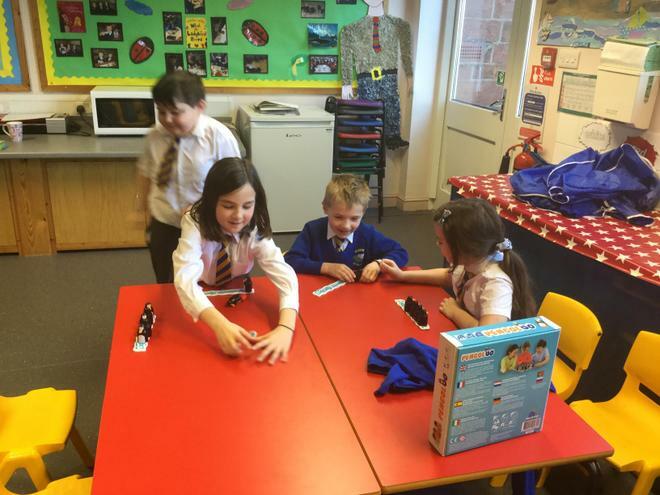 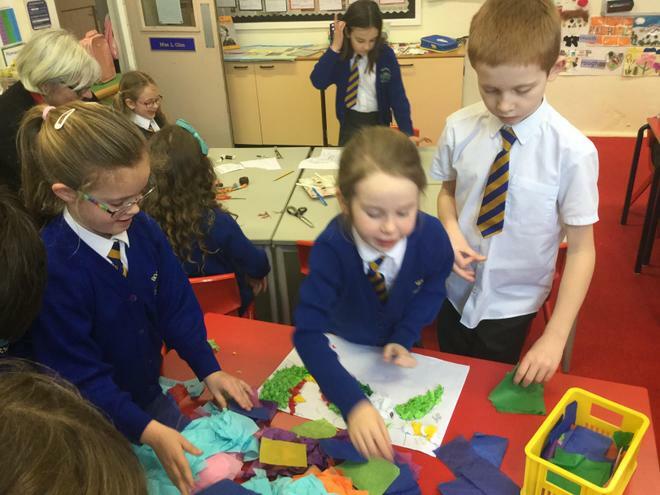 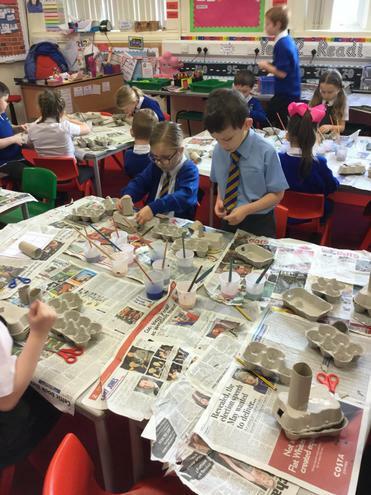 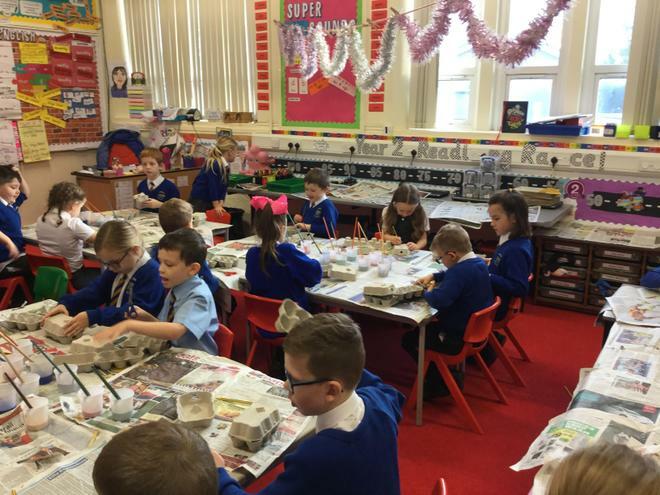 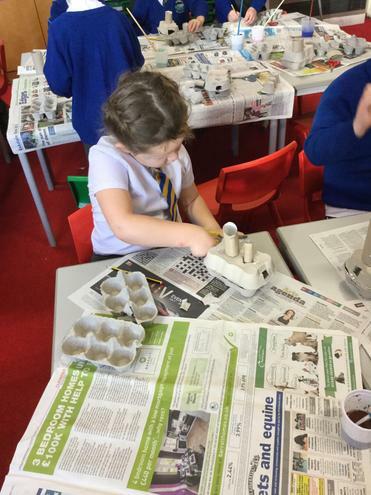 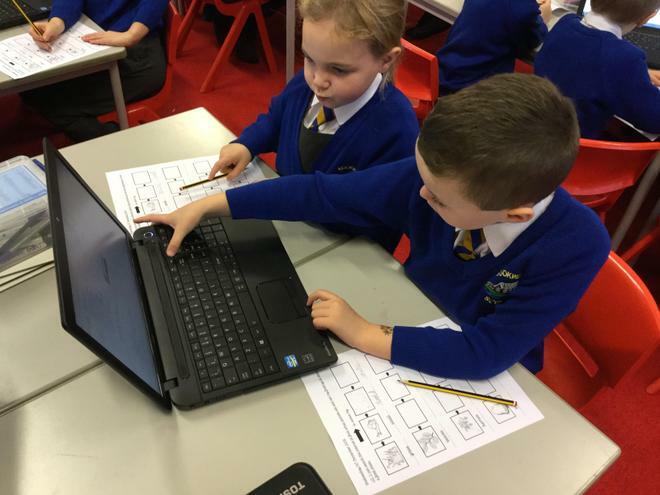 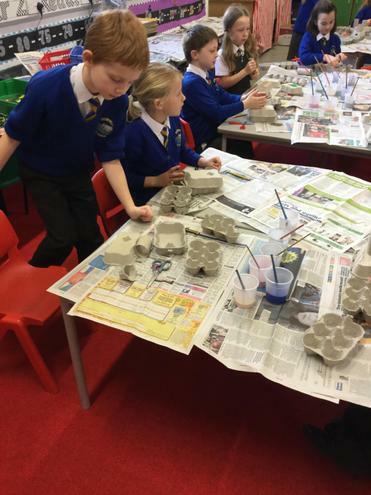 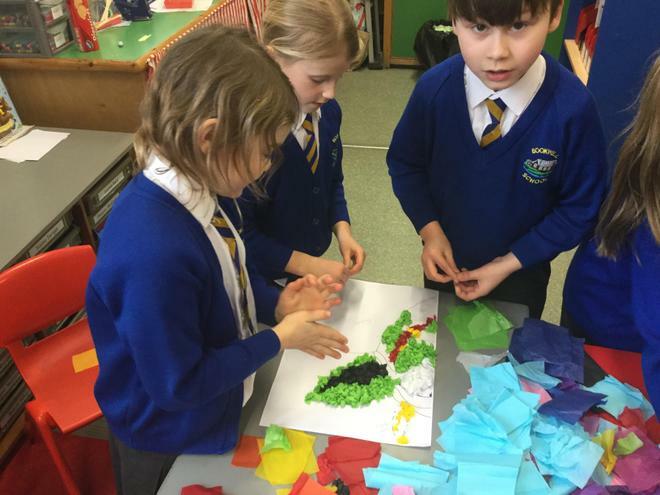 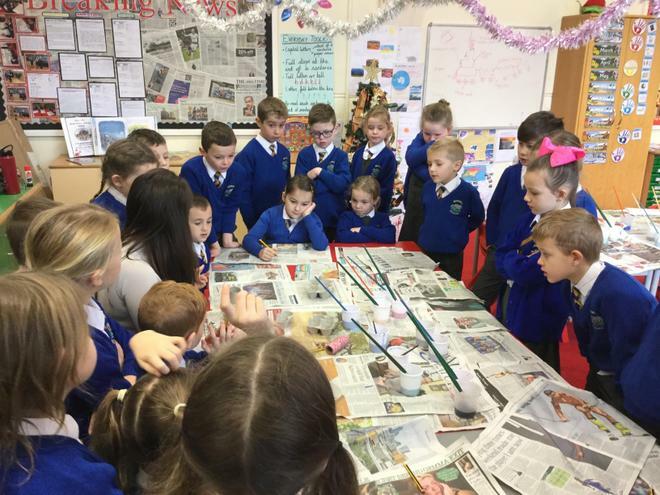 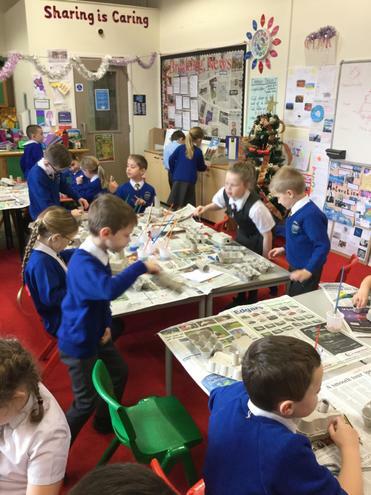 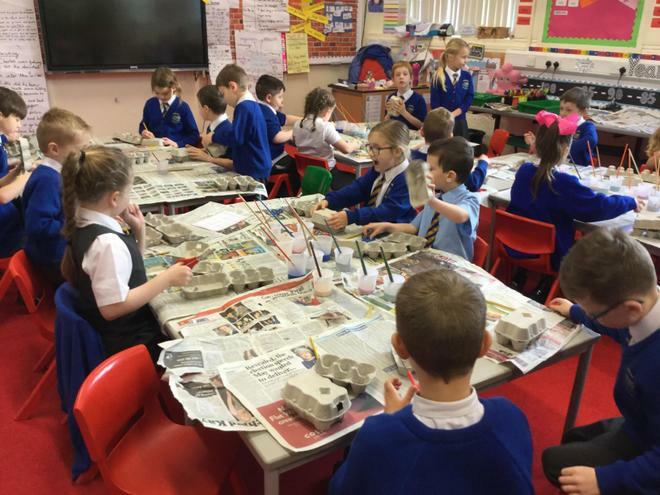 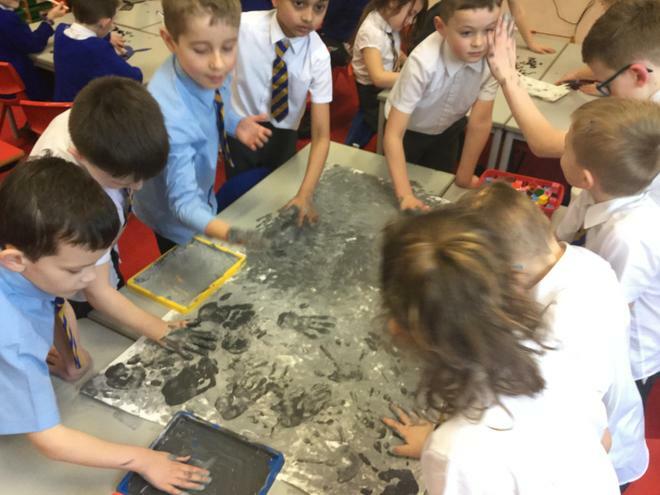 On Technology day we were given the challenge of making the Polar Express, we planned our designs before using egg boxes and various materials to make a toy version of the Christmas train. 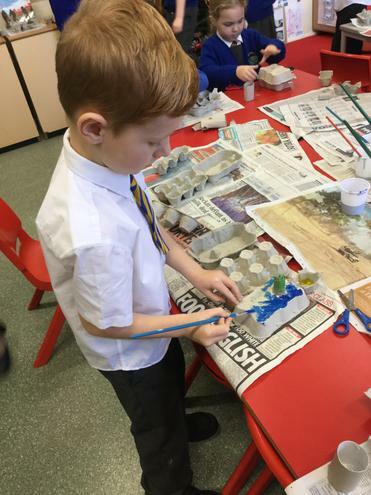 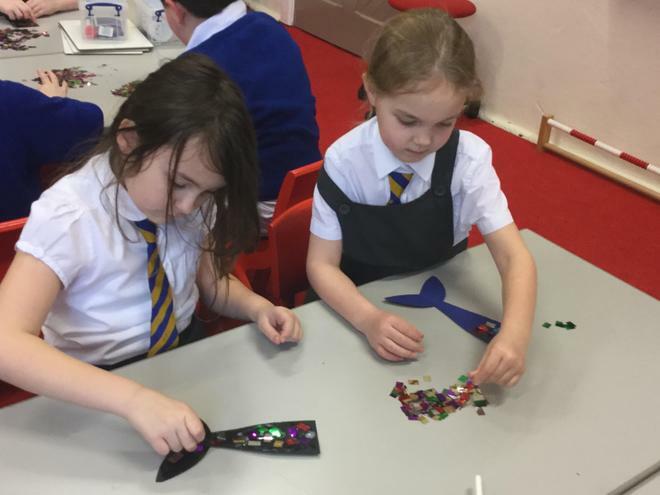 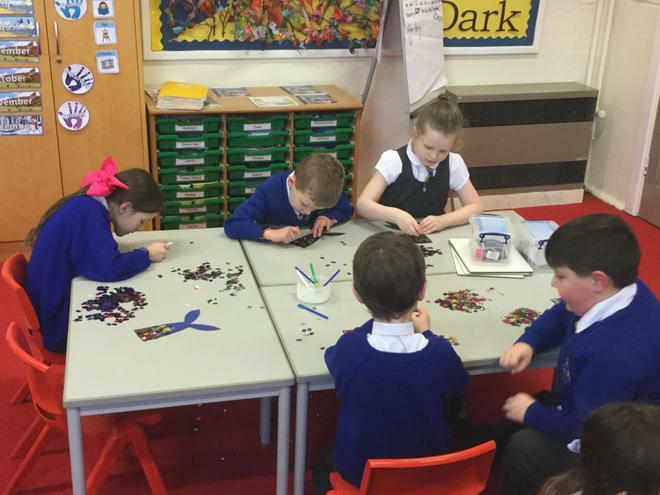 We had lots of fun painting and sticking! 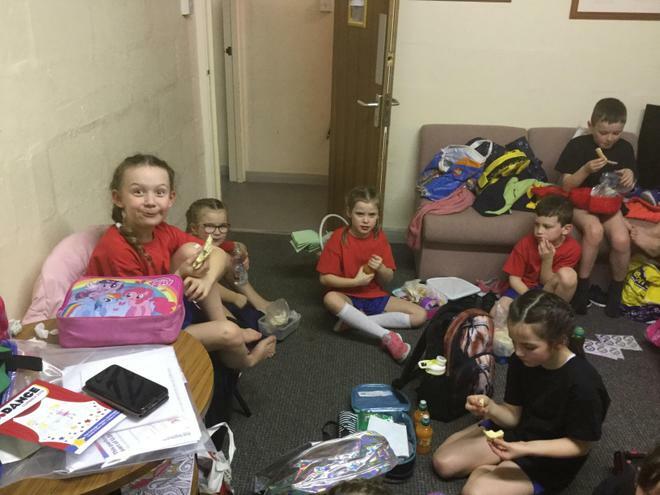 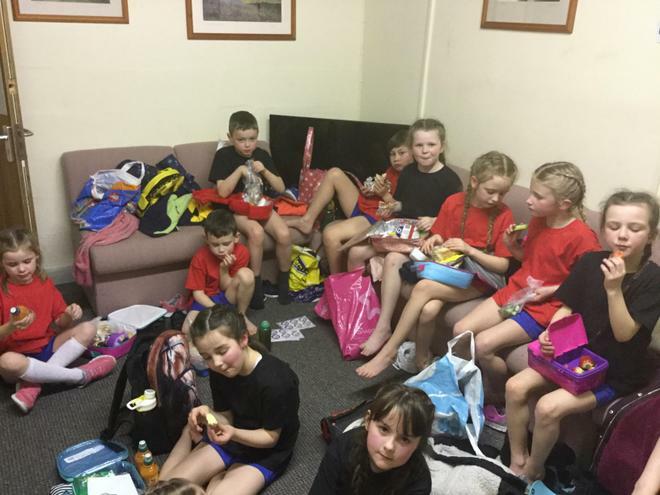 Huge congratulations to our gymnastic team who won the Key Steps 1 Gymnastic competition! 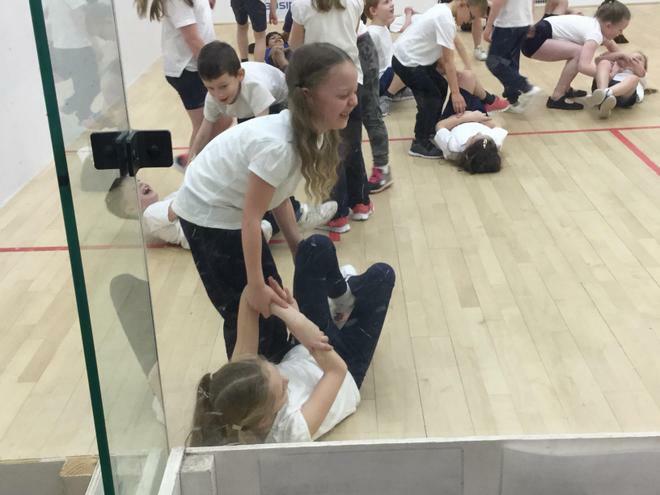 They have all been working extremely hard on perfecting their forward rolls, back supports and landing positions, proving that practise really does make perfect!! 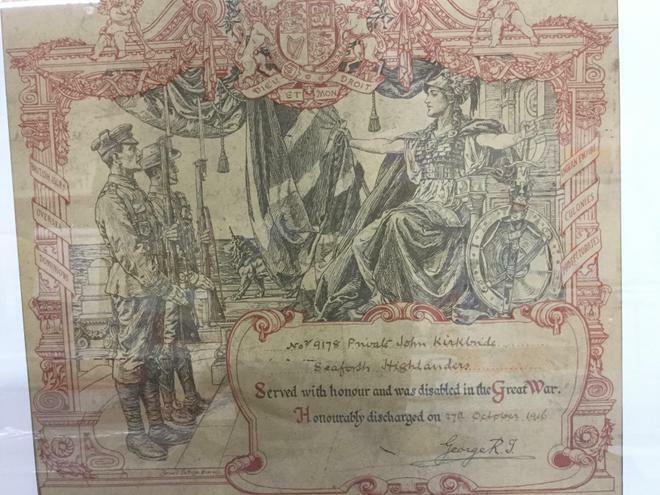 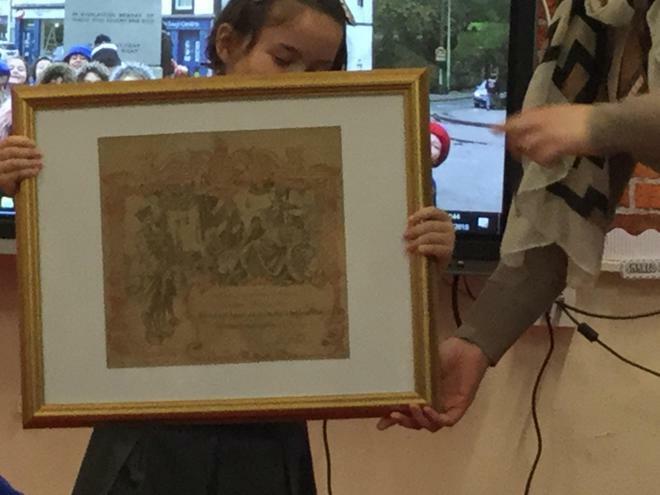 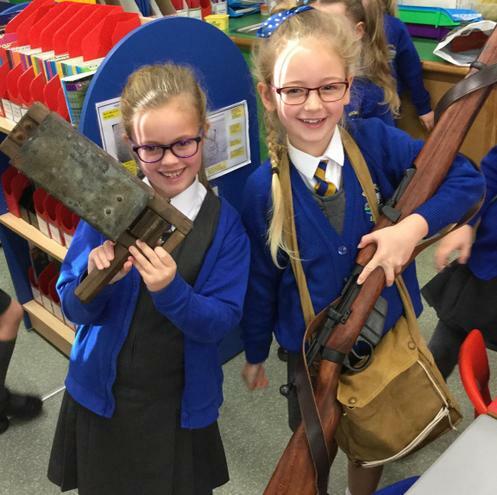 We were very lucky to be able to handle some artefacts and replicas from WW1. 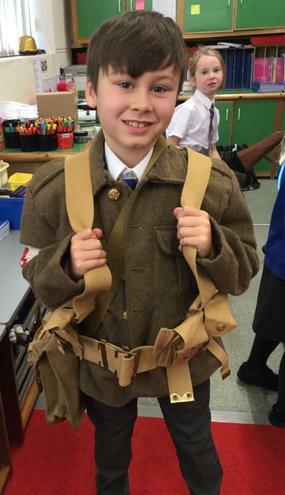 Everyone enjoyed dressing up as a soldier, stretcher bearer and listening to the gas rattle but more importantly understood how difficult and very scary life would have been for soldiers fighting for their country 100 years ago. 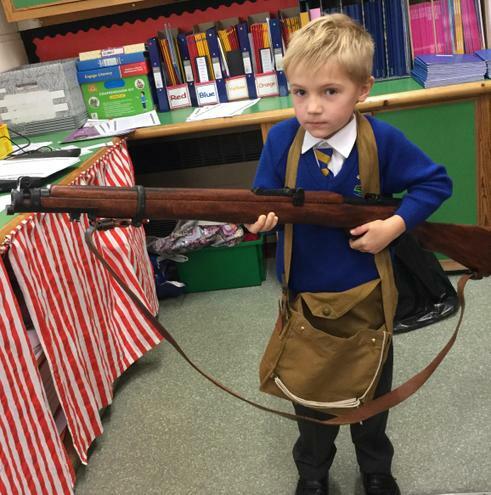 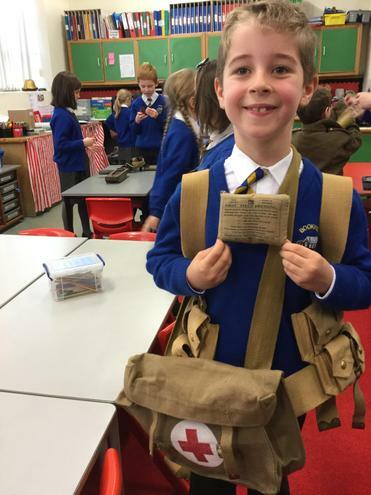 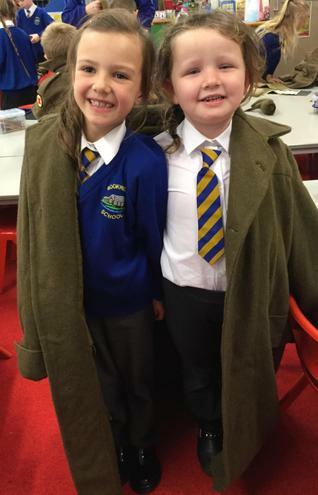 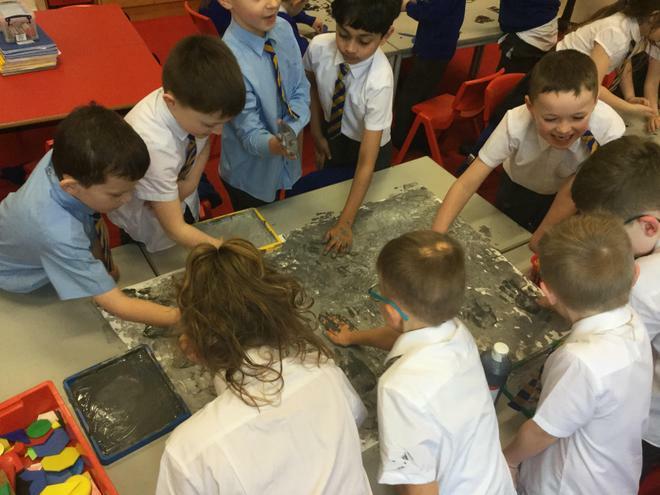 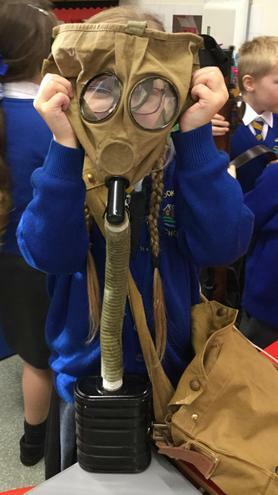 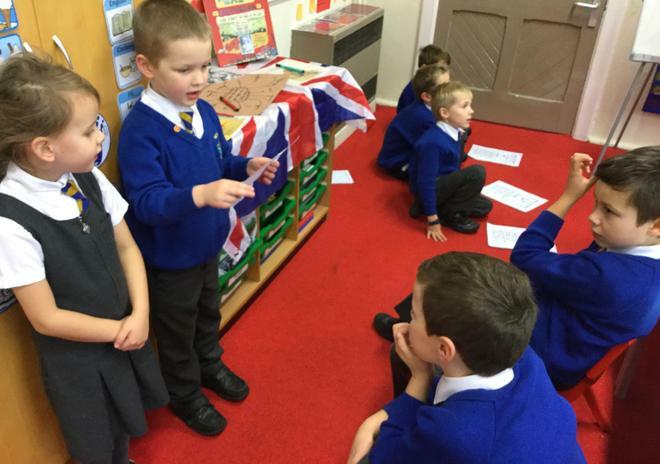 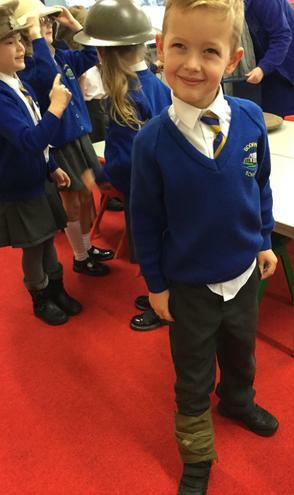 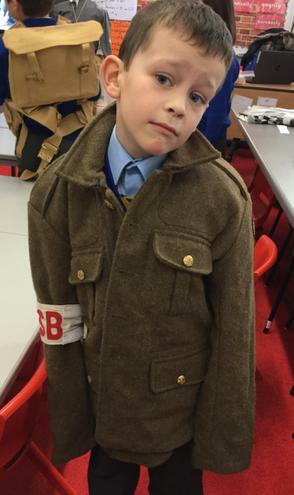 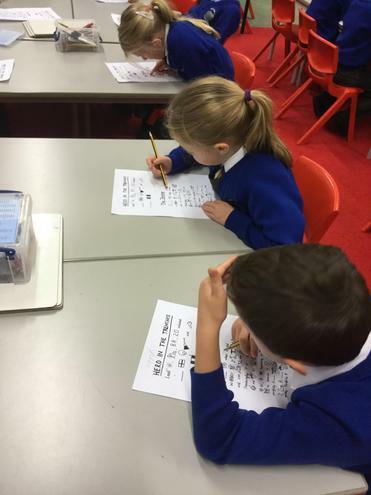 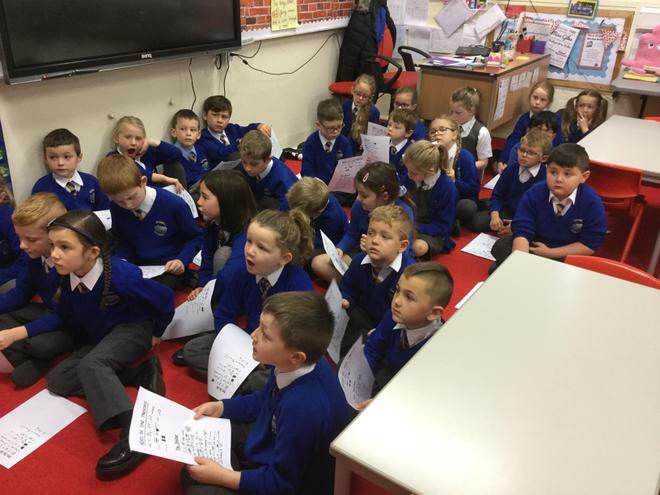 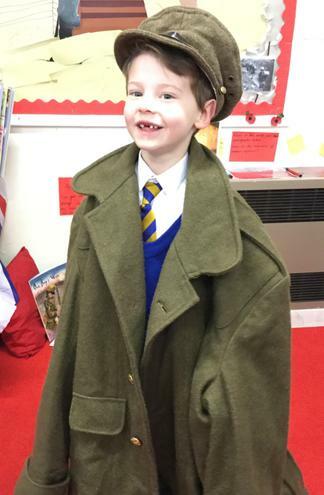 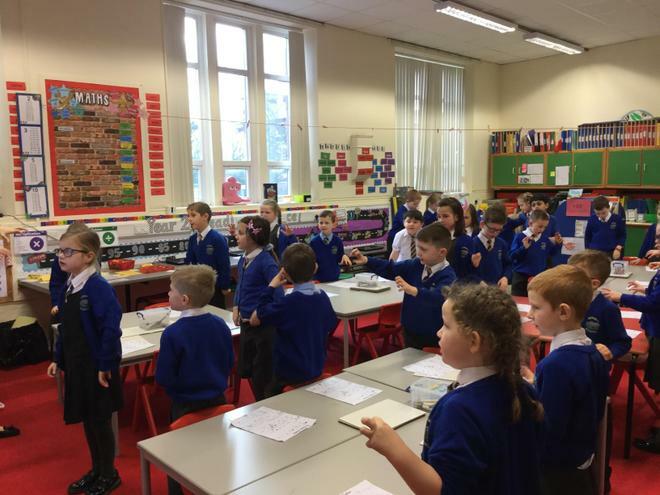 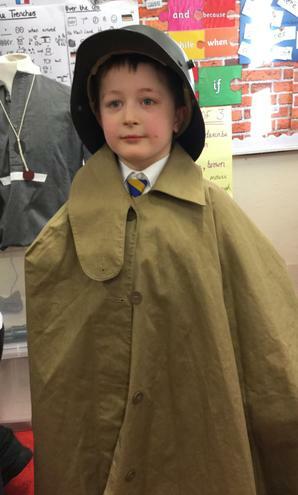 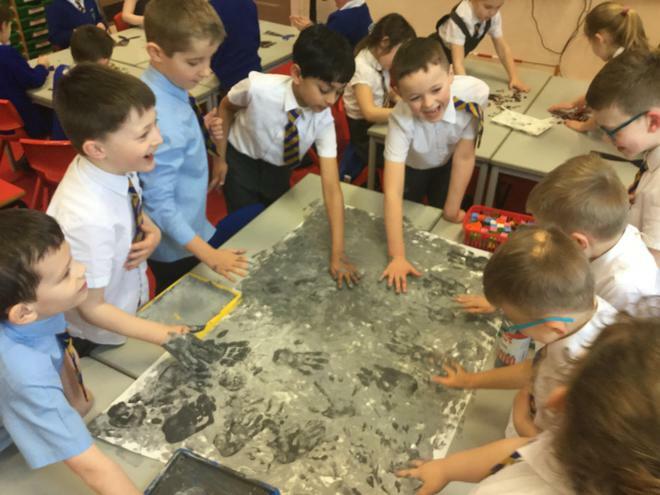 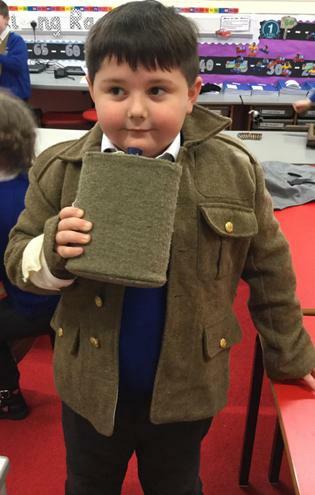 It has been so fantastic to see year 2 engage with our World War One topic both at school and at home. 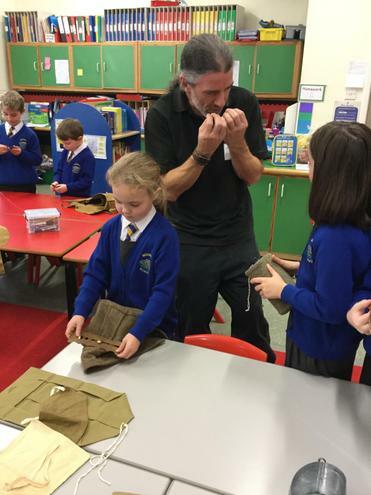 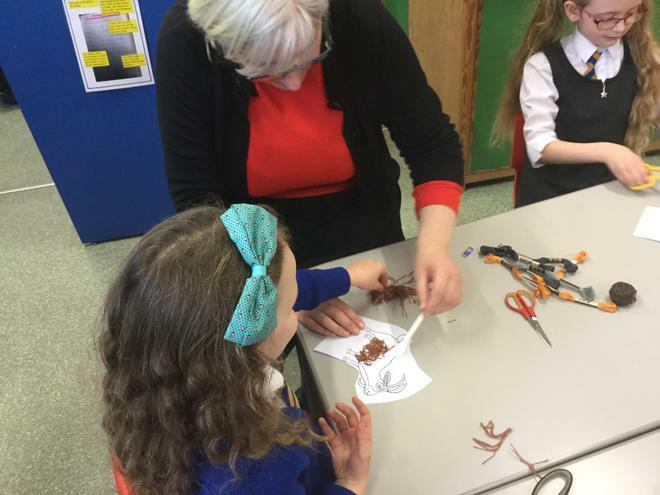 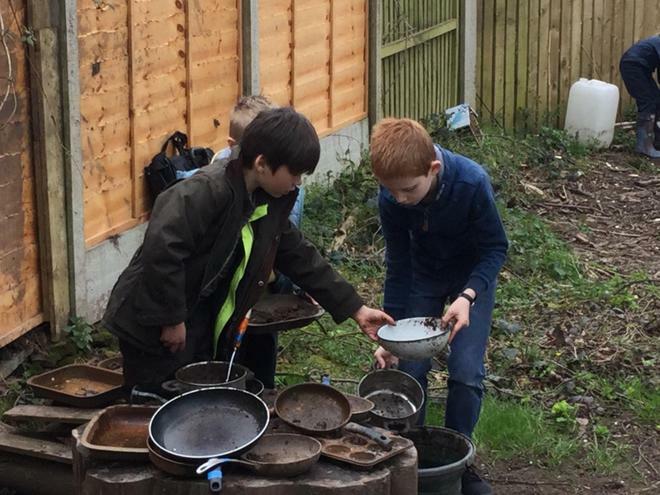 We were very lucky to have Alan from The Beacon visit and organise a special workshop about life in the trenches and how the war changed life back in England. 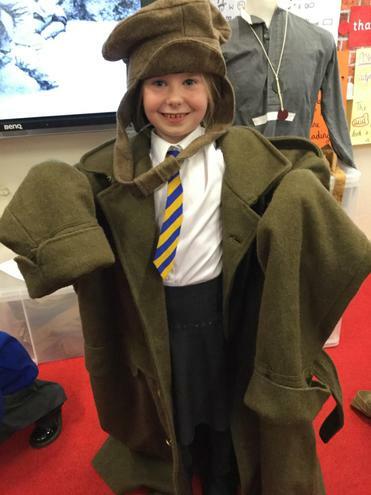 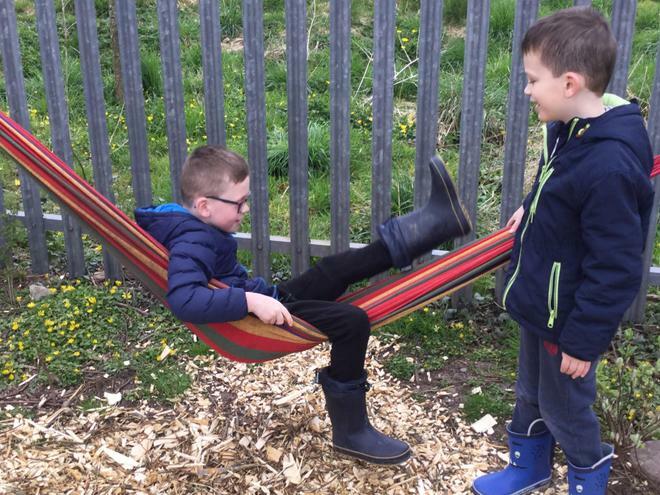 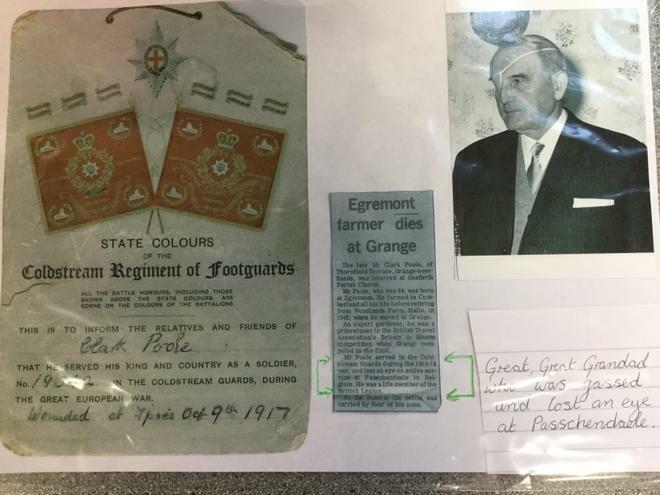 Did you know that children helped to keep soldiers feet dry by collecting wool from the farmers field to make socks? 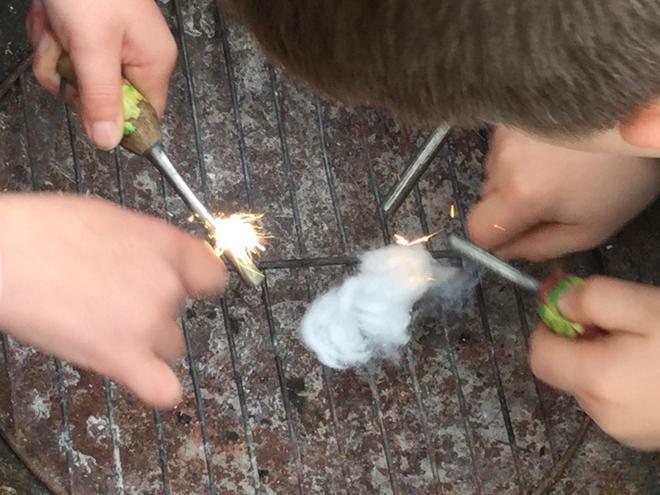 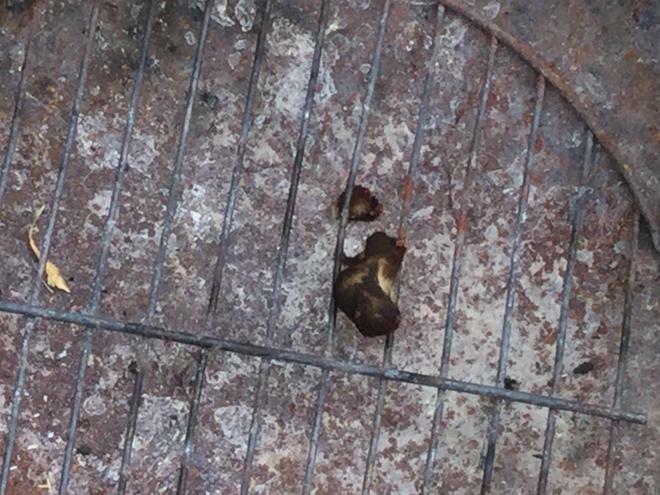 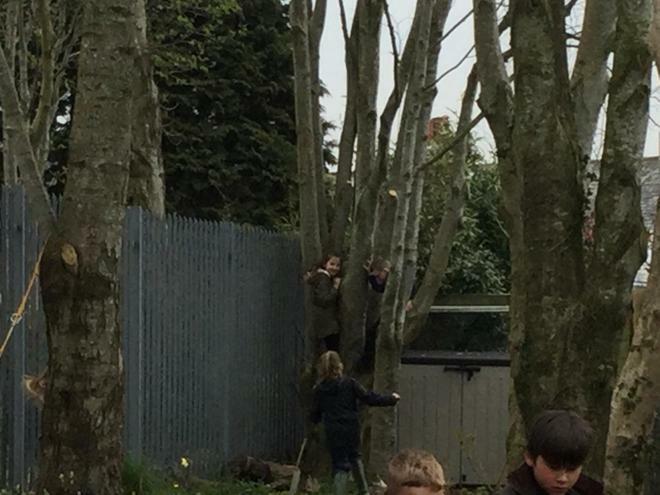 Or that they collected conkers to help make bombs? 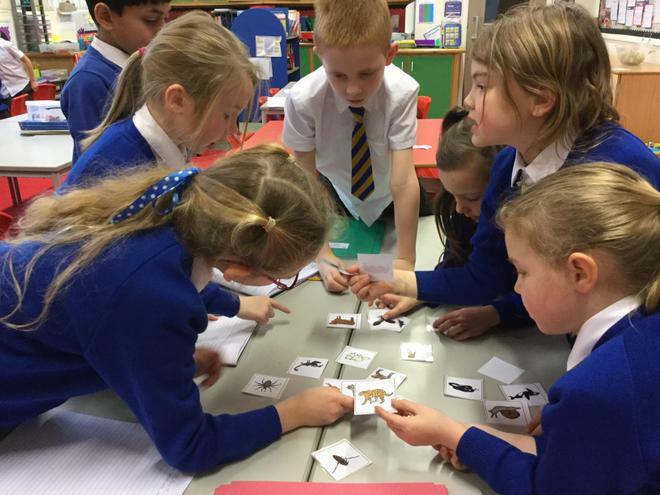 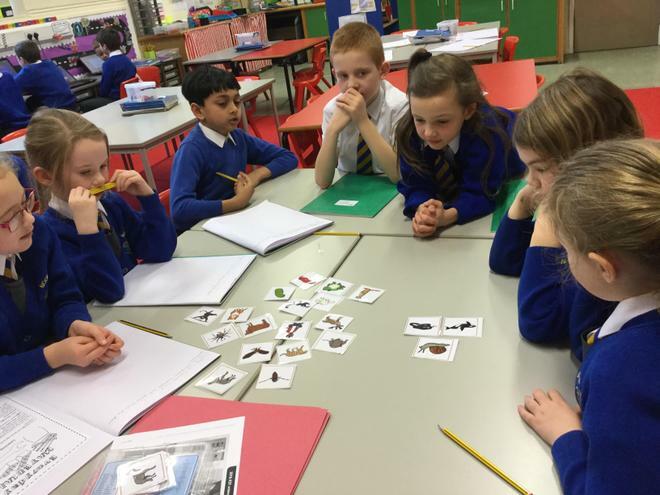 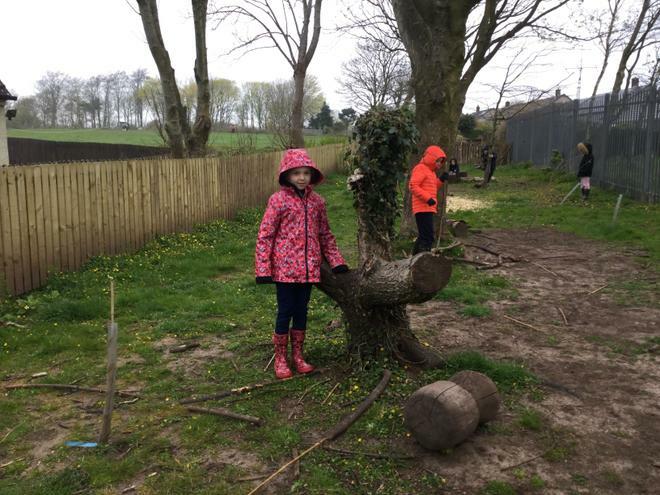 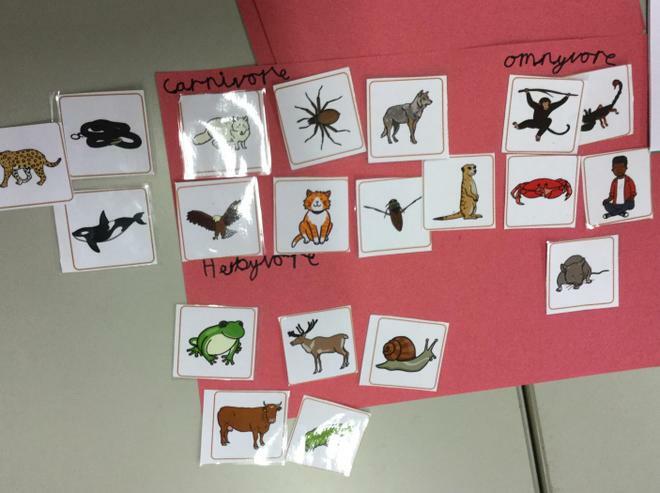 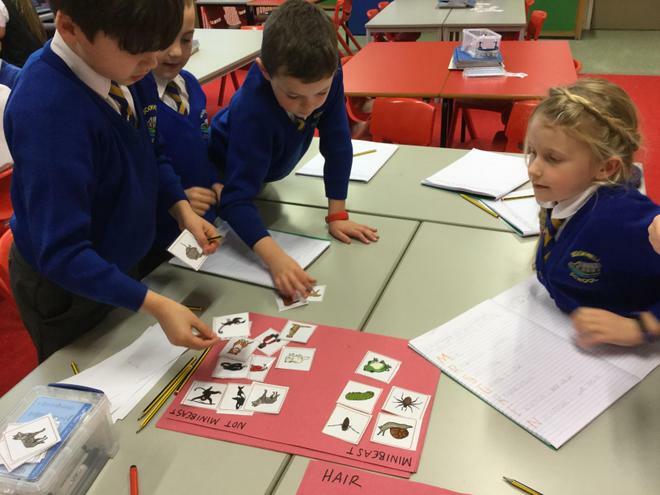 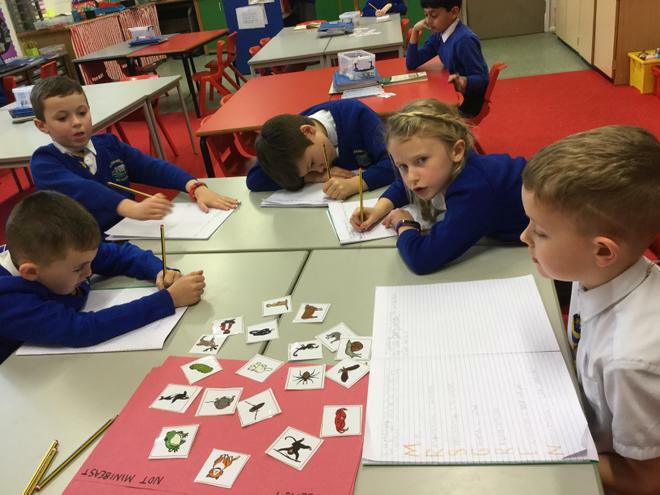 In Science we've been learning about how animals get their food and how this can be shown using a food chain. 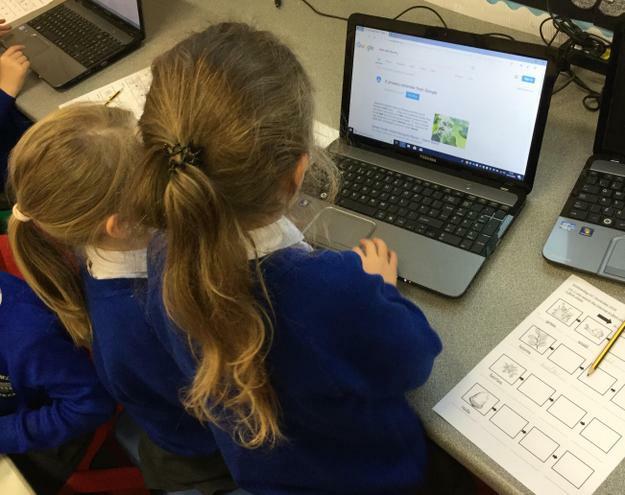 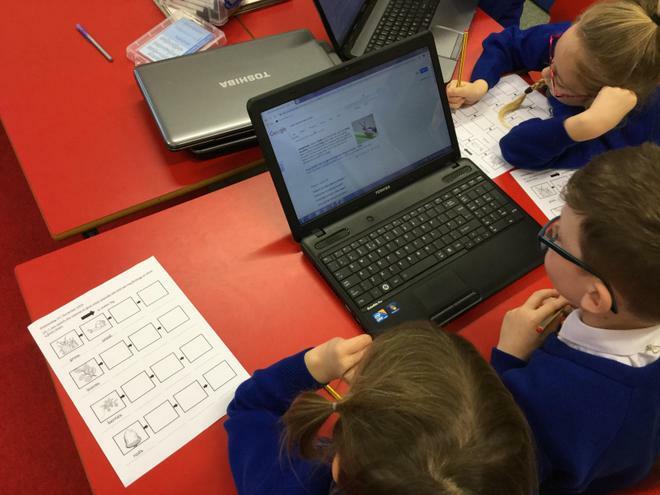 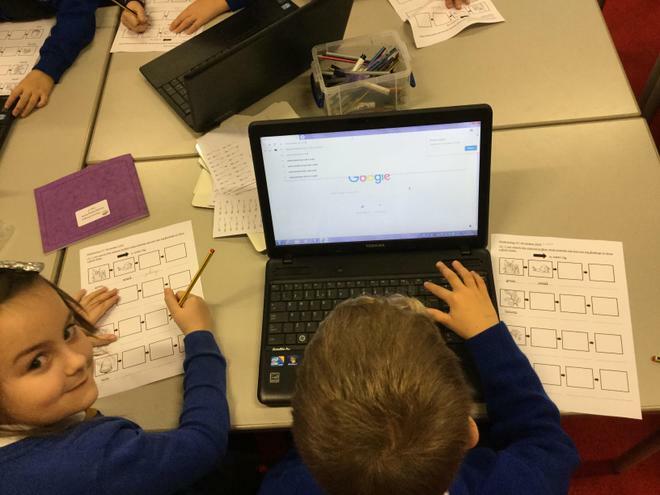 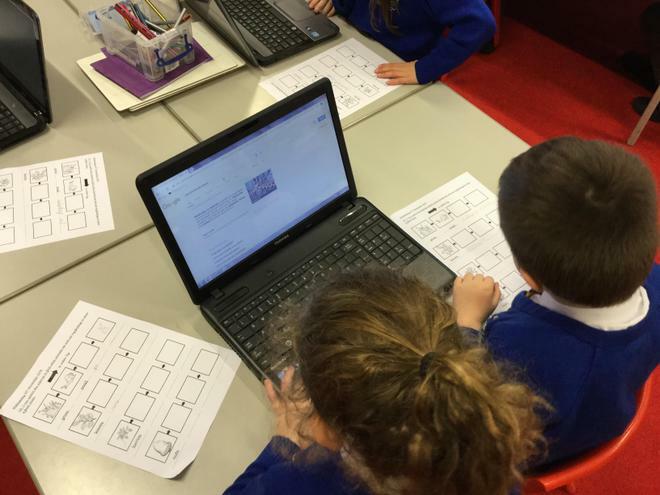 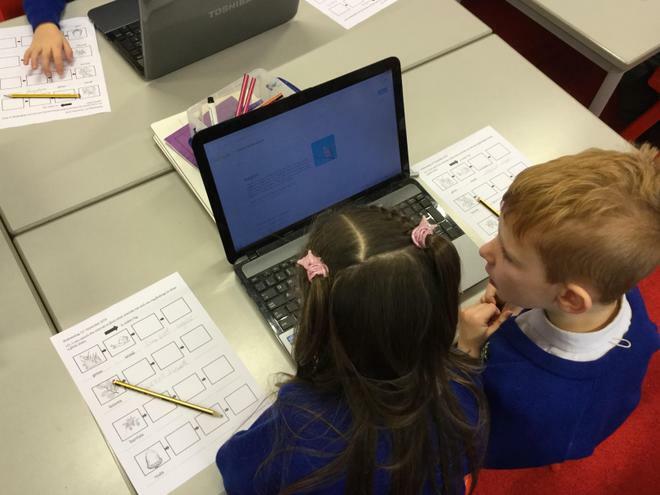 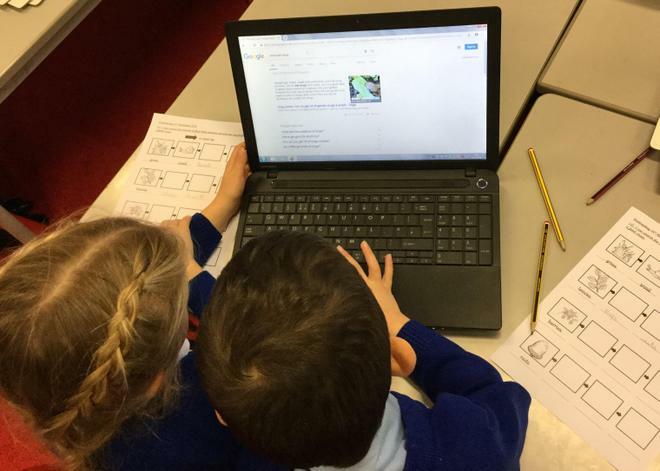 To find out what animals eat, we did some online research using Google to help us draw our food chains accurately. 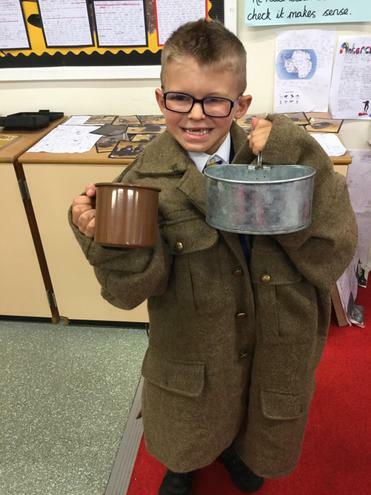 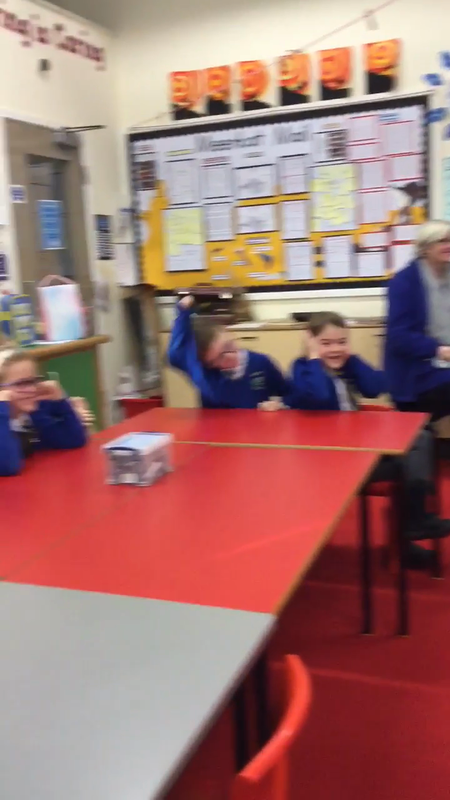 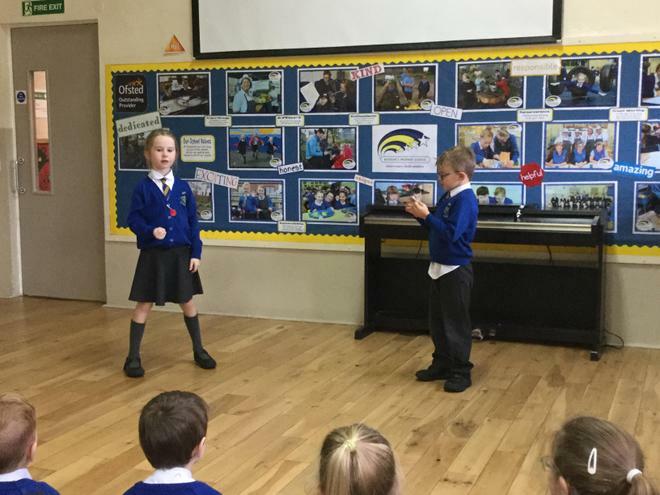 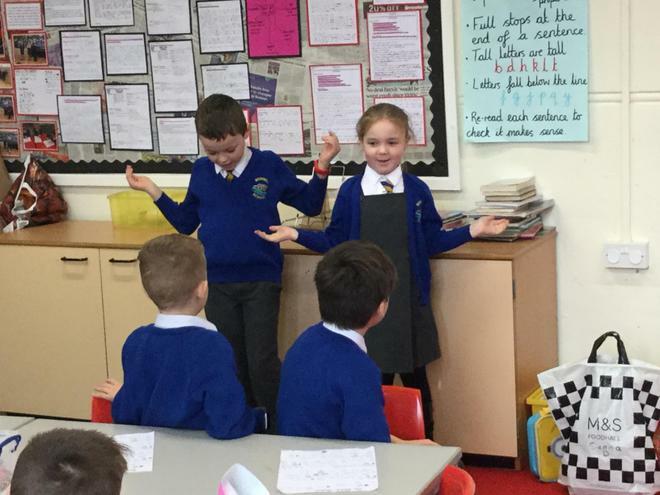 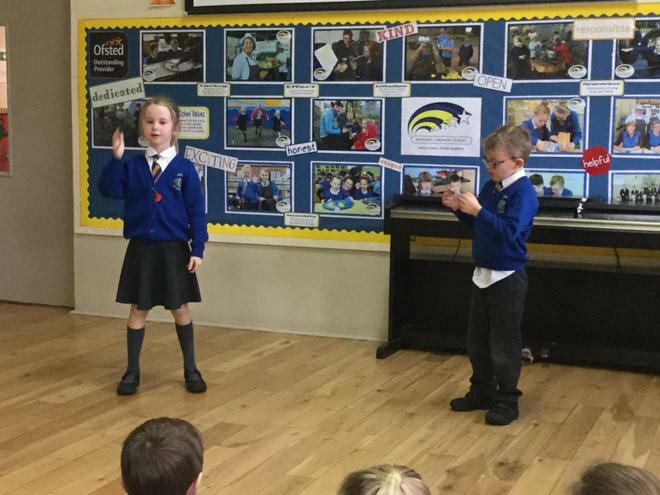 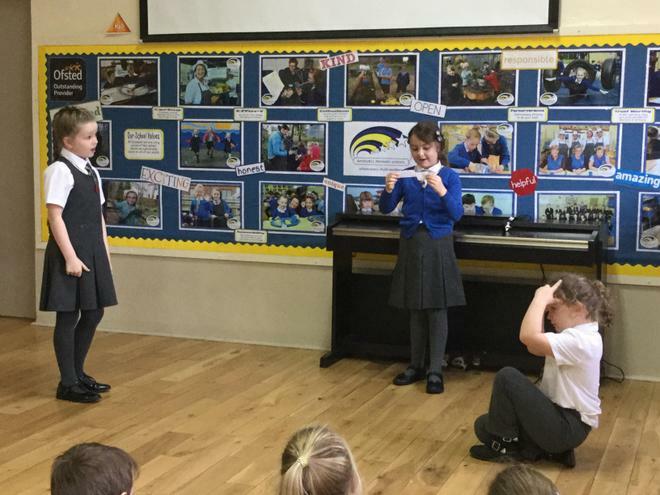 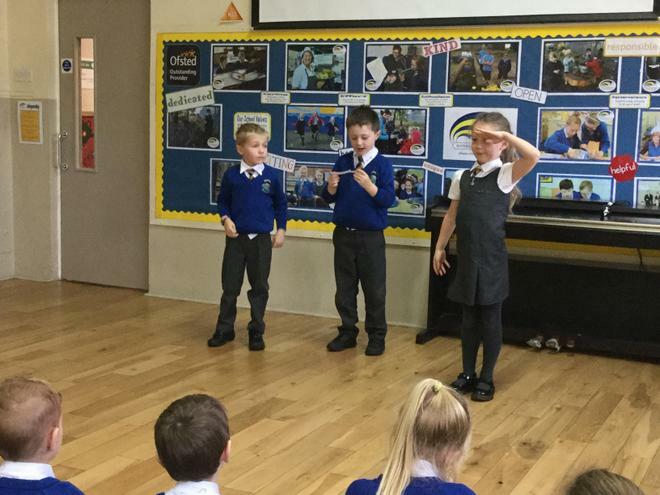 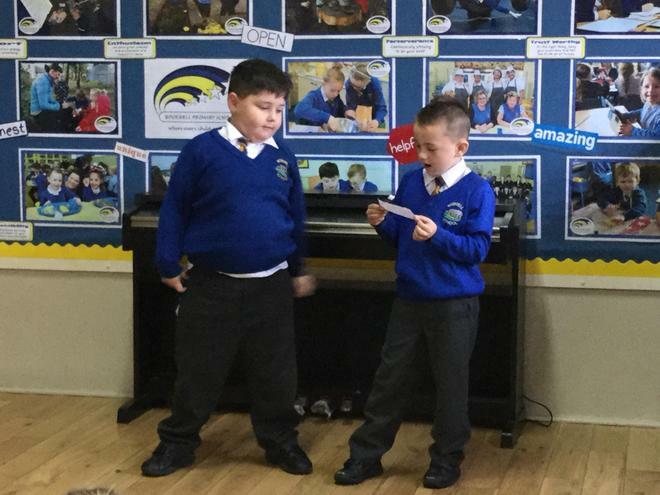 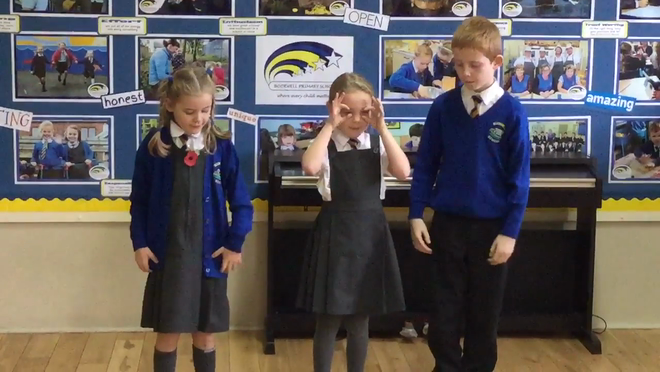 After lots of practise and rehearsals this week, we performed our news report about Ben Routledge's war experience in France to some very excited receptions! 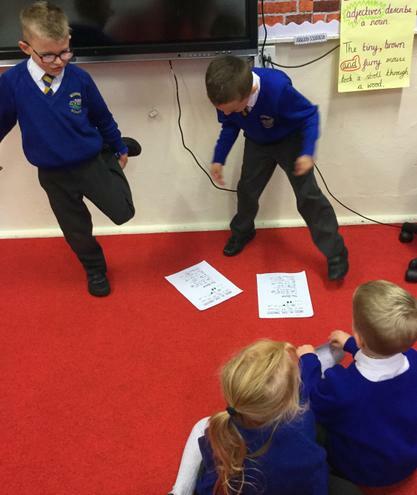 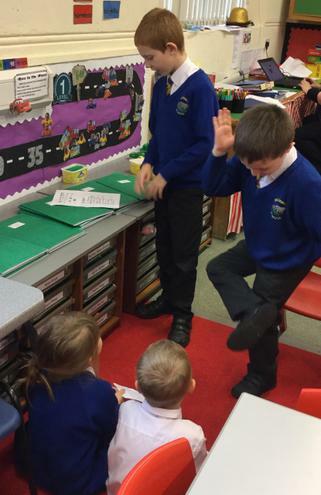 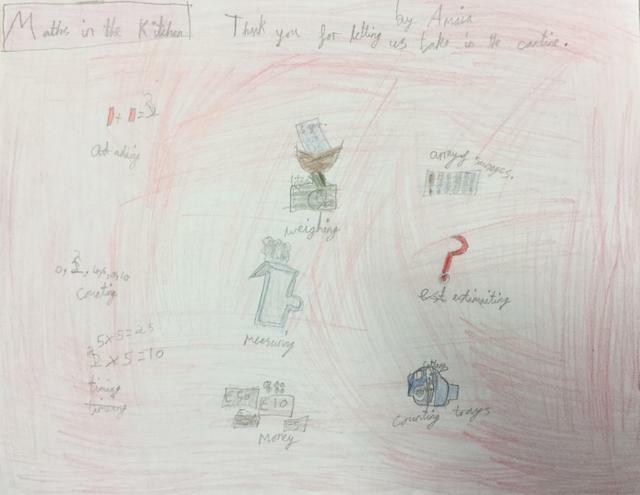 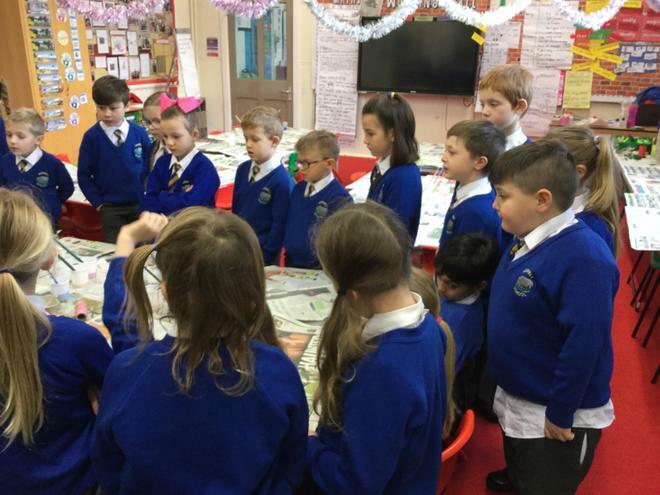 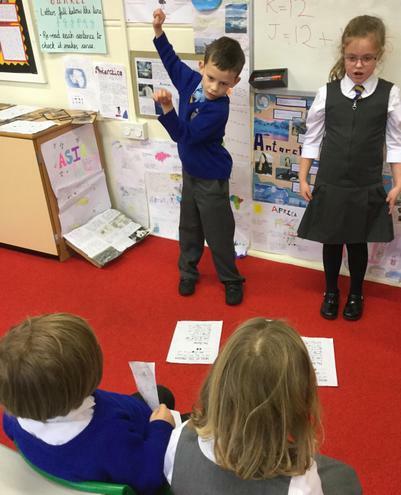 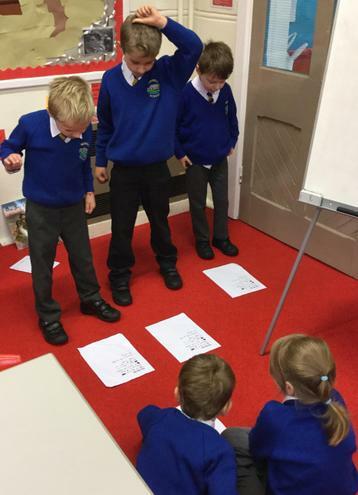 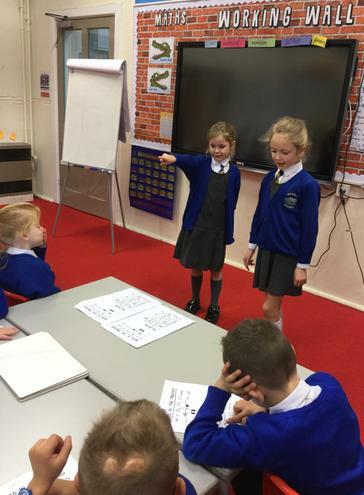 They then performed their story of 'The Little Red Hen' using their story map. 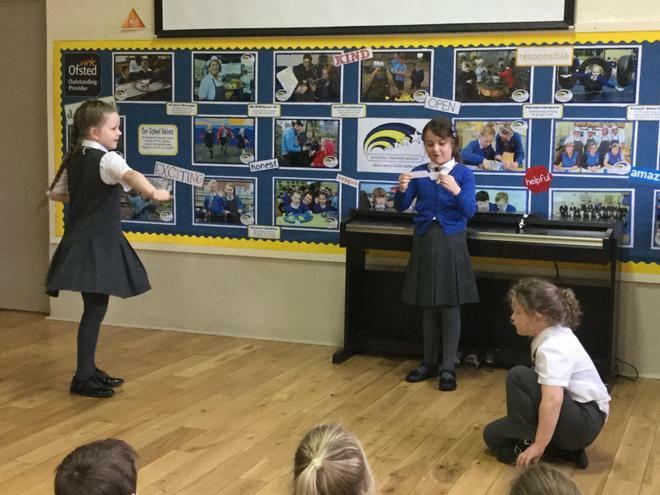 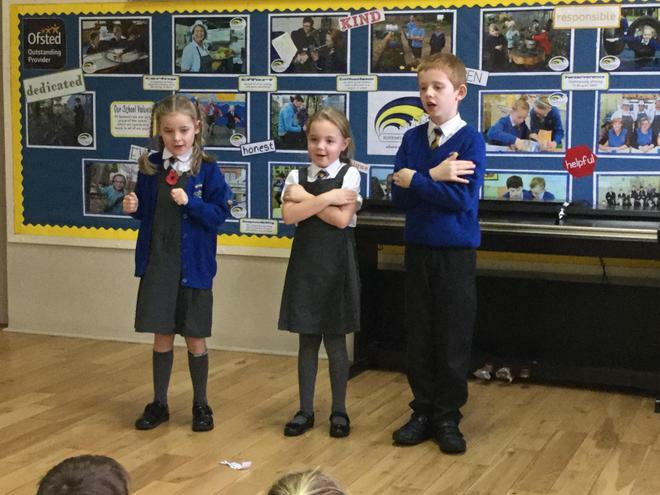 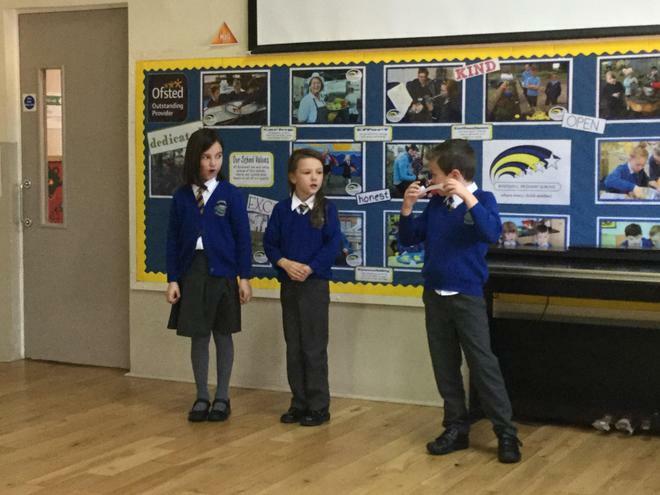 Take a look at our performances! 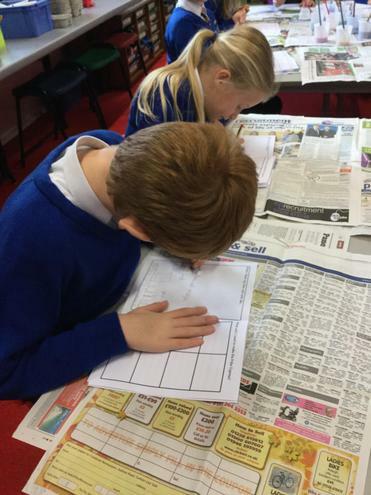 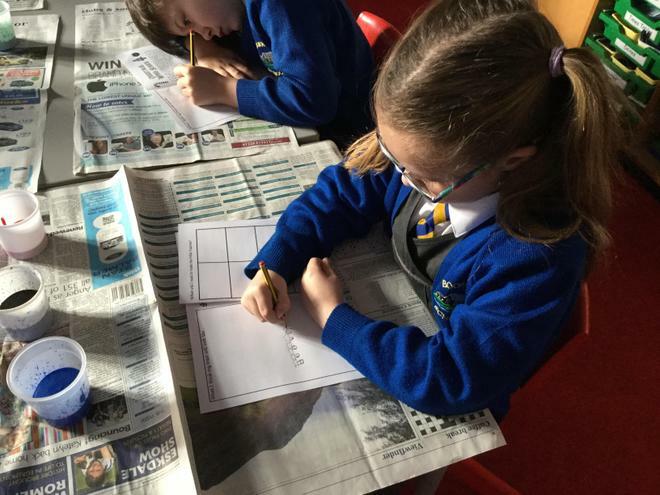 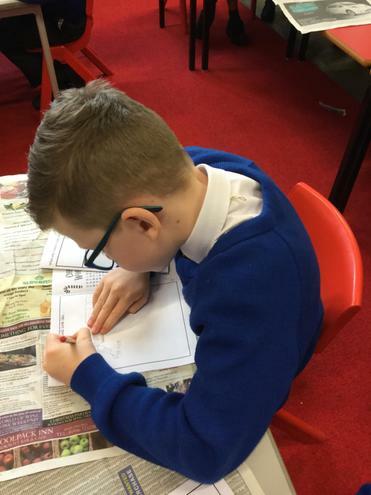 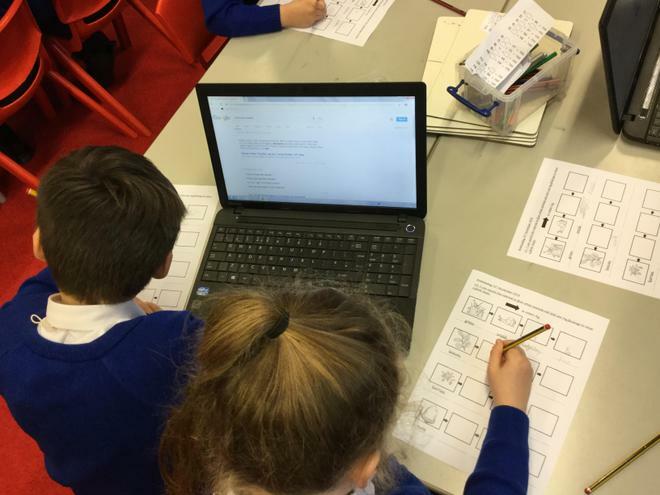 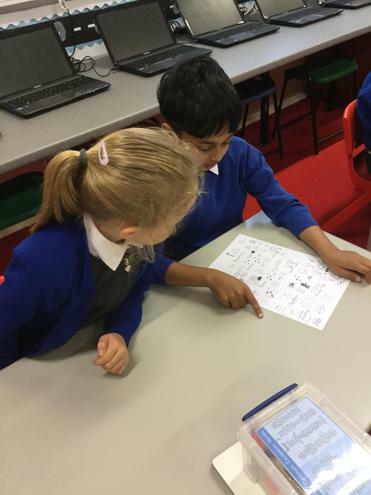 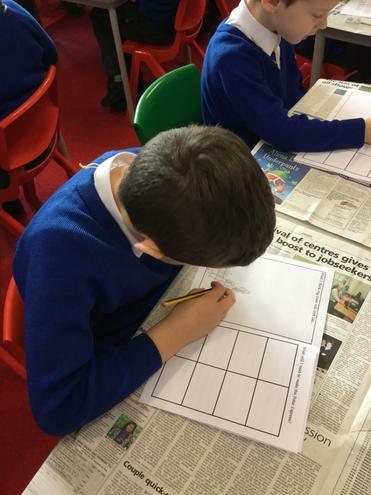 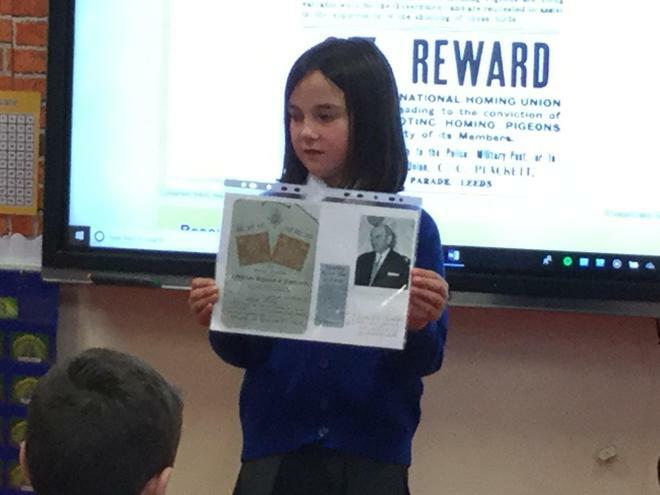 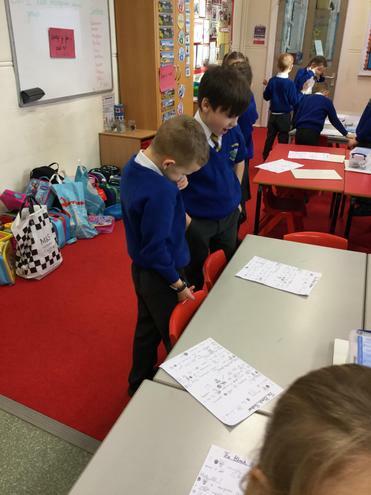 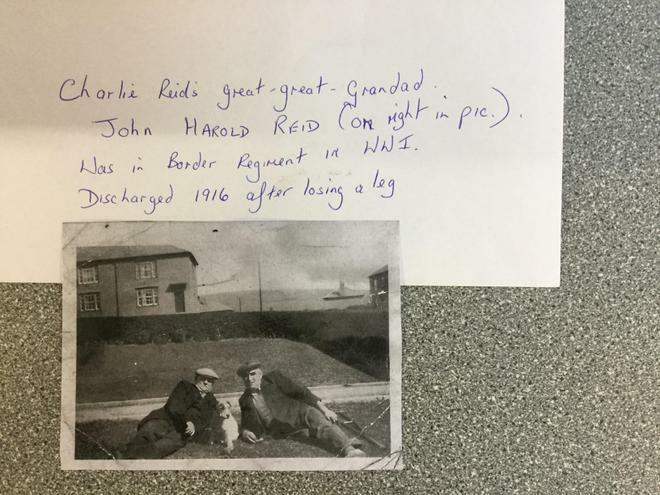 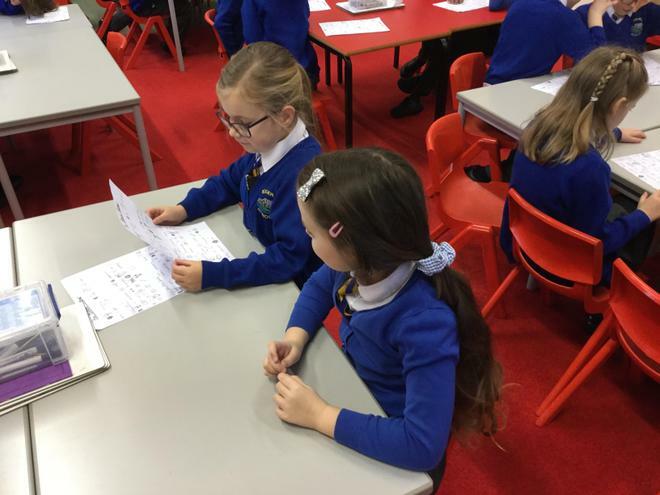 This week we have been learning how news reports can be used to tell true stories of what life was like as a soldier in WW1. 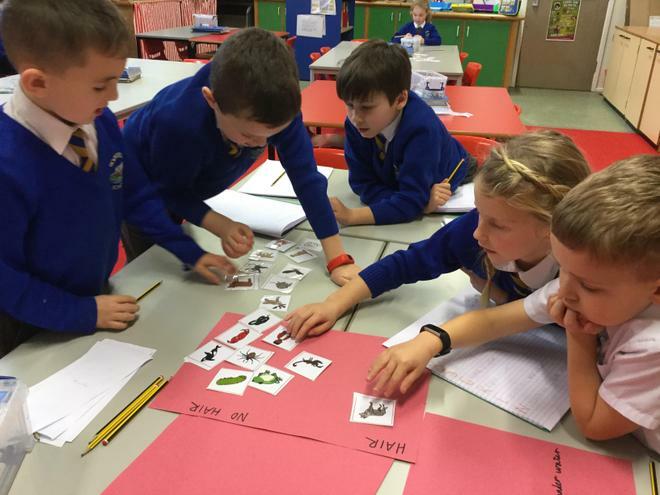 We listened to the report as as text map then practised retelling the report by adding actions as a full class, in groups and then in pairs and trios. 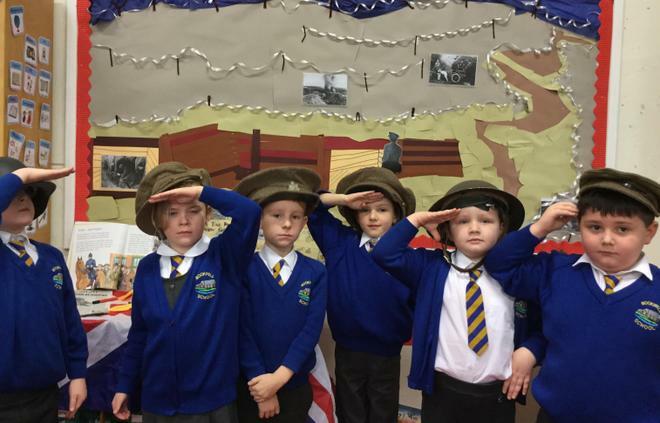 We visited the War Memorial on Main Street during WW1 week to find out how soldiers from our local town are remembered. 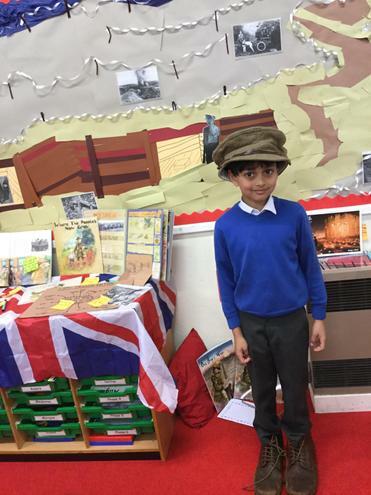 We were shocked by how many soldiers fought and also discovered that many were killed in France, Belgium and Gallipoli. 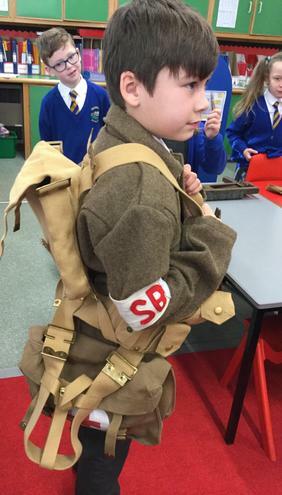 Year 2 have been so captivated by our WW1 topic that they've discovered some of their own family were soldiers who fought on the battlefield. 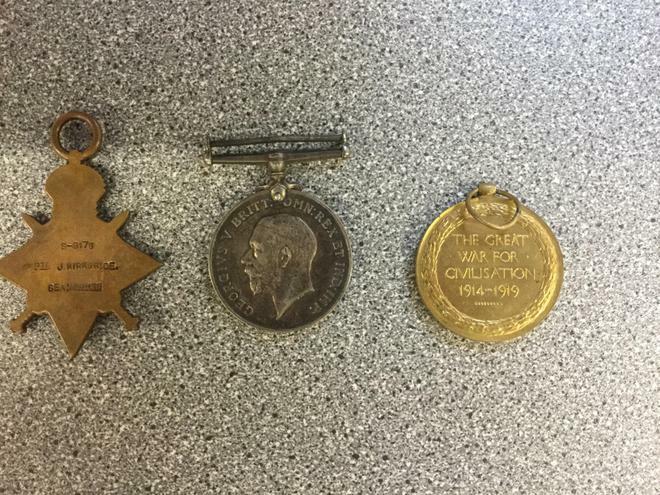 Take a look at some of the medals, photographs and books some of the children brought in from home. 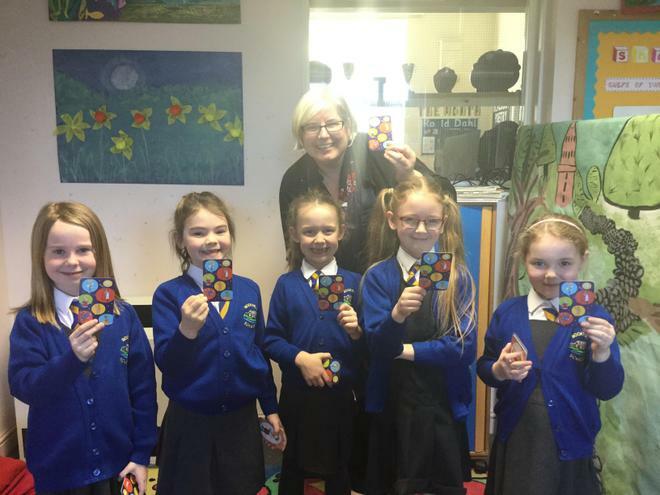 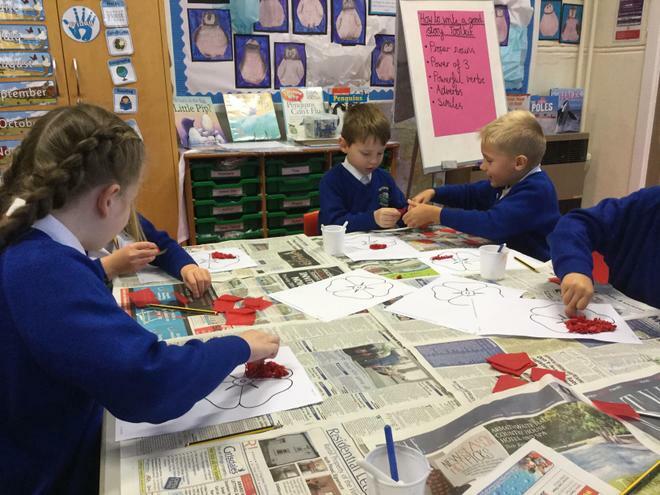 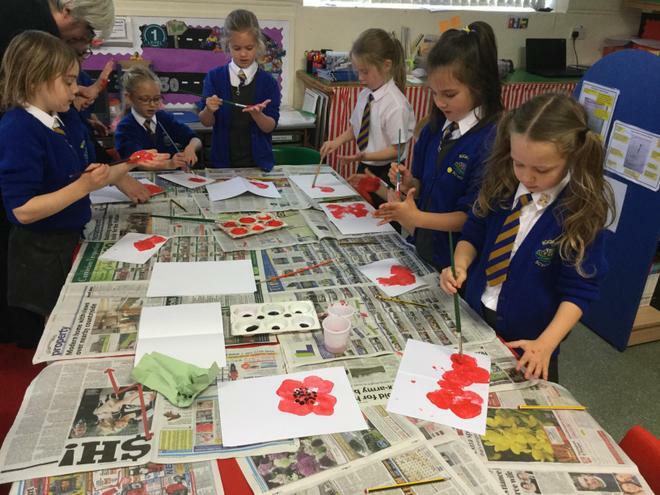 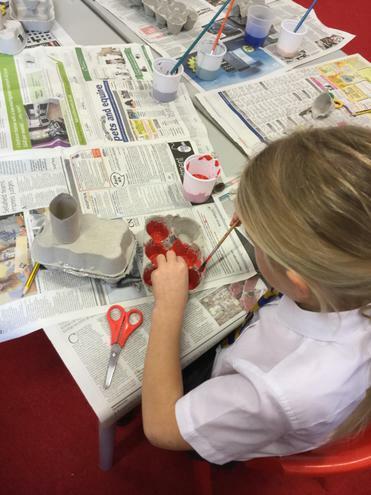 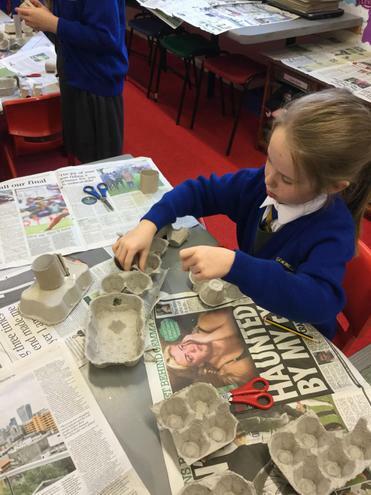 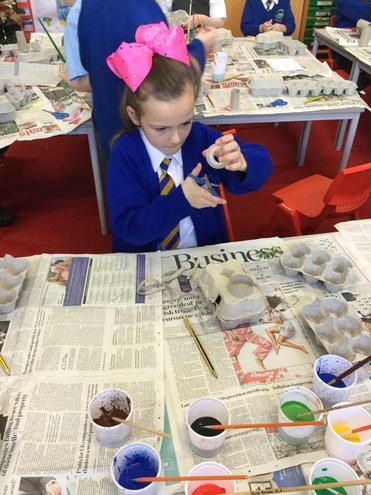 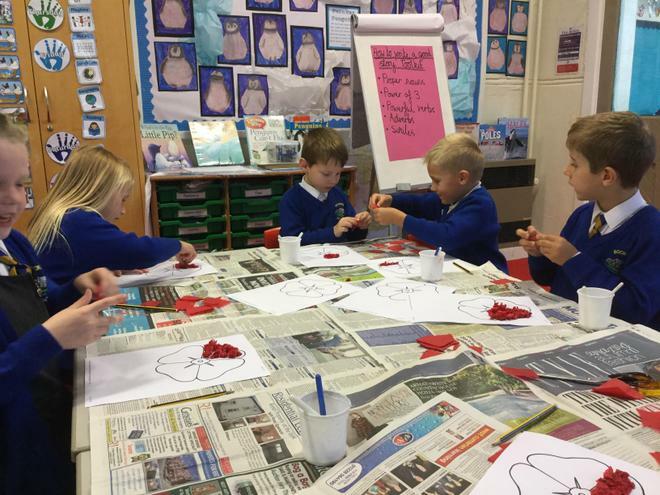 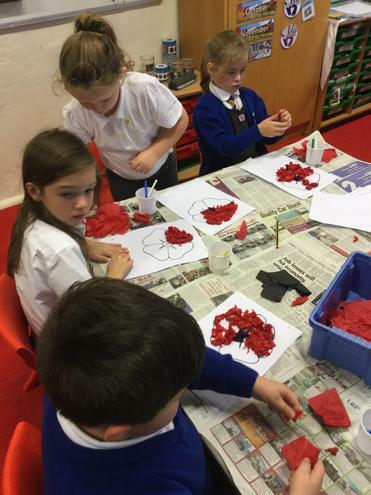 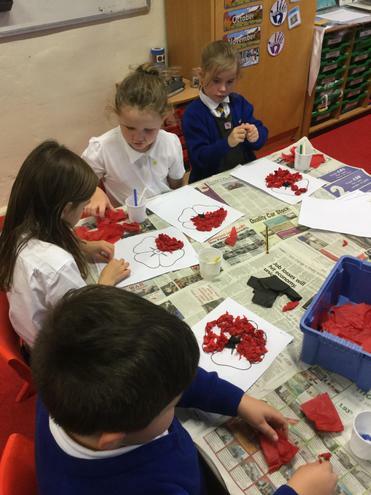 We have been making poppies to prepare for the centenary of the First World War. 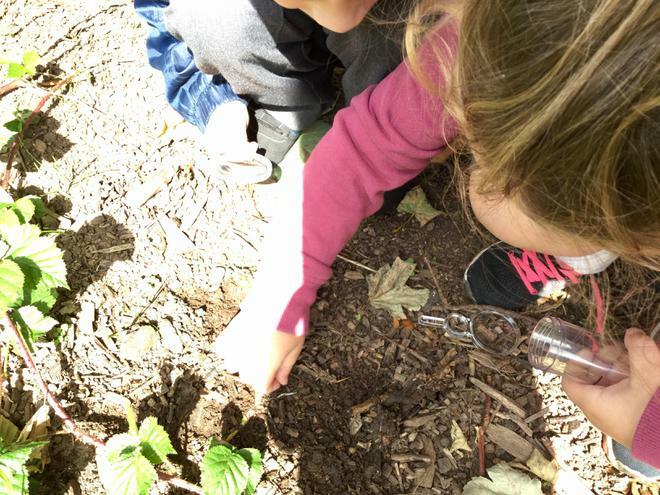 Keep your eyes peeled to see where they crop up in school. 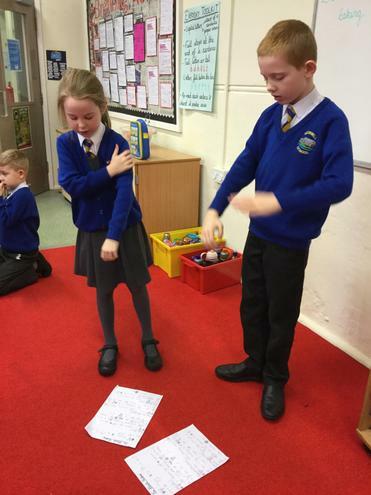 Today we listened to the story of Meerkat Mail by Emily Gravett using a story map. 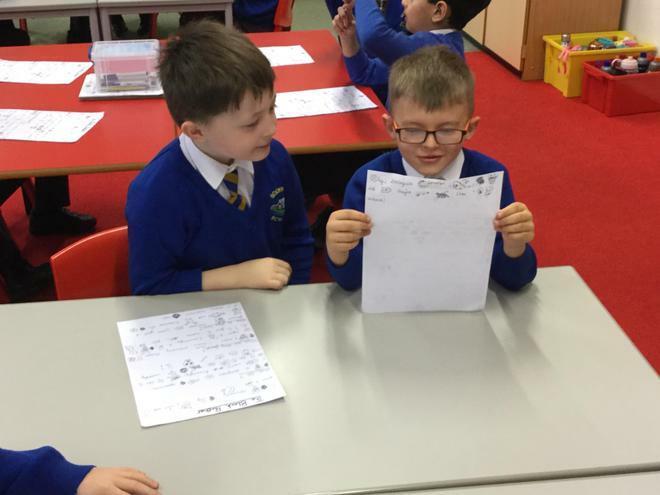 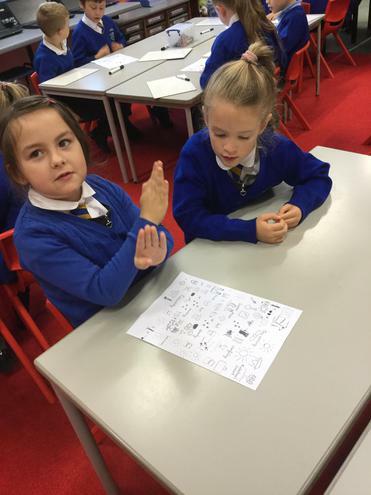 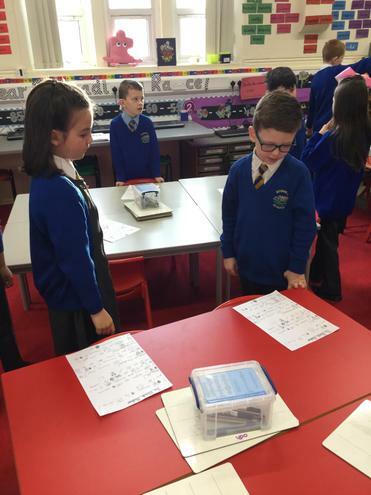 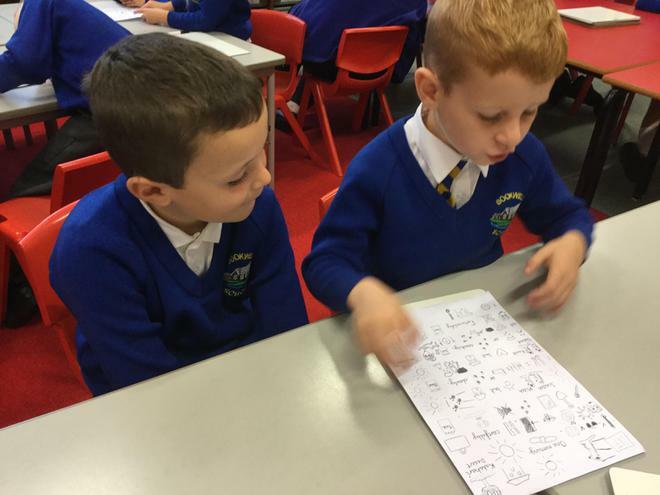 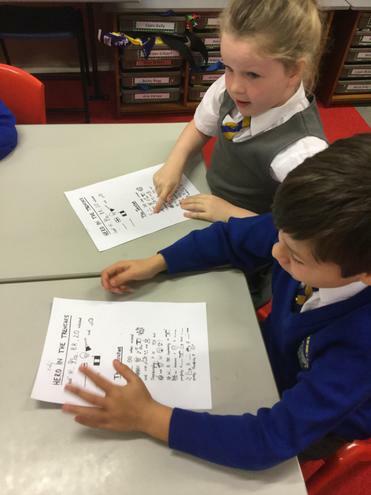 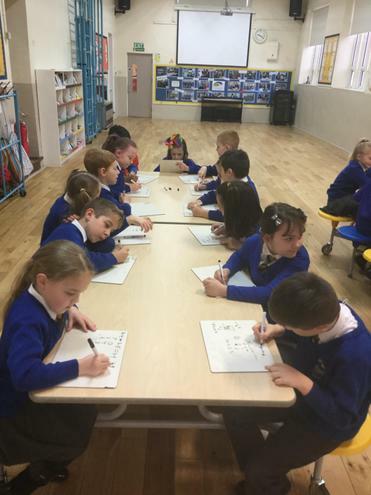 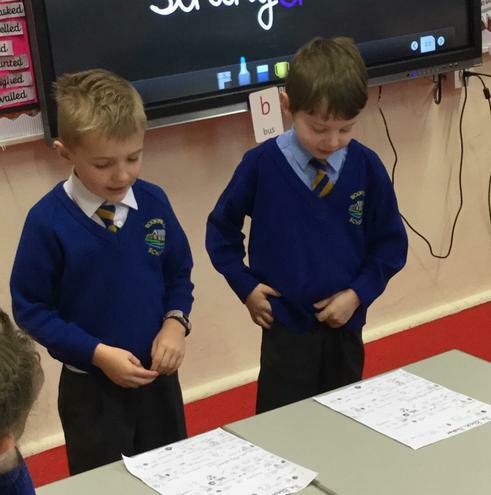 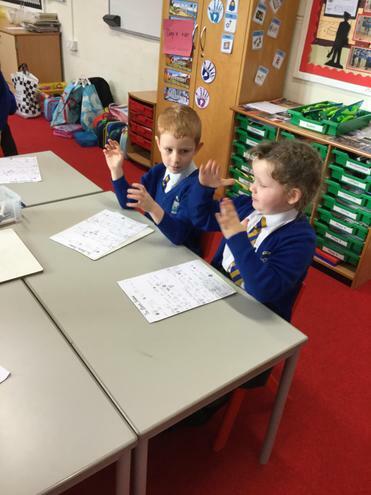 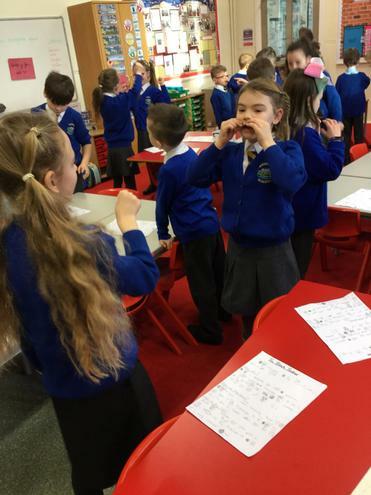 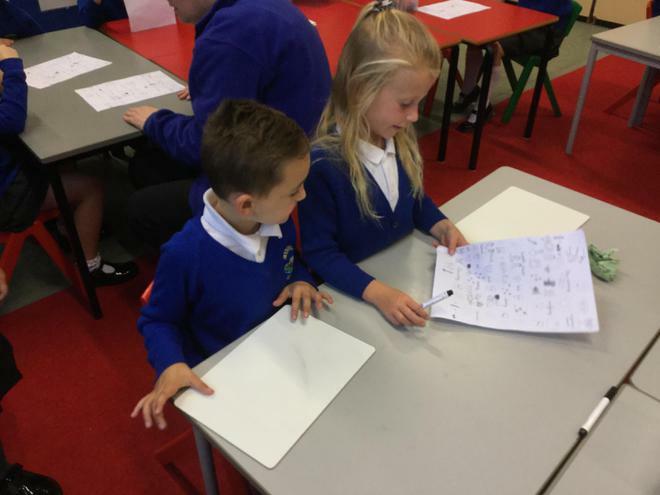 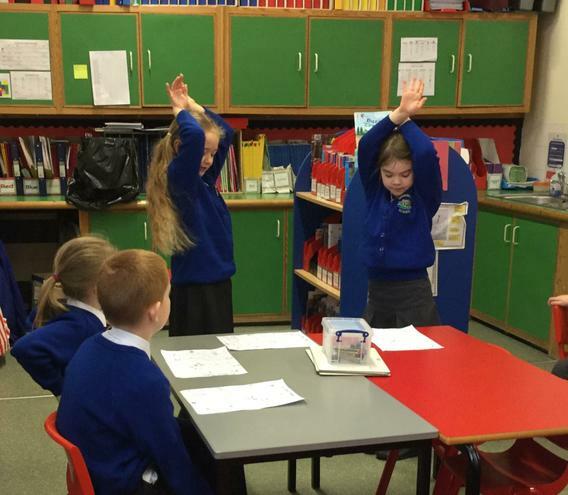 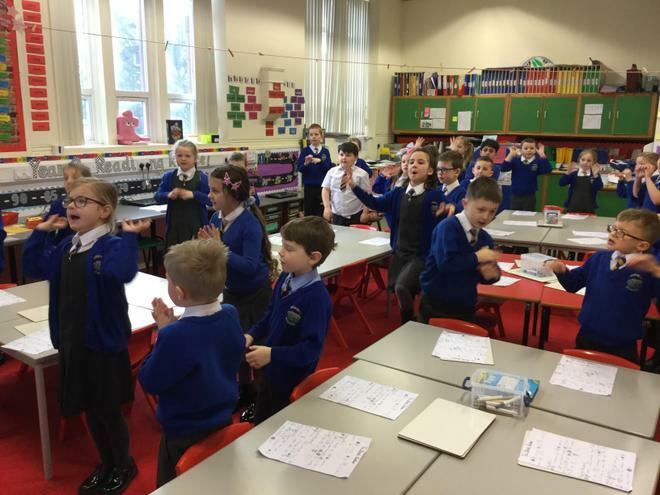 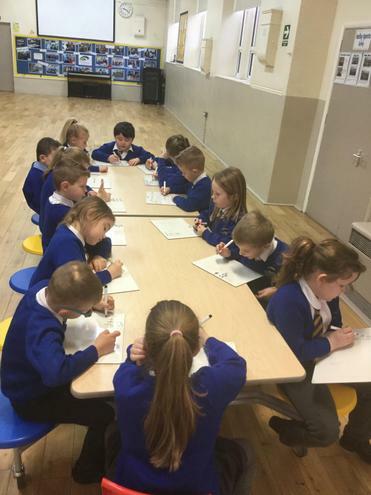 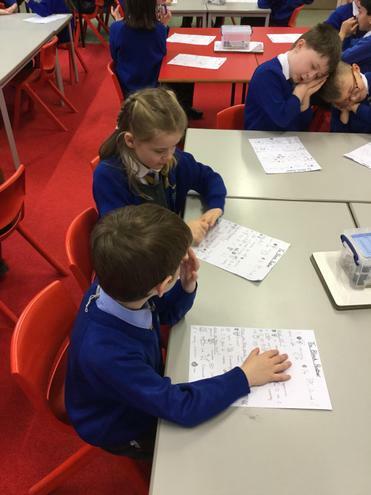 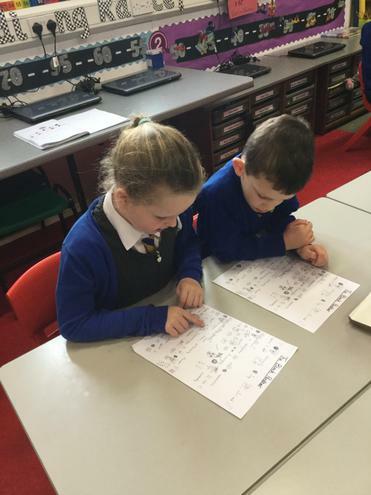 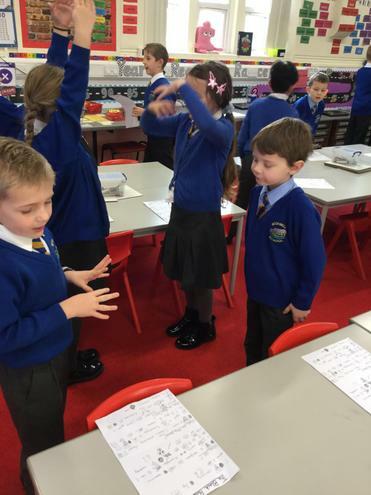 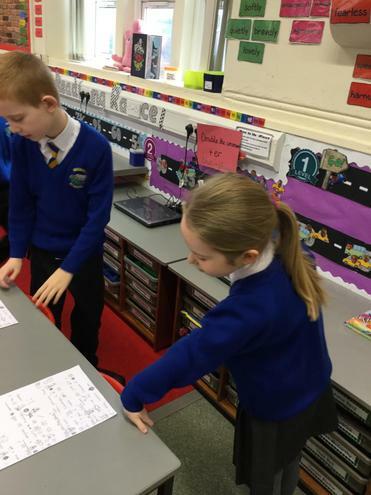 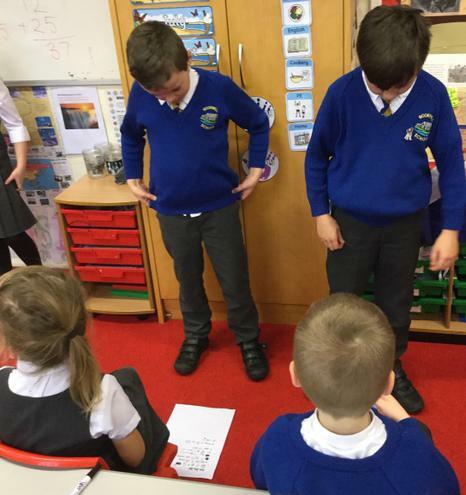 We then worked together in pairs to retell the story and add actions to help us remember. 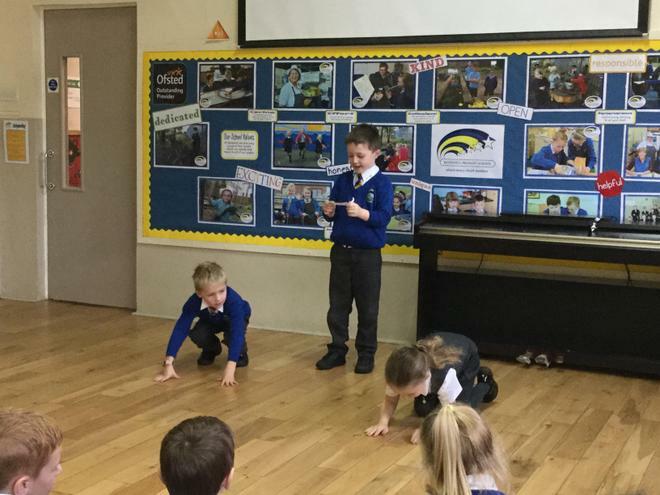 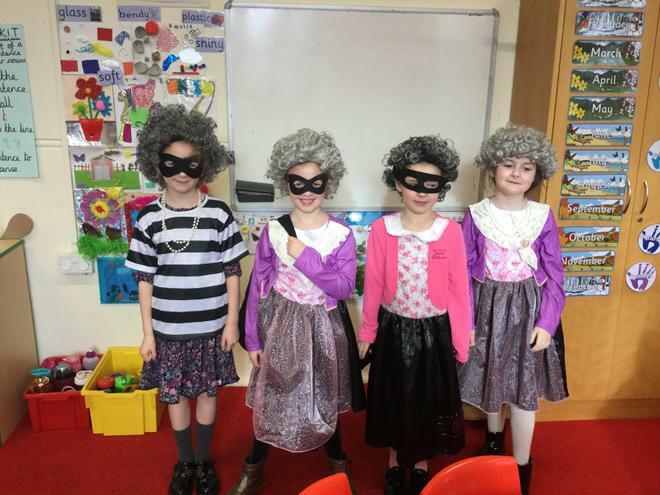 Year 2 are excited to perform the story to the receptions later on in the week. 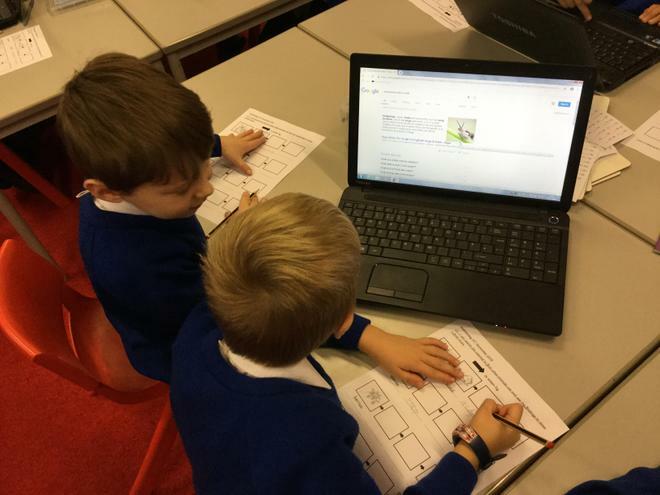 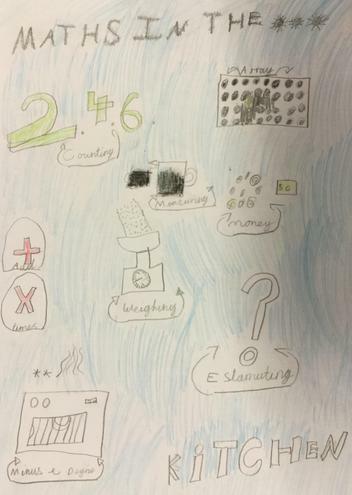 Why not use the story map at home for some extra practise! 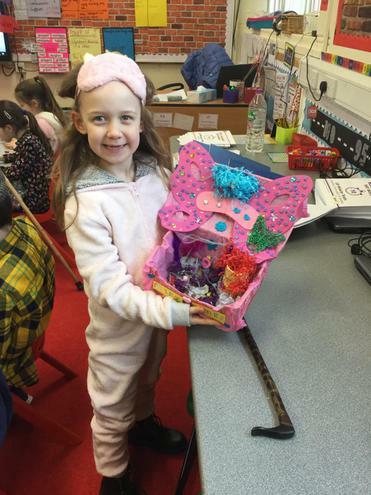 We had a strange parcel arrive at school today, it was a mysterious suitcase packed with lots of unusual things. 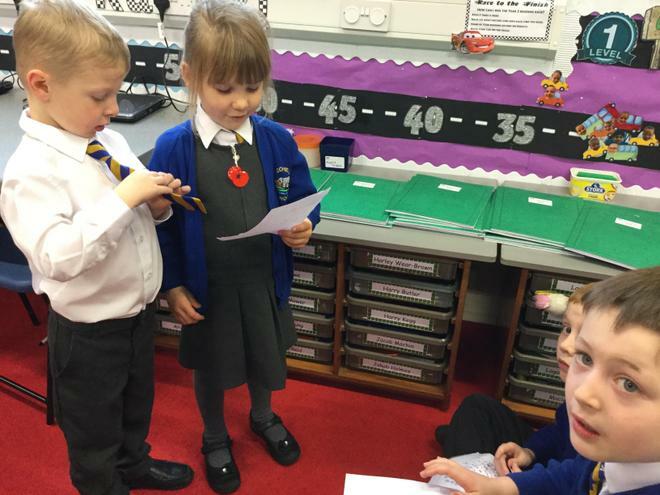 Before we read the letter, we wrote lots of questions to try and find out who the mysterious suitcase belonged to. 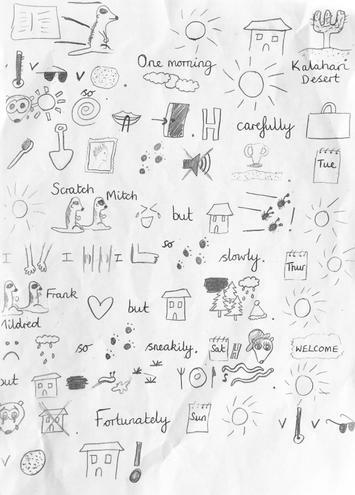 Later on we discovered it was a letter from Sunny himself! 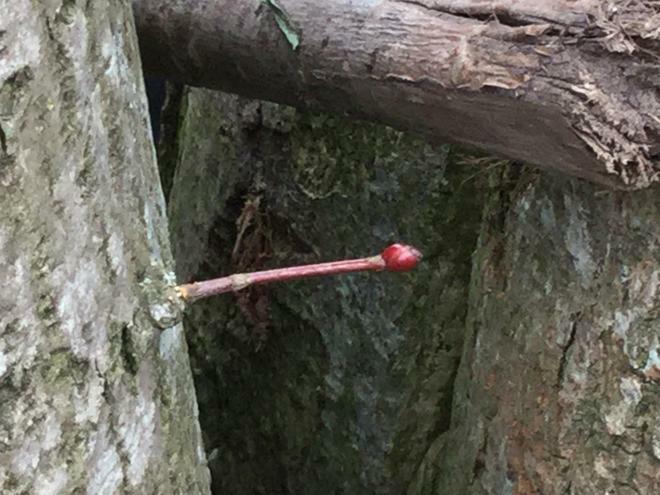 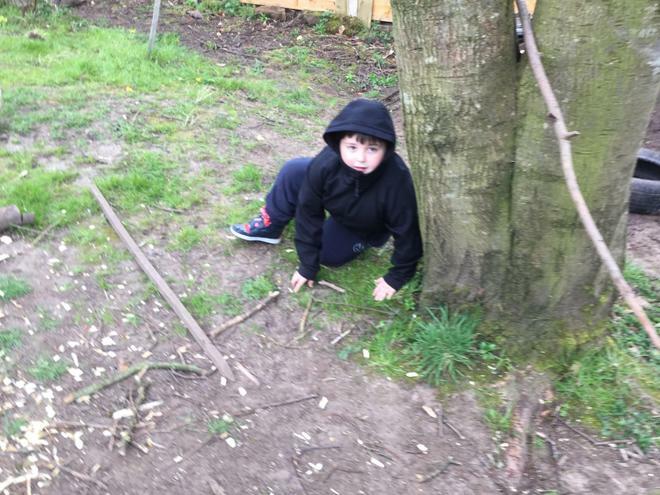 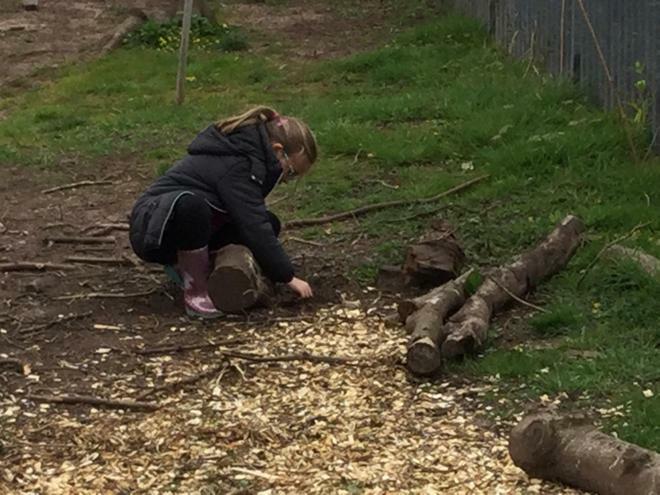 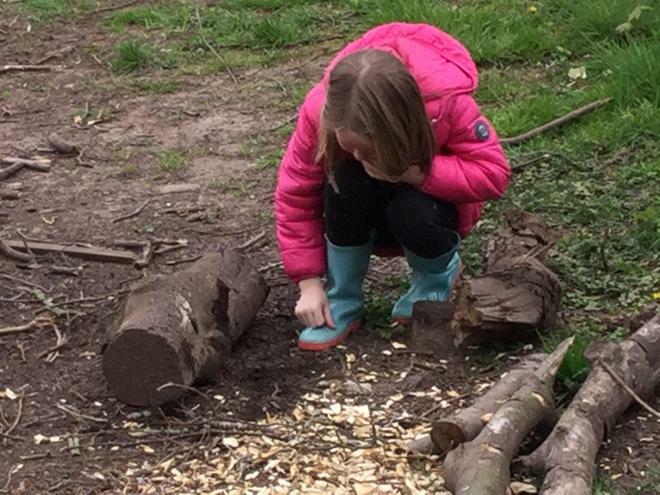 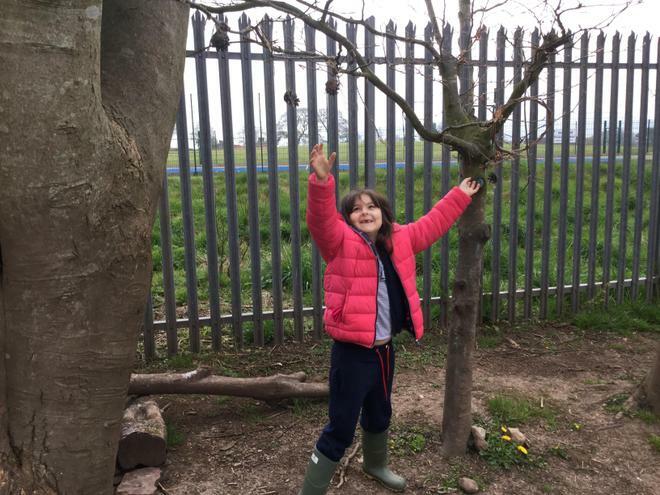 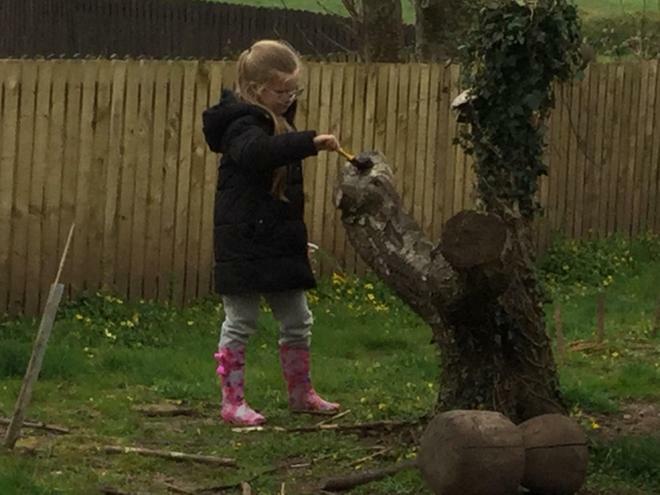 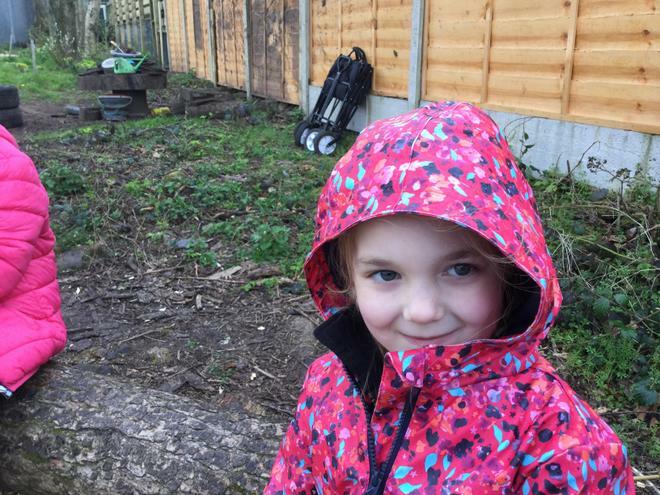 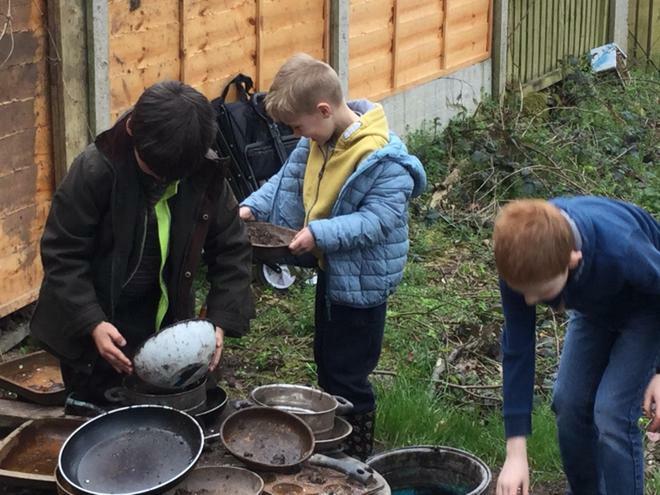 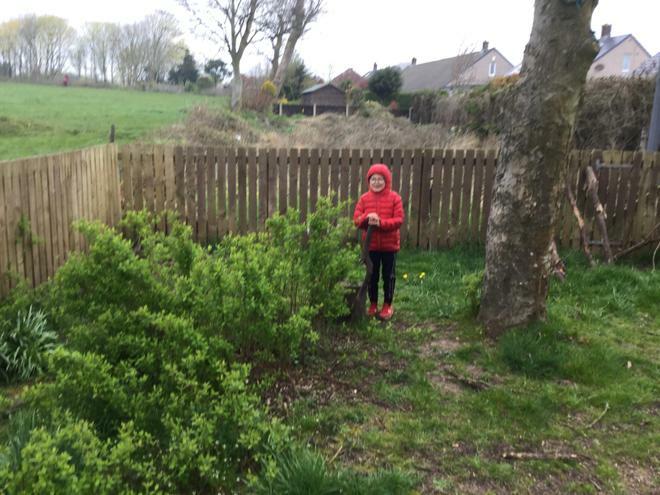 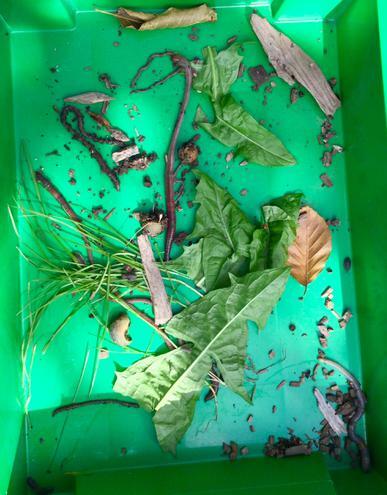 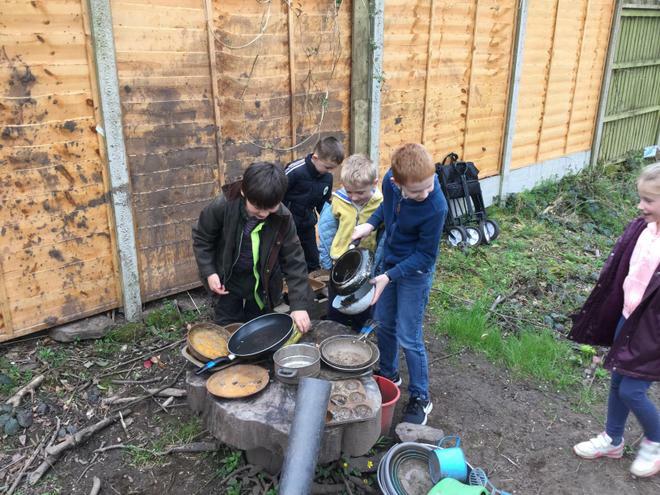 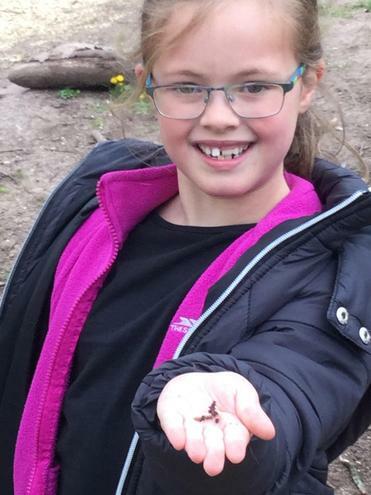 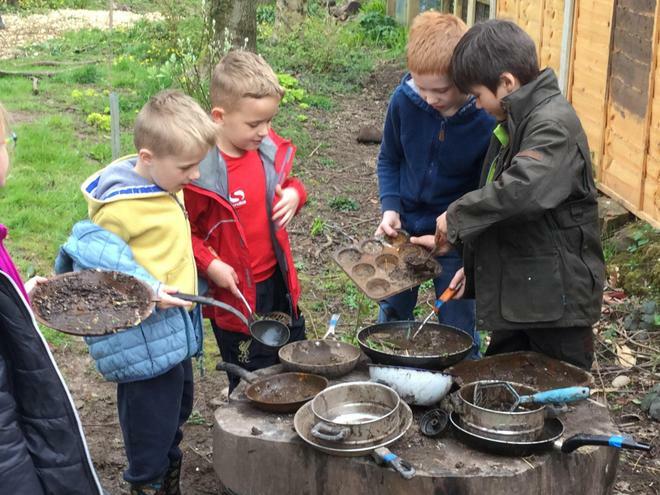 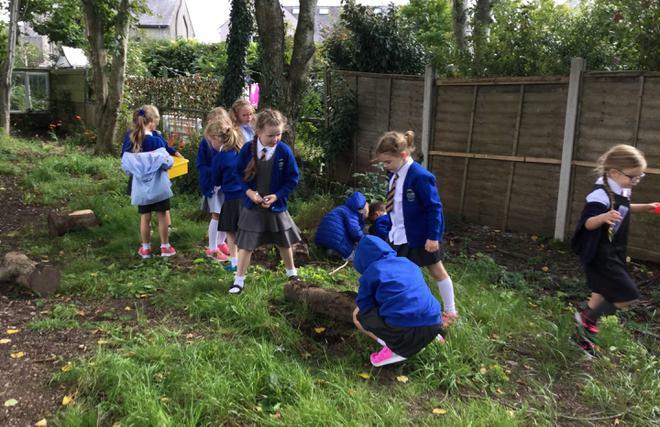 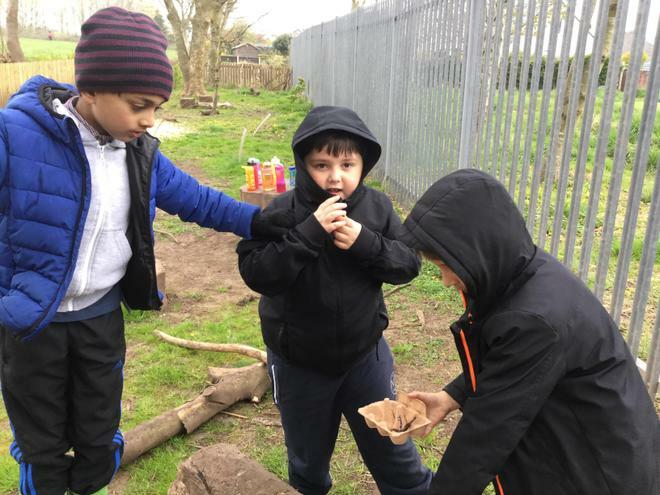 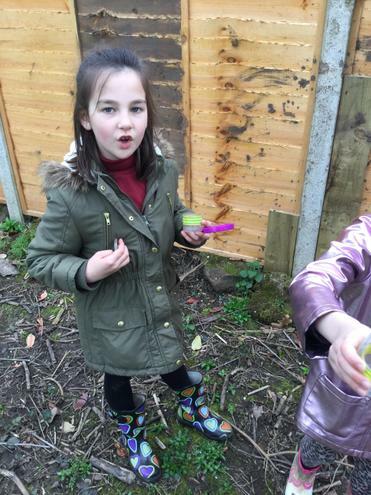 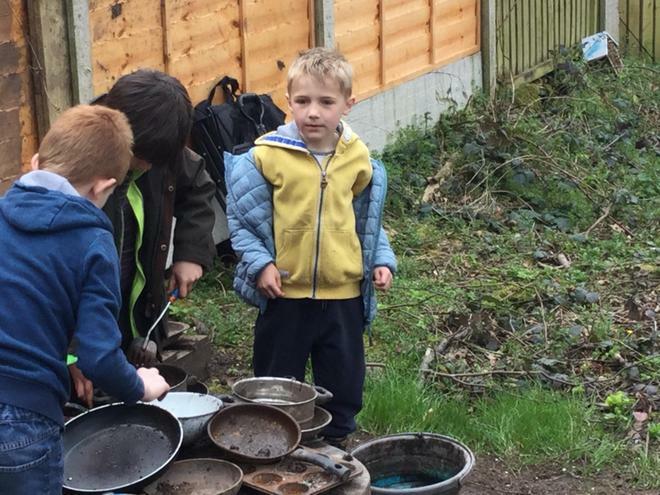 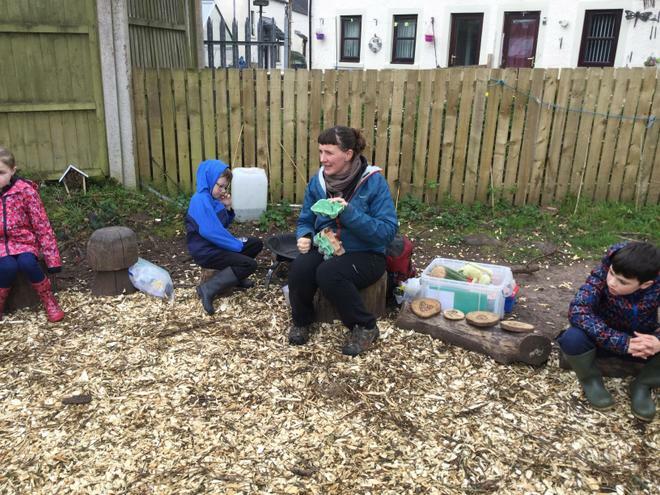 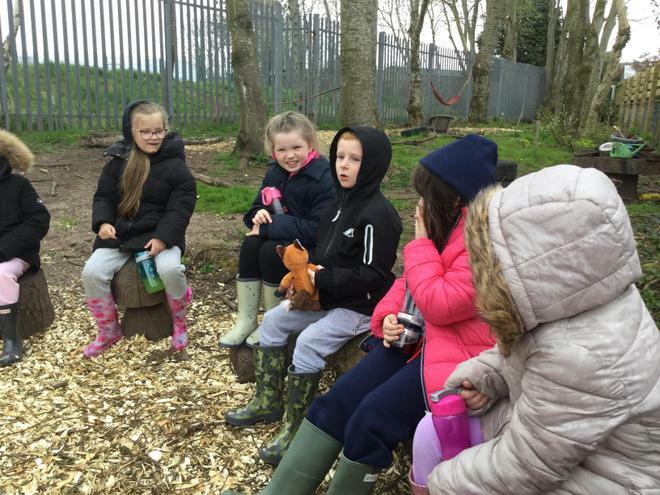 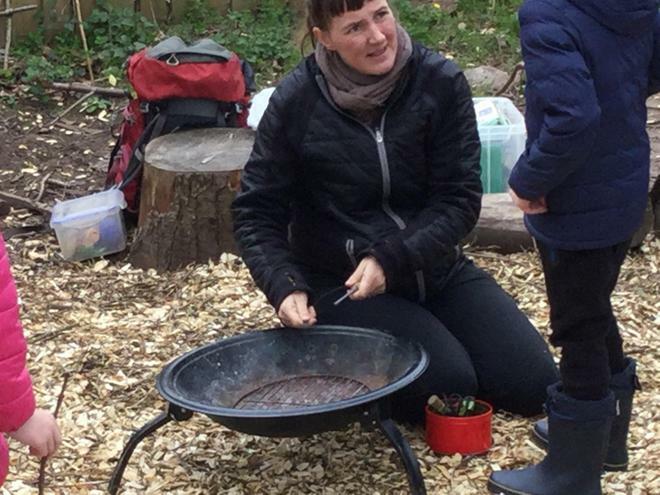 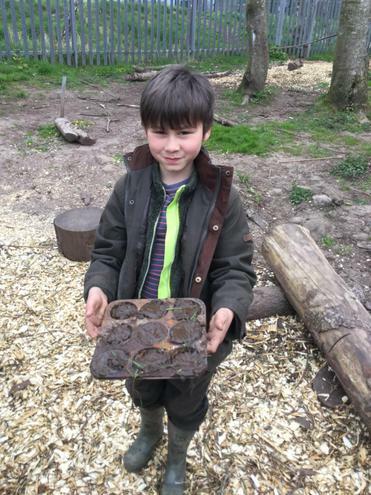 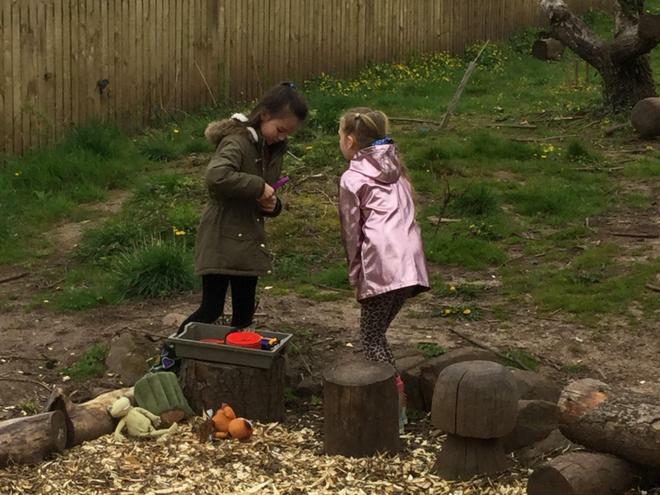 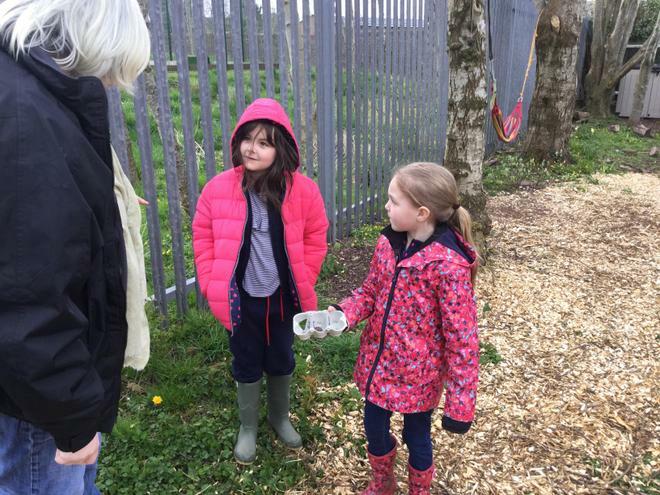 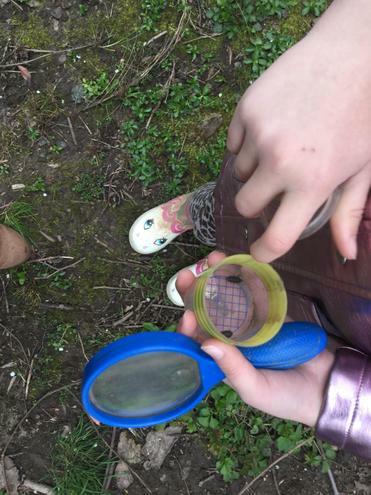 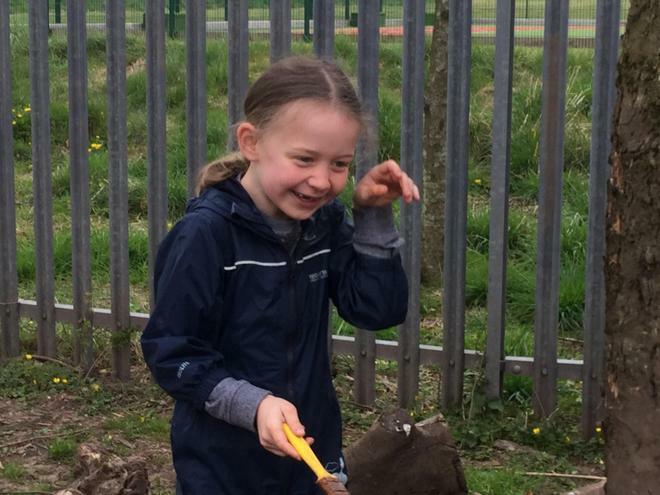 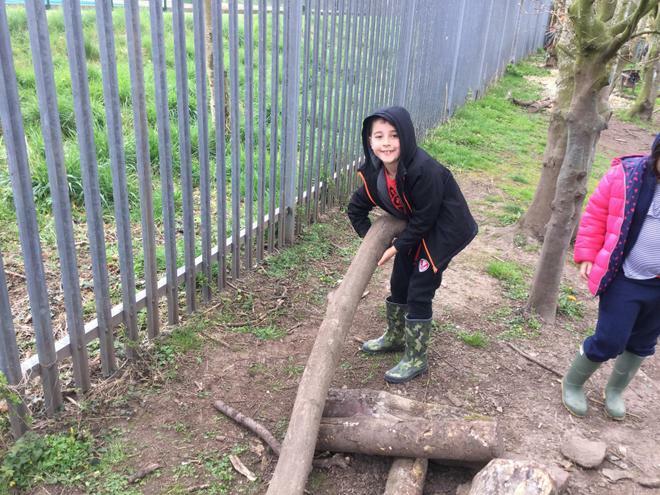 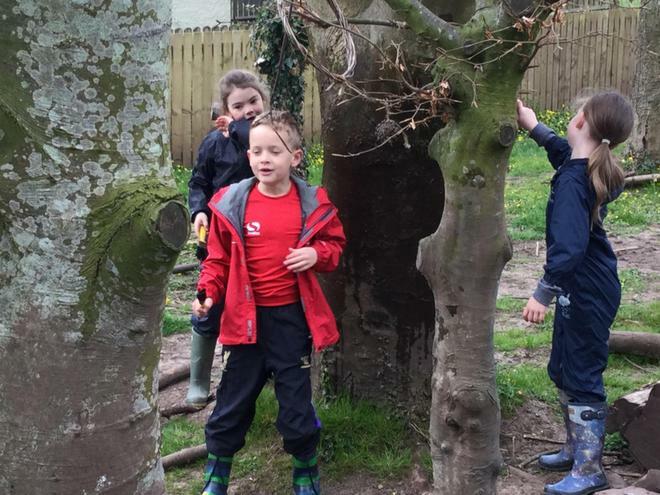 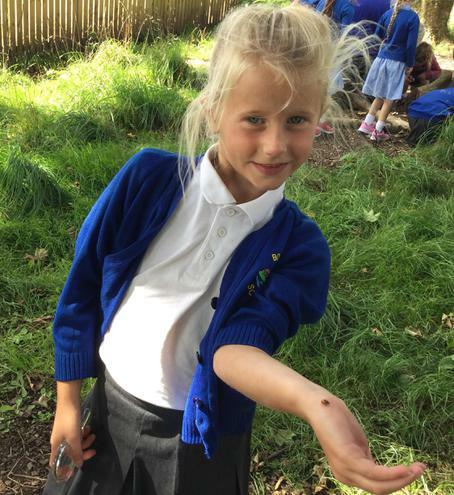 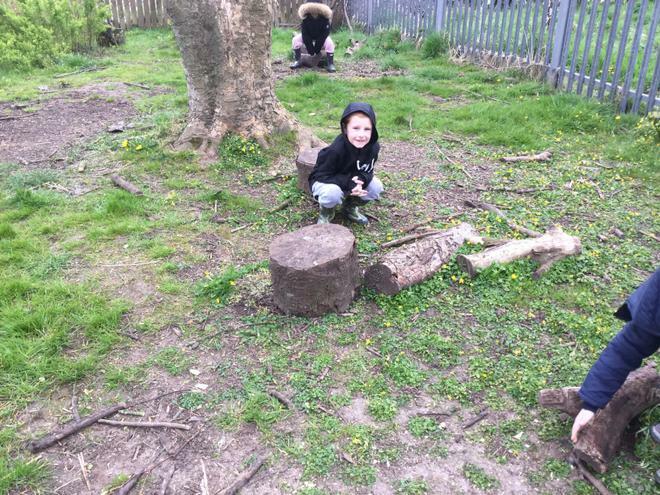 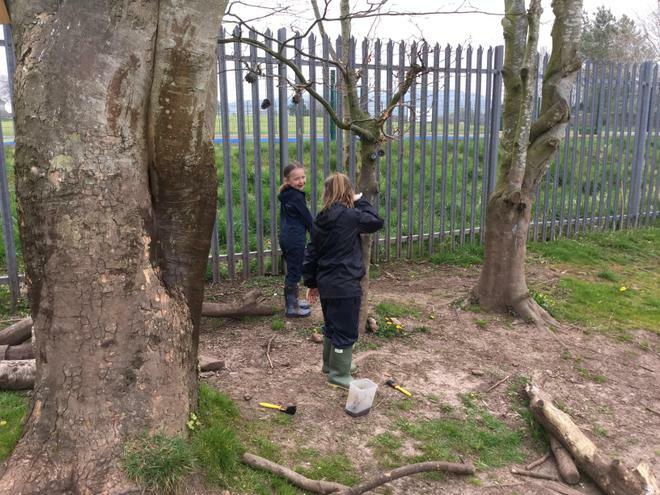 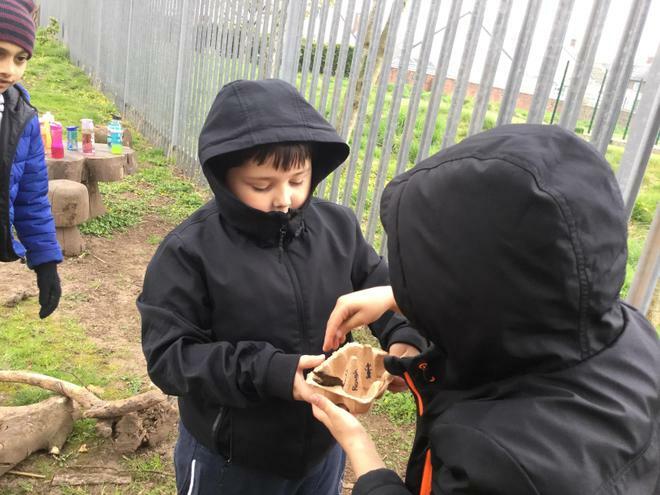 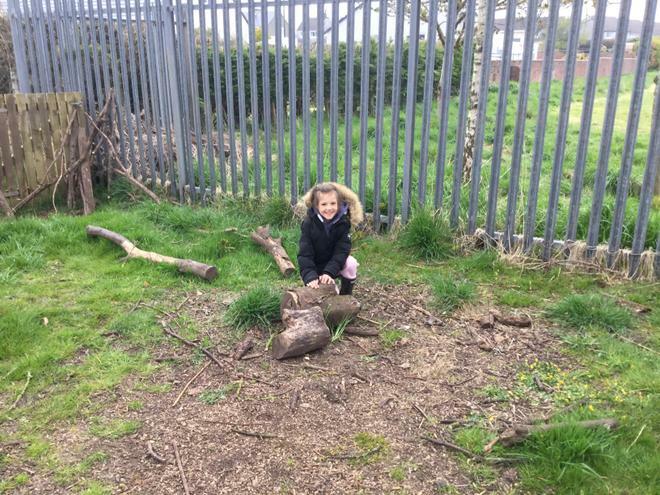 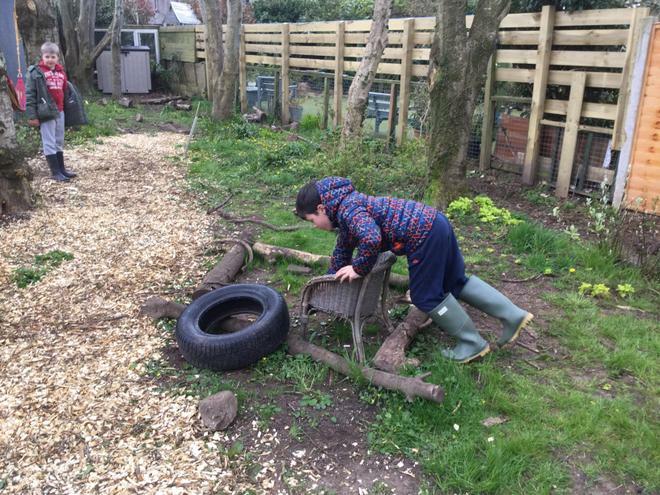 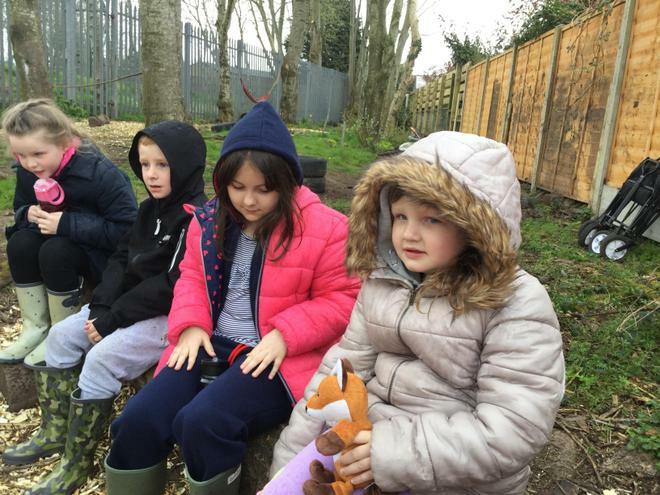 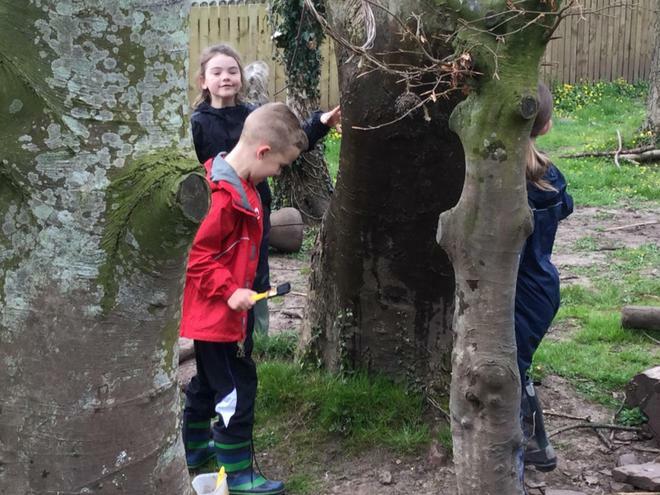 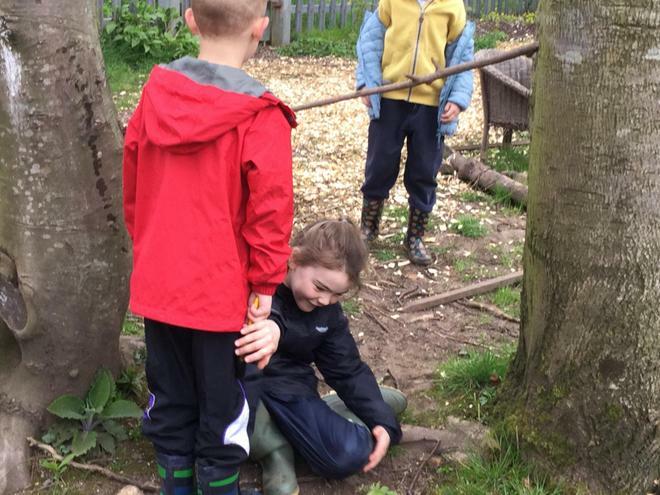 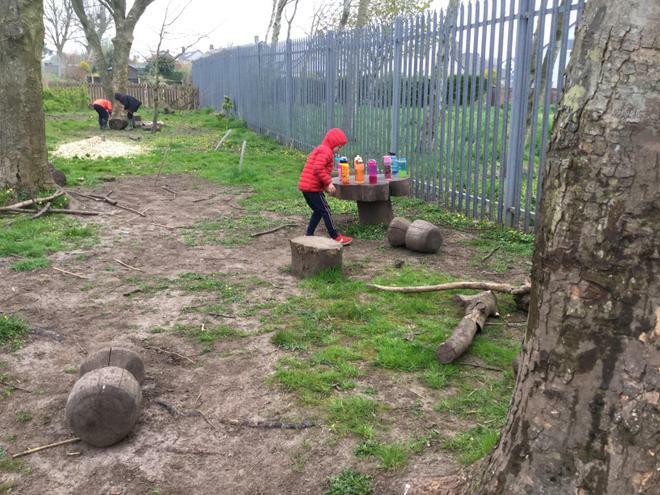 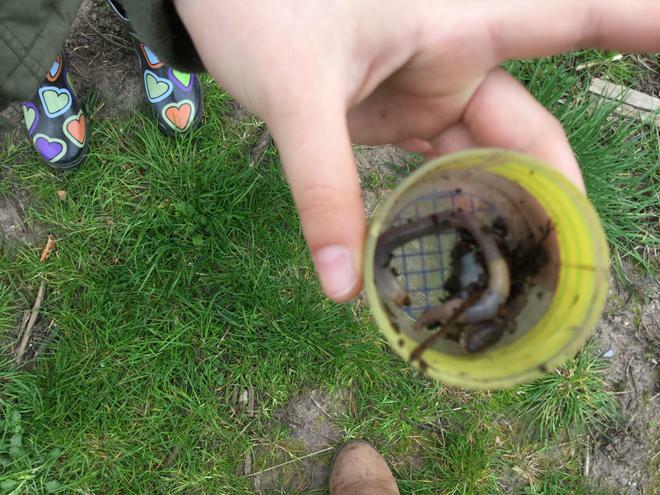 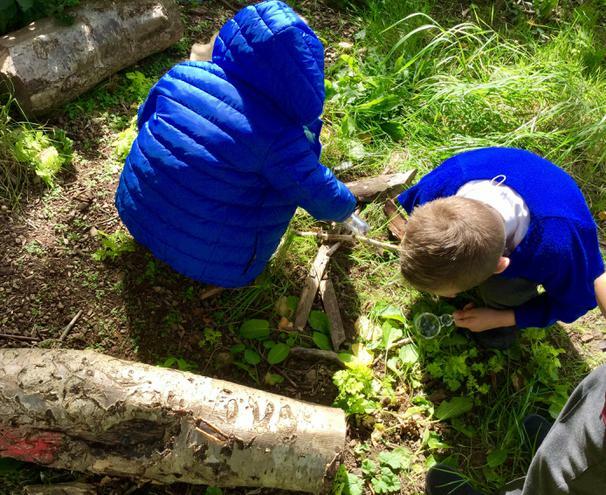 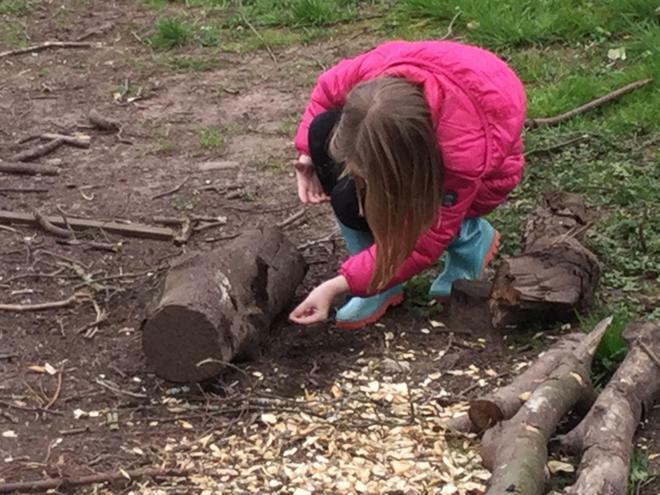 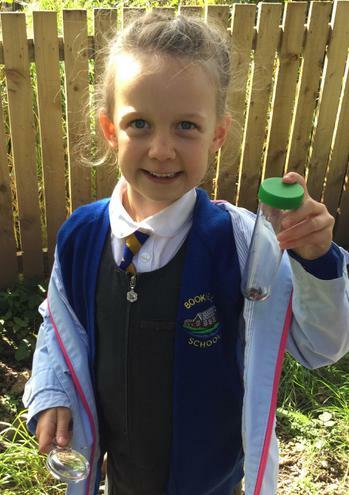 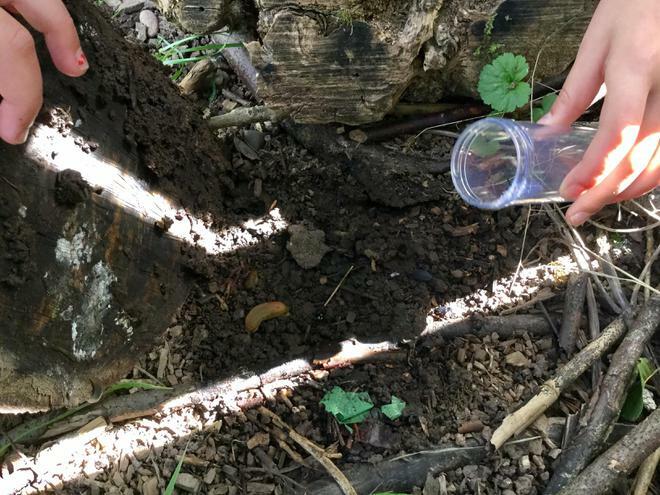 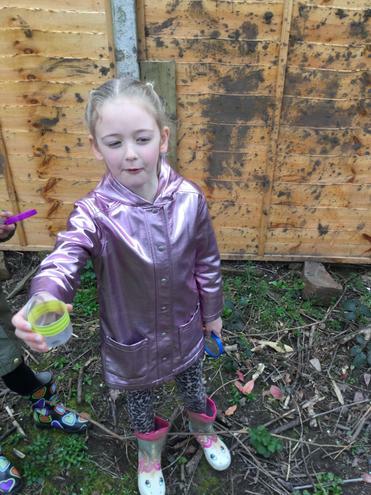 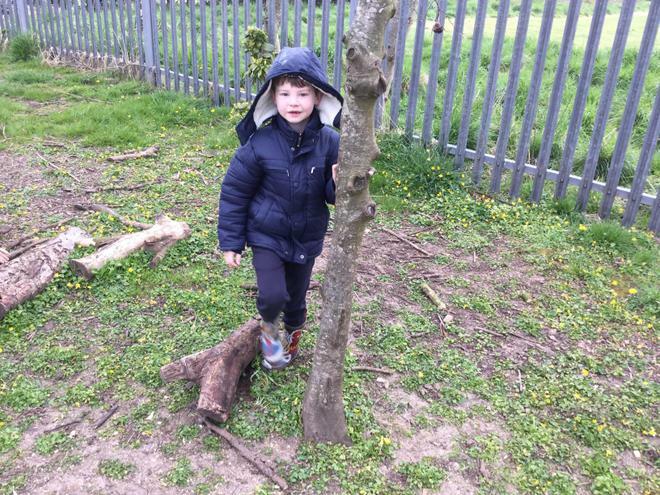 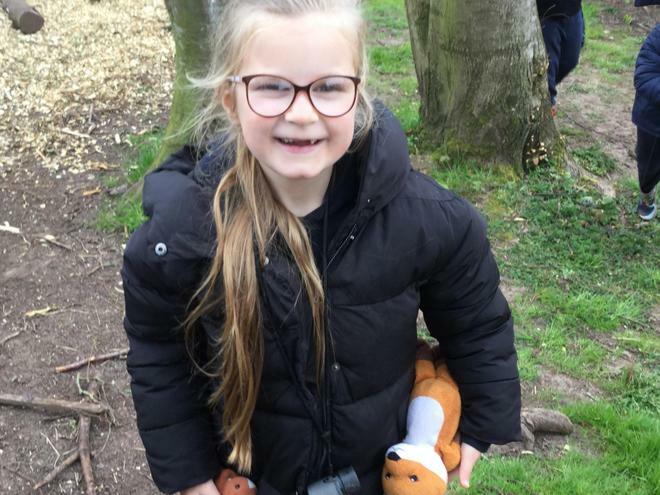 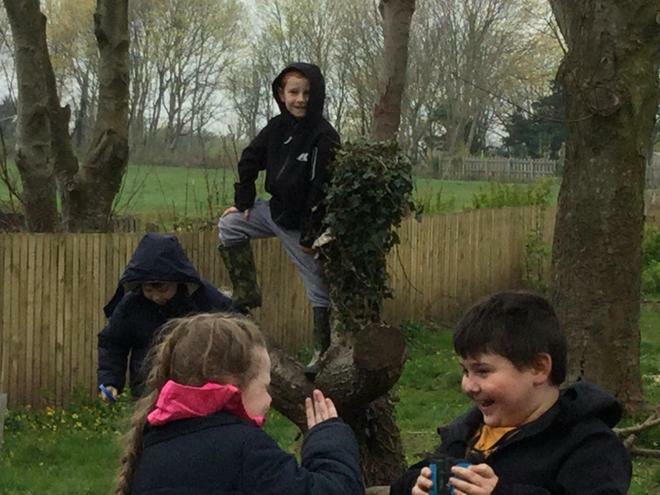 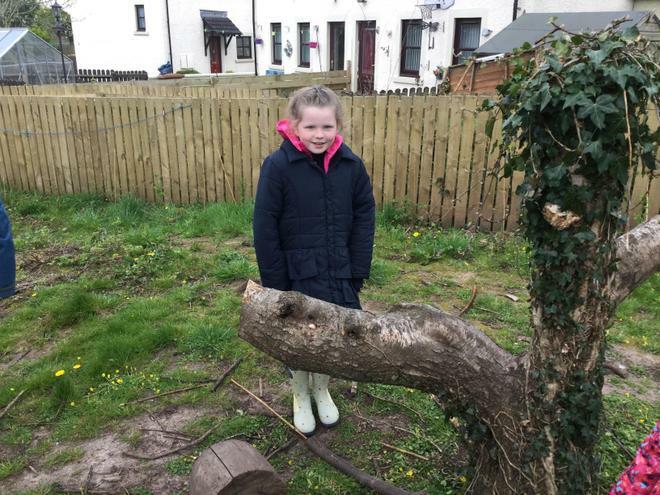 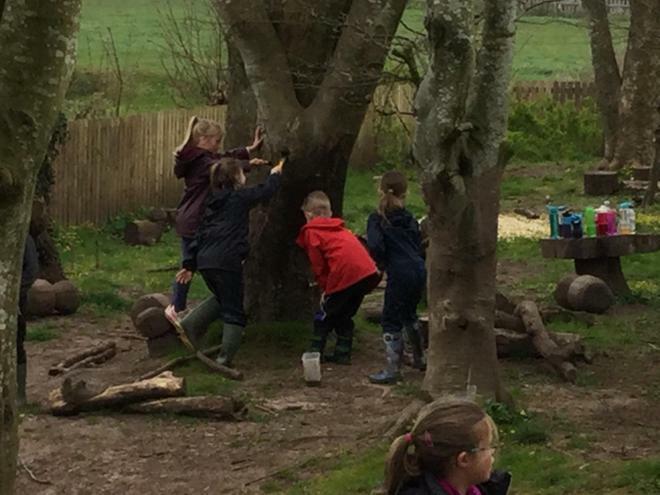 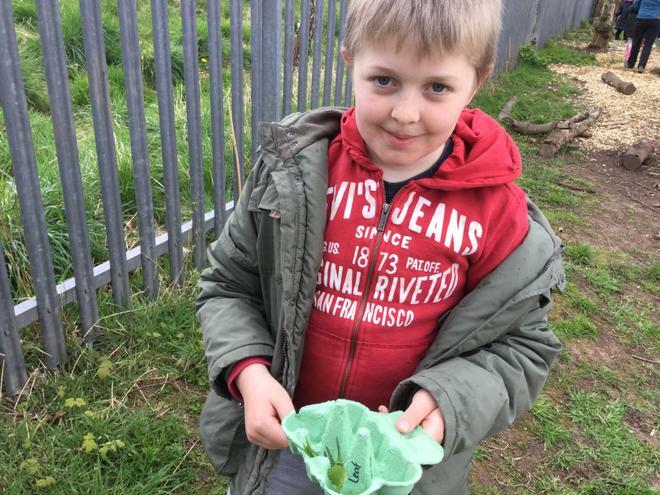 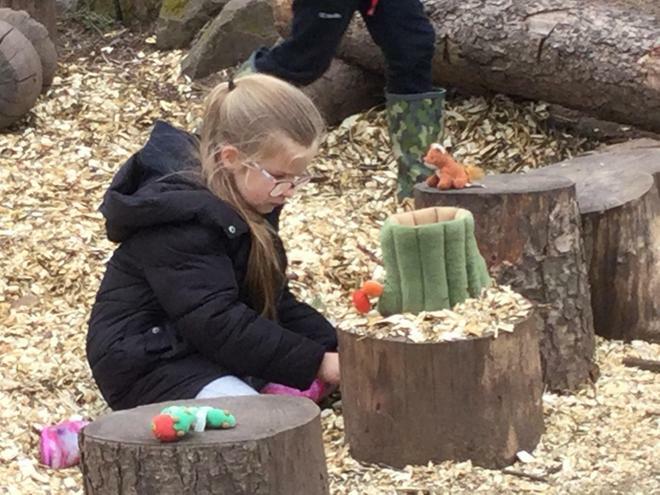 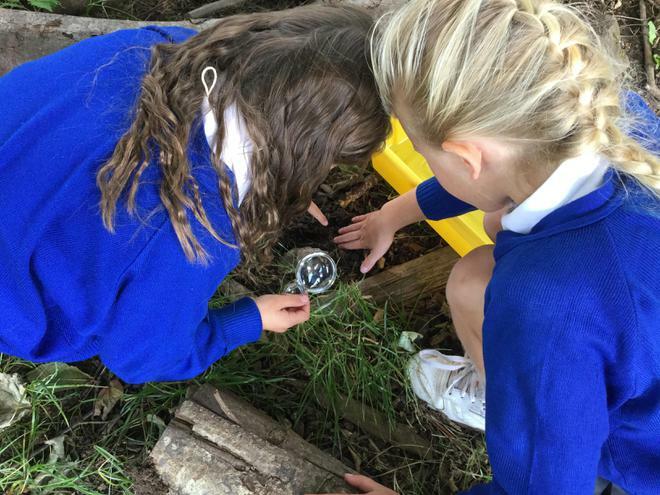 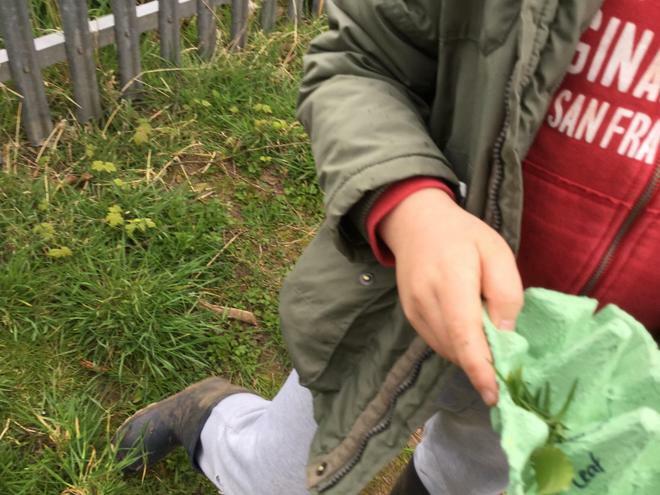 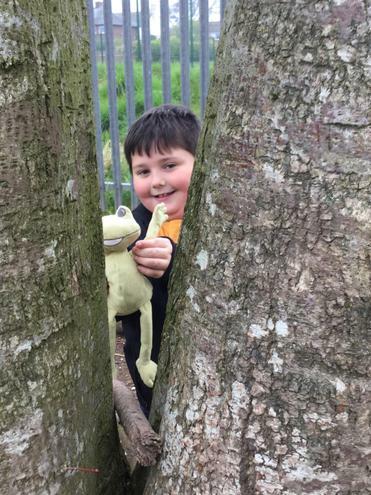 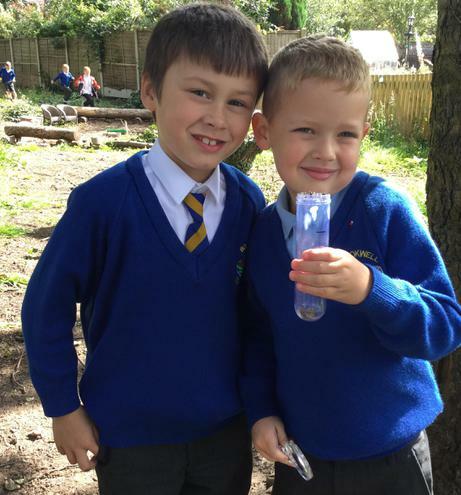 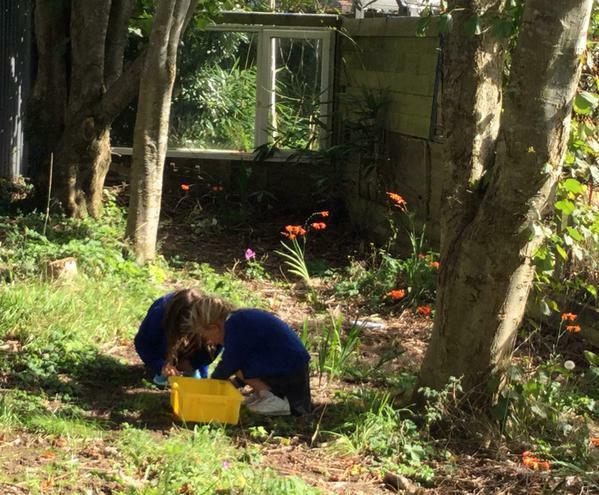 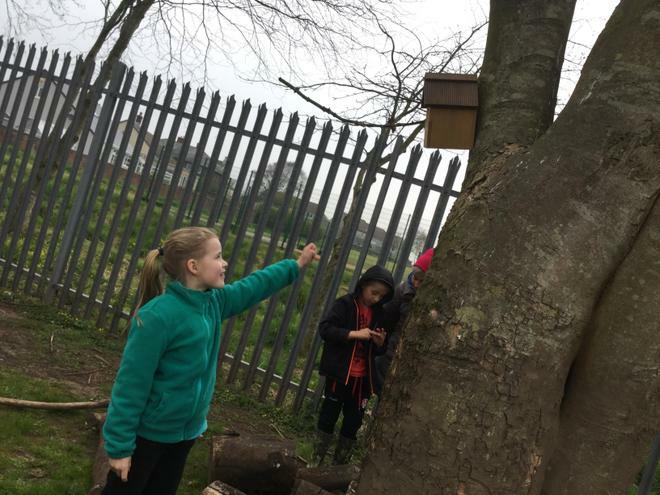 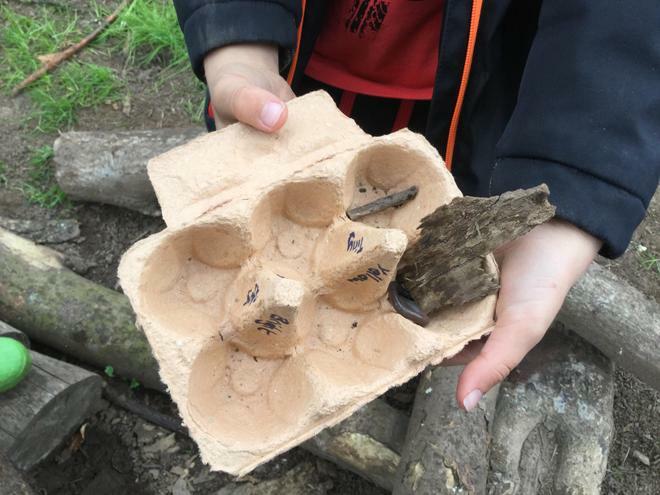 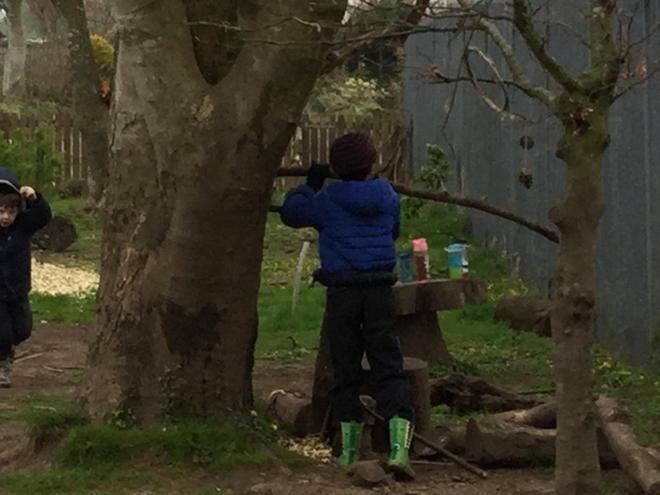 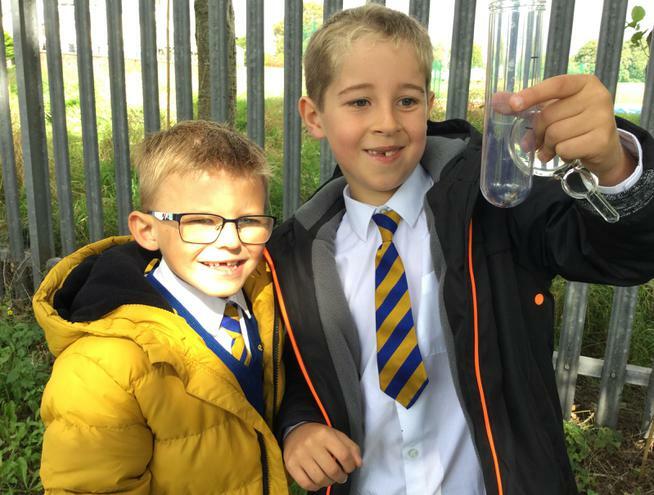 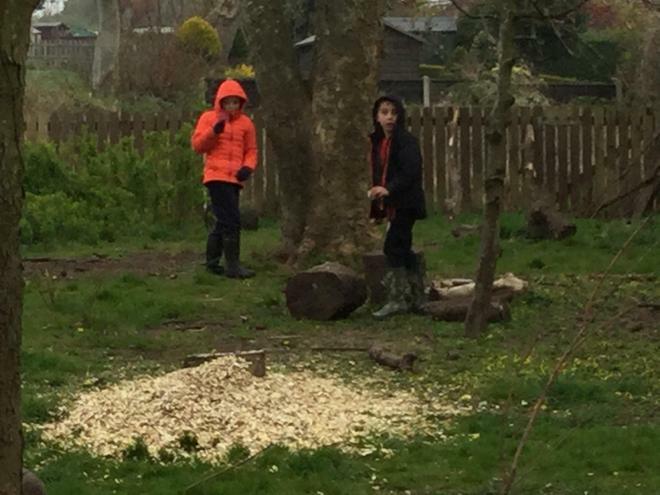 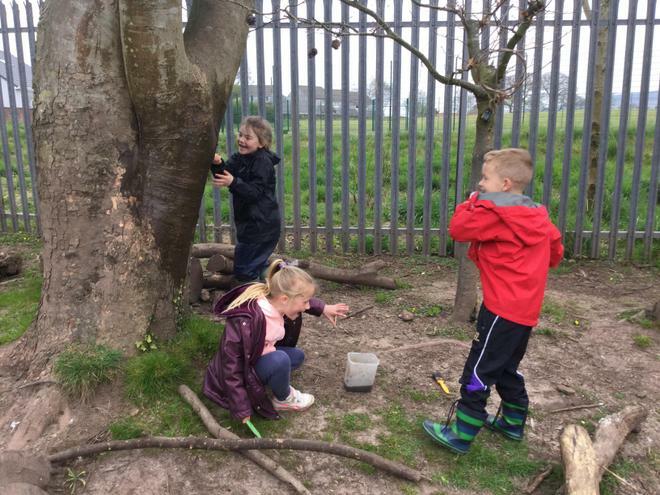 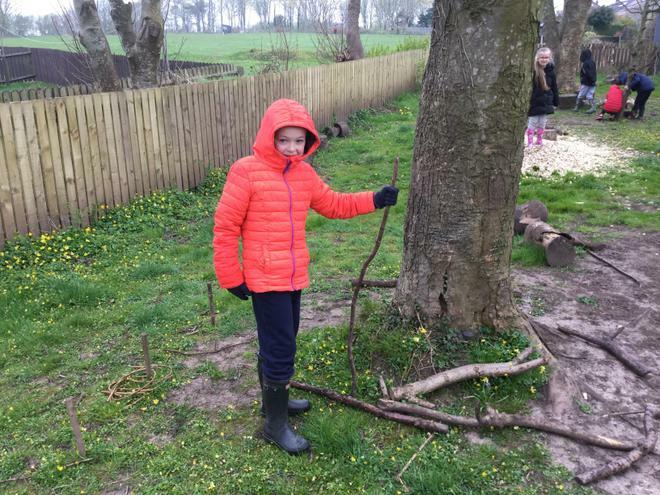 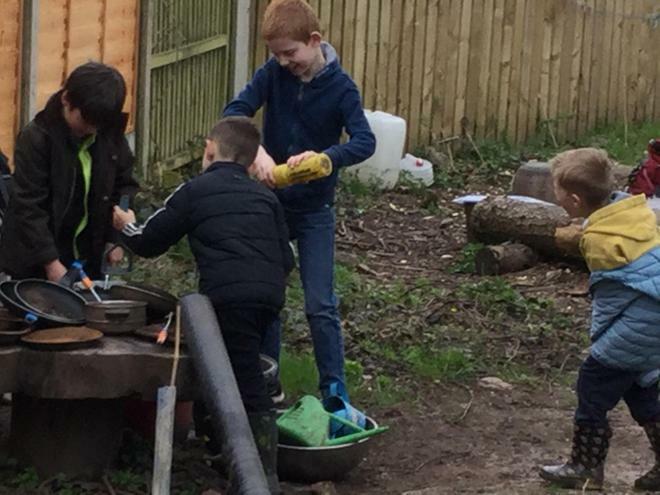 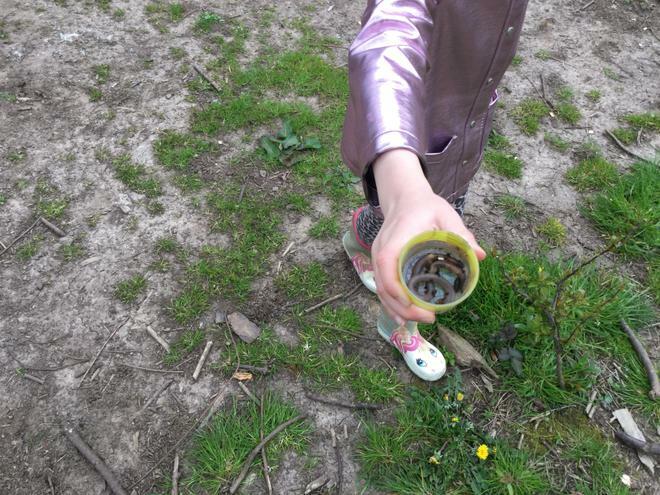 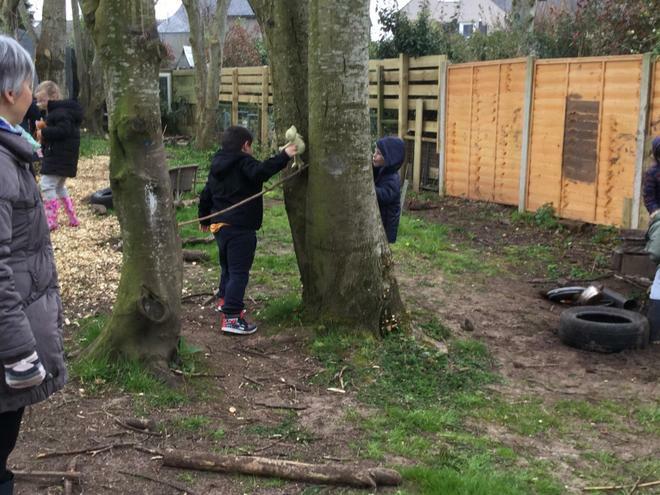 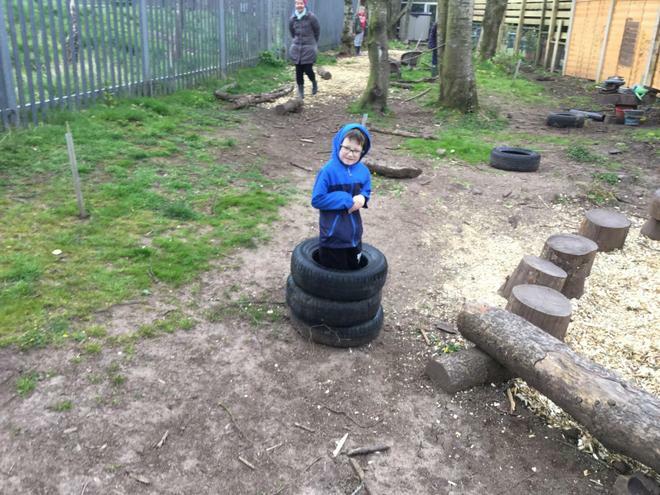 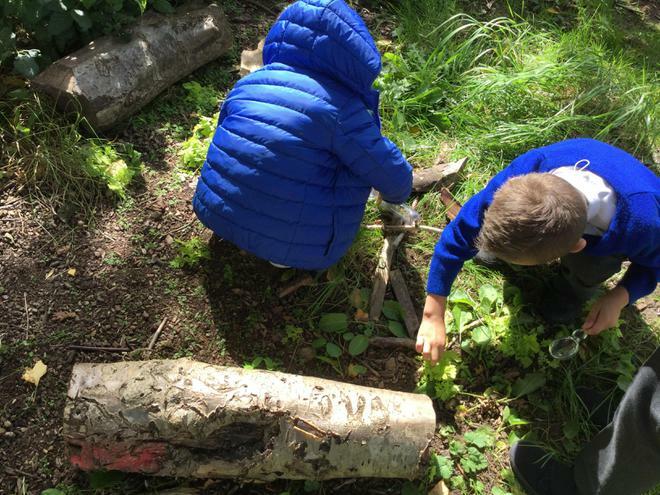 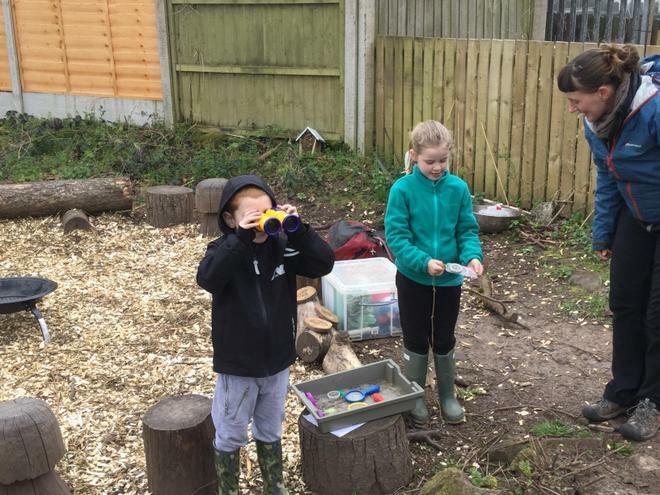 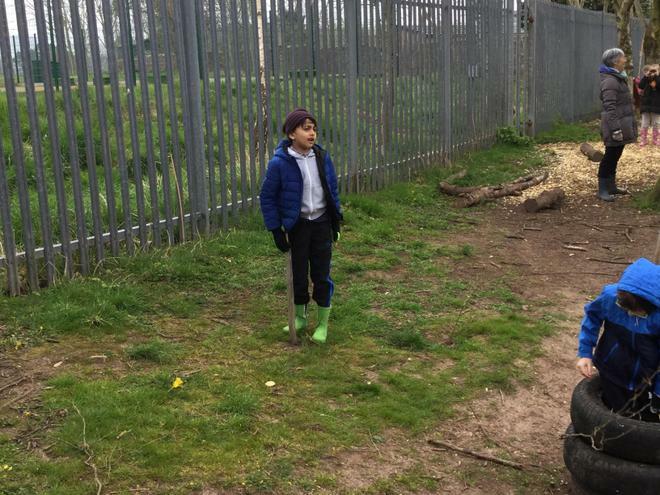 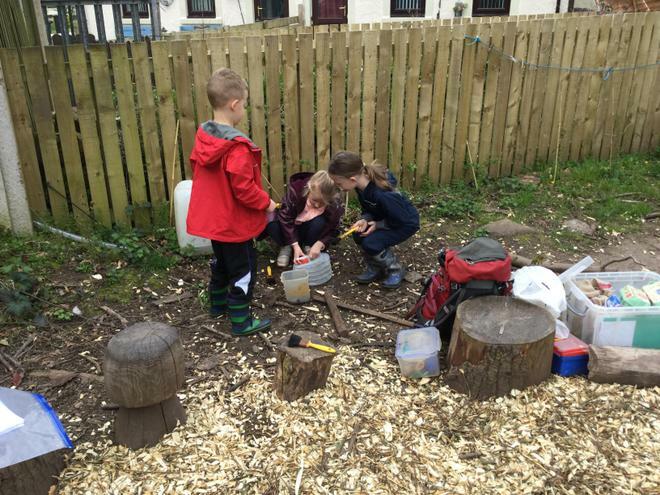 This afternoon we headed up to the woodland to hunt for minibeasts as part of our 'Living Things' topic in Science. 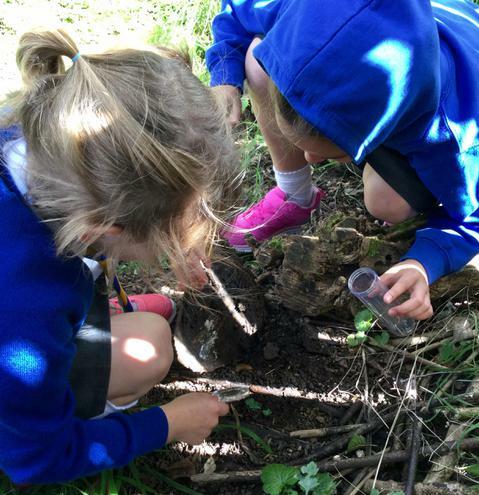 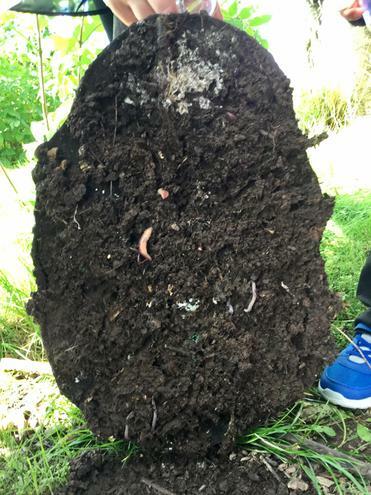 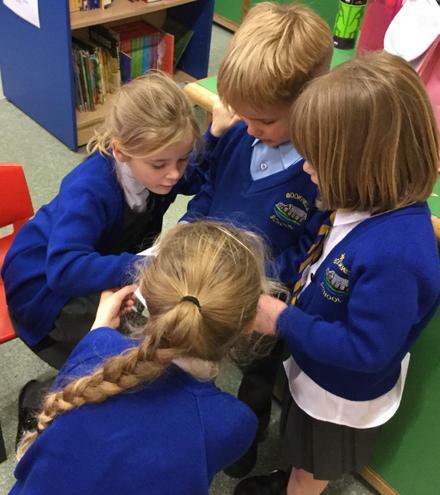 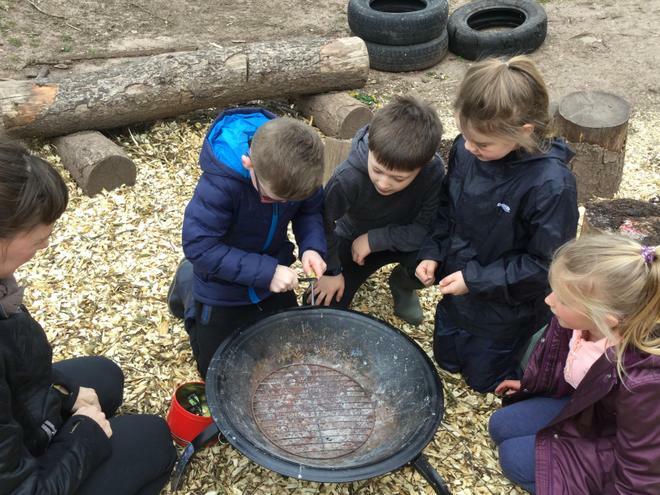 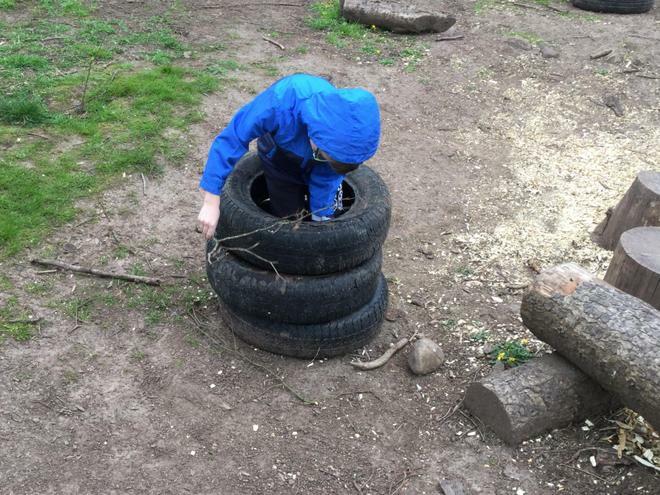 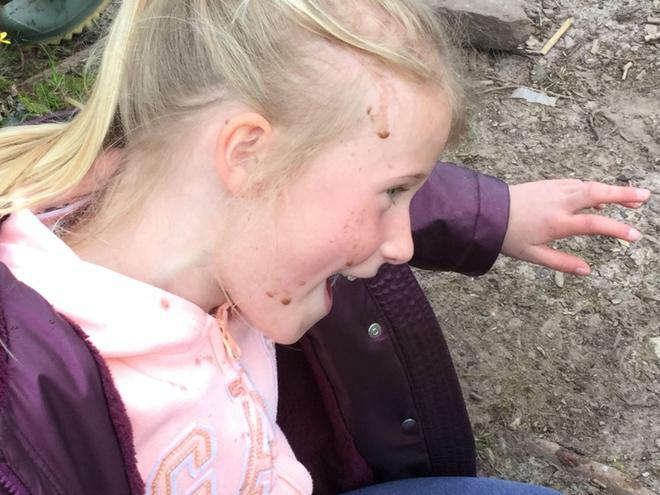 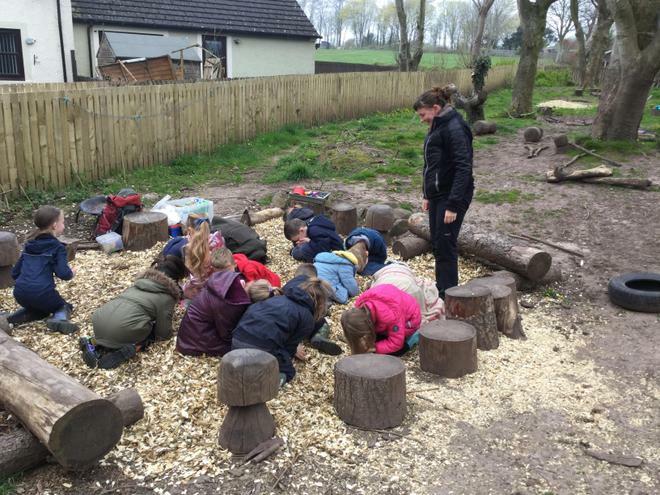 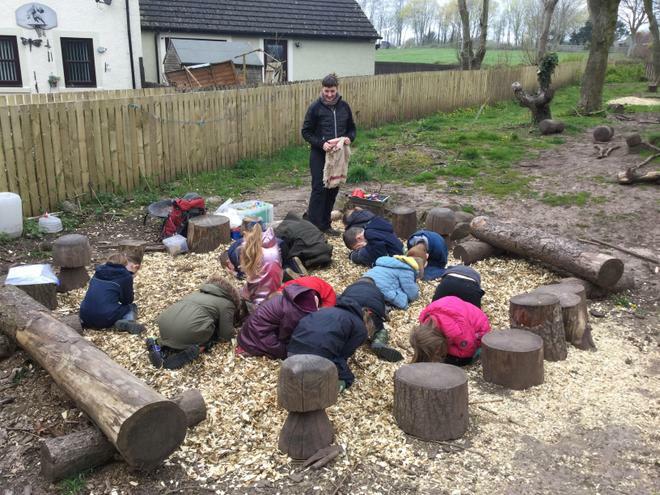 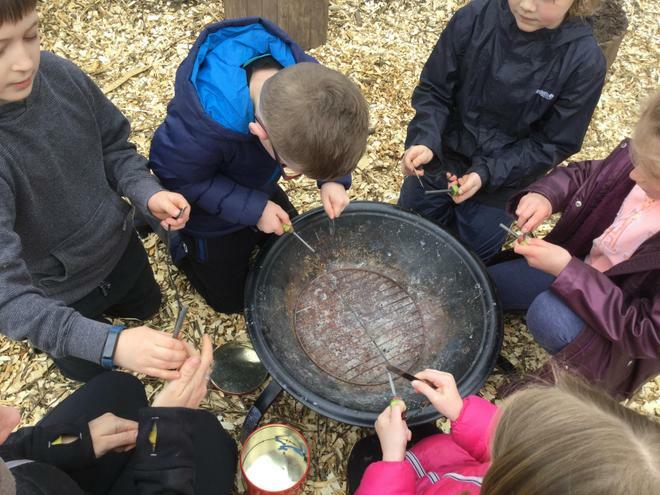 We looked carefully beneath logs, stones and leaves and discovered lots of different creatures including spiders! 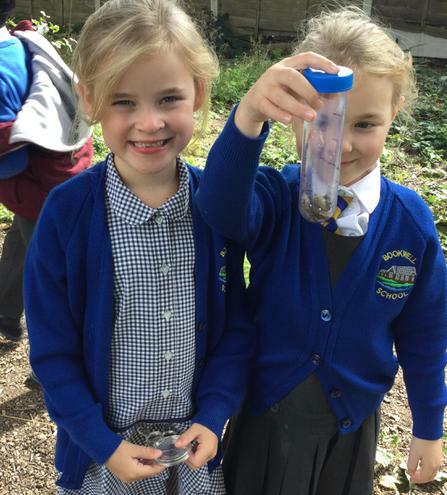 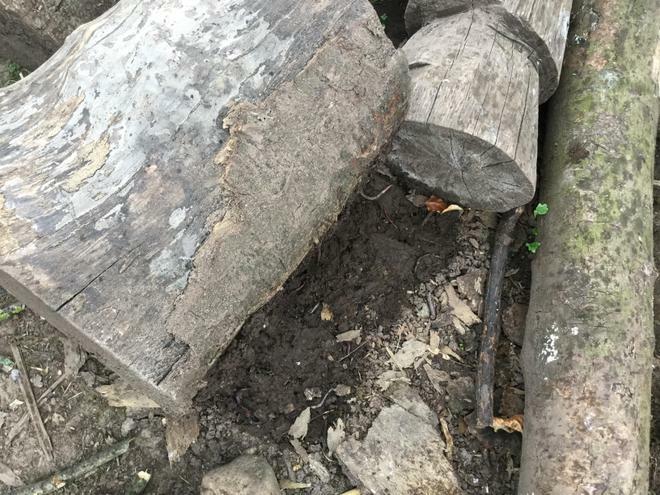 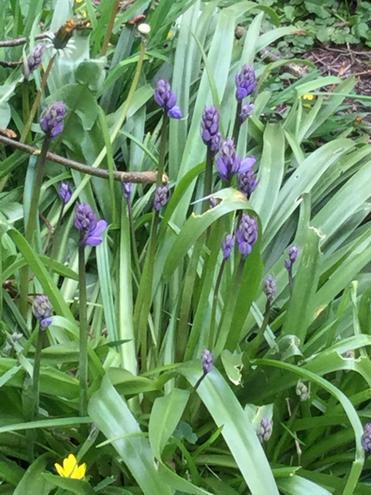 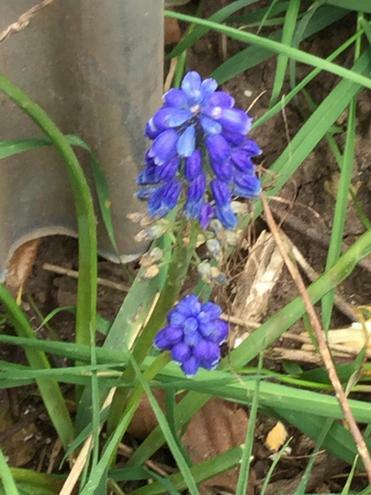 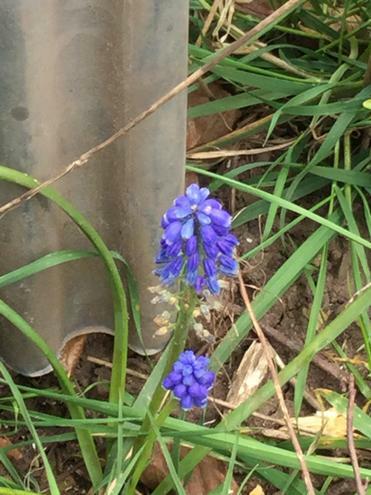 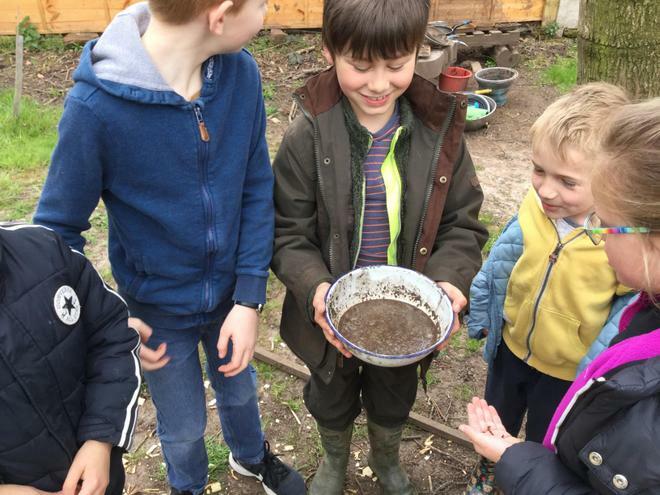 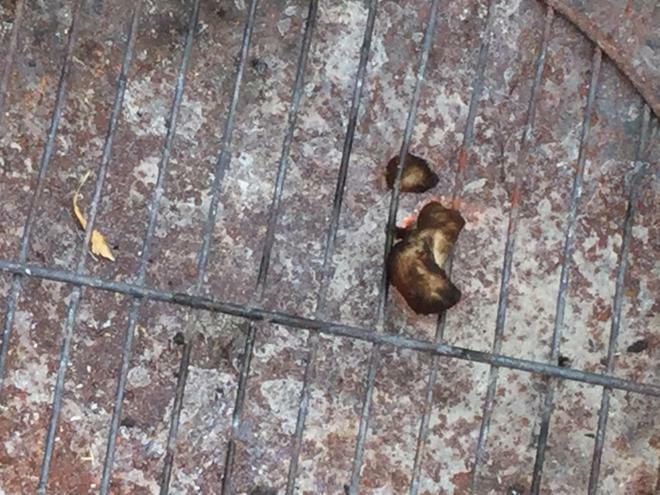 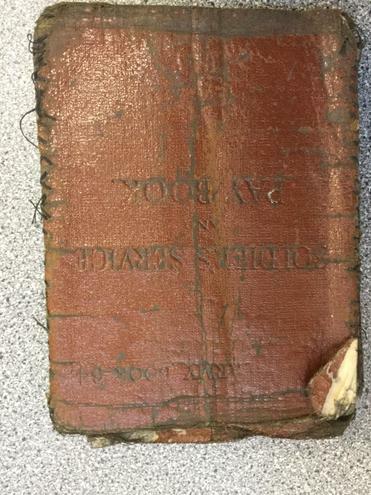 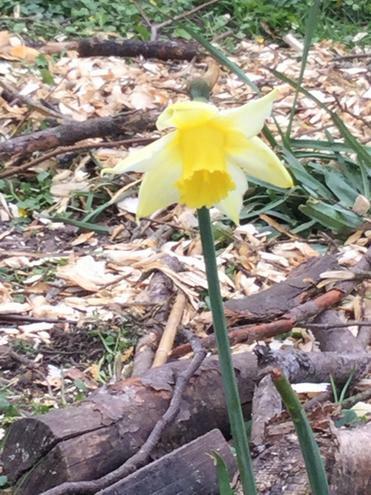 Take a look at what we found!